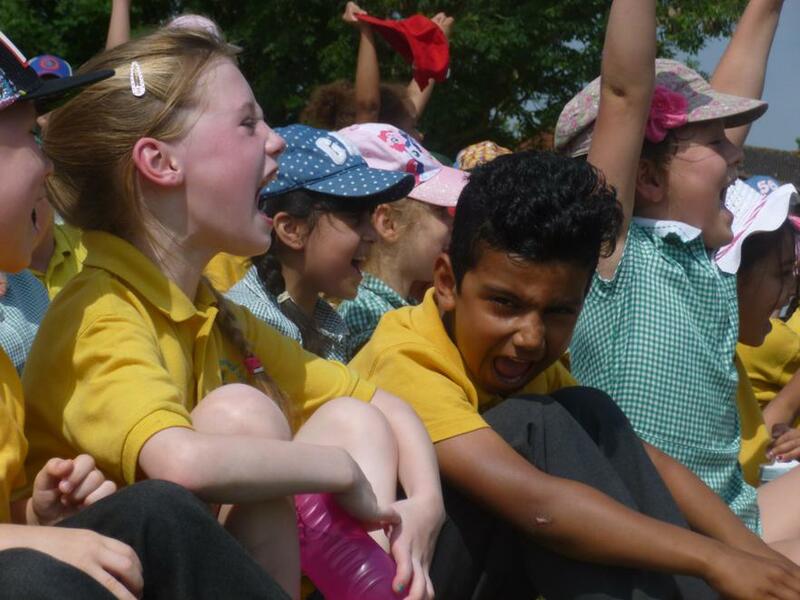 We have had a very exciting term so far! 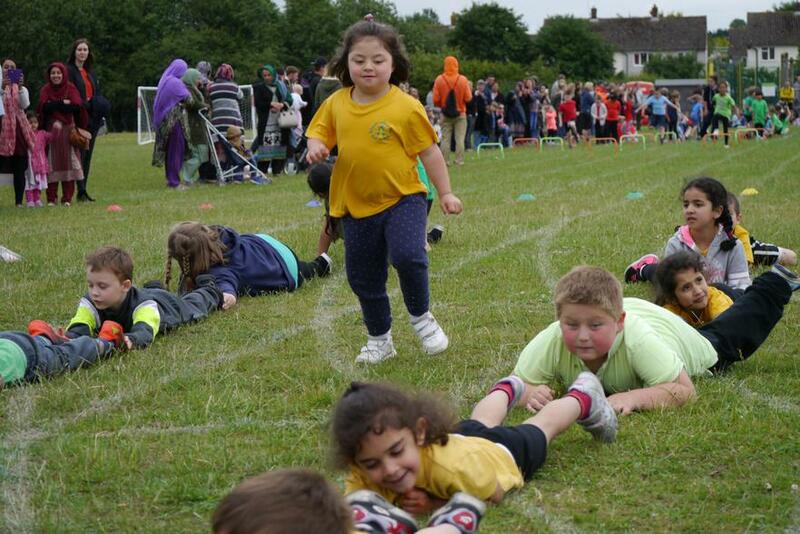 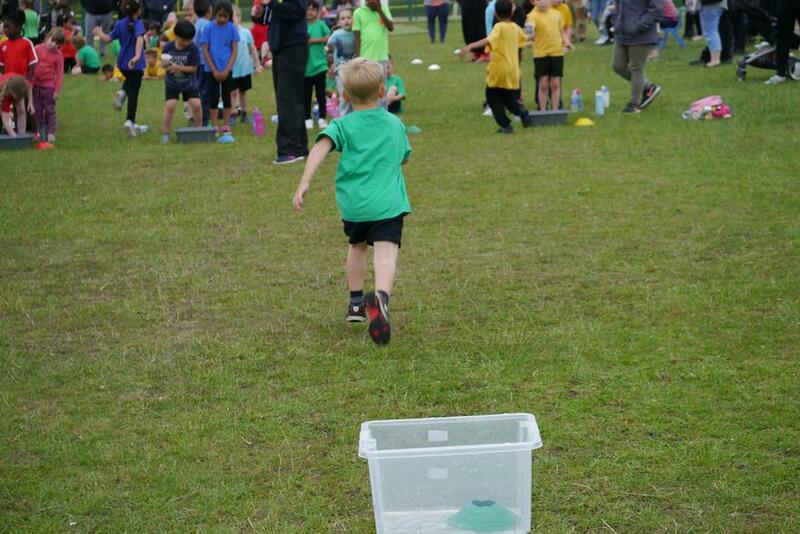 Thank you for coming to Sports Day! 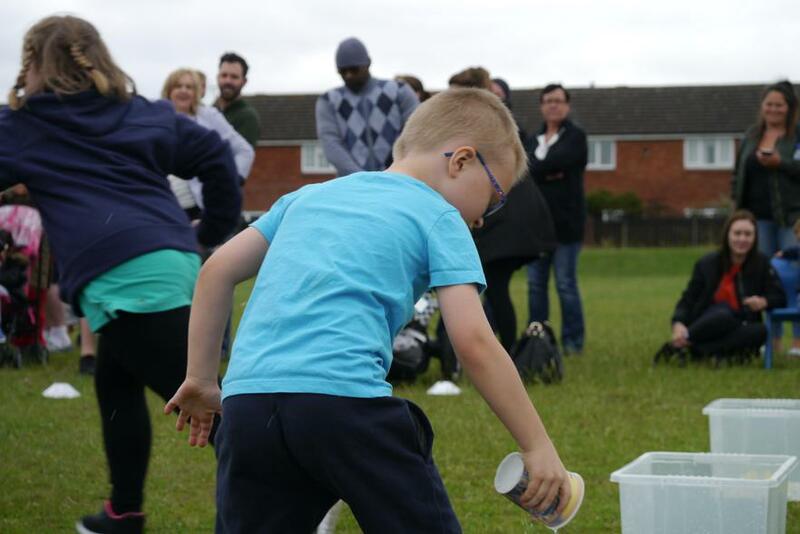 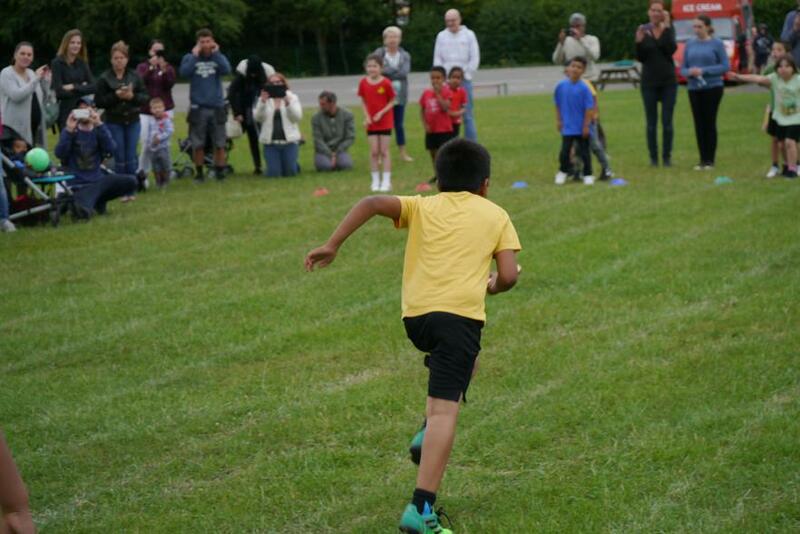 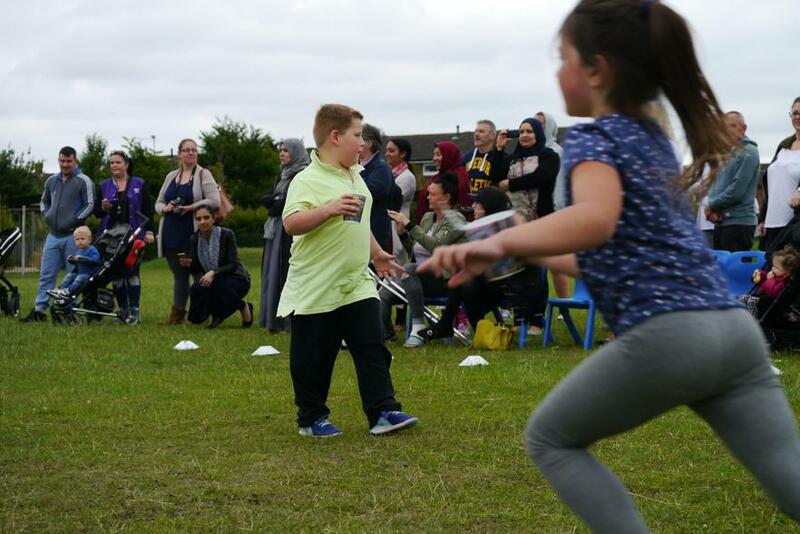 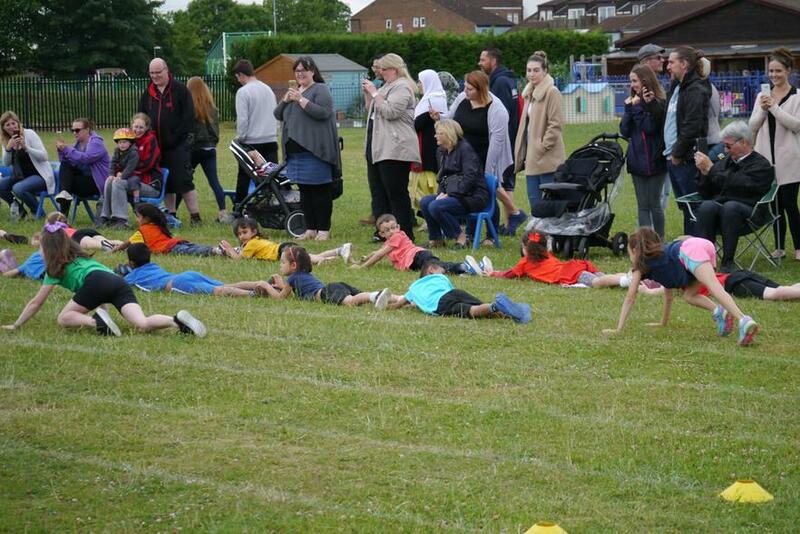 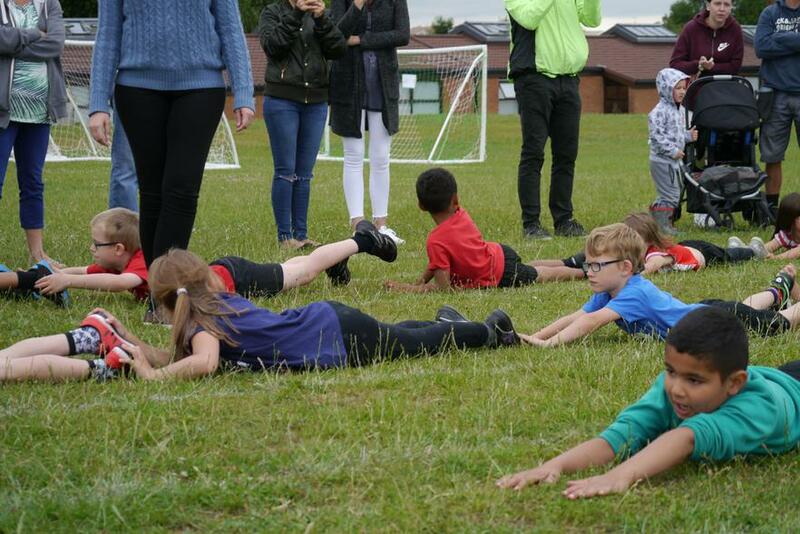 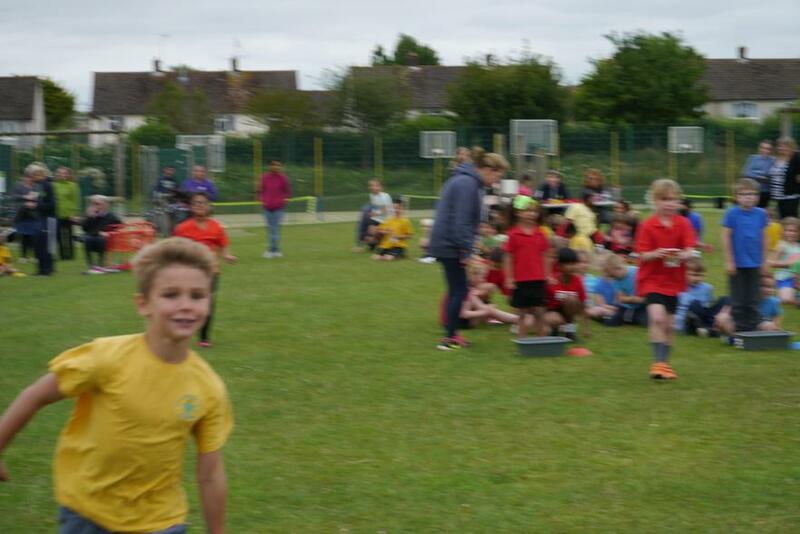 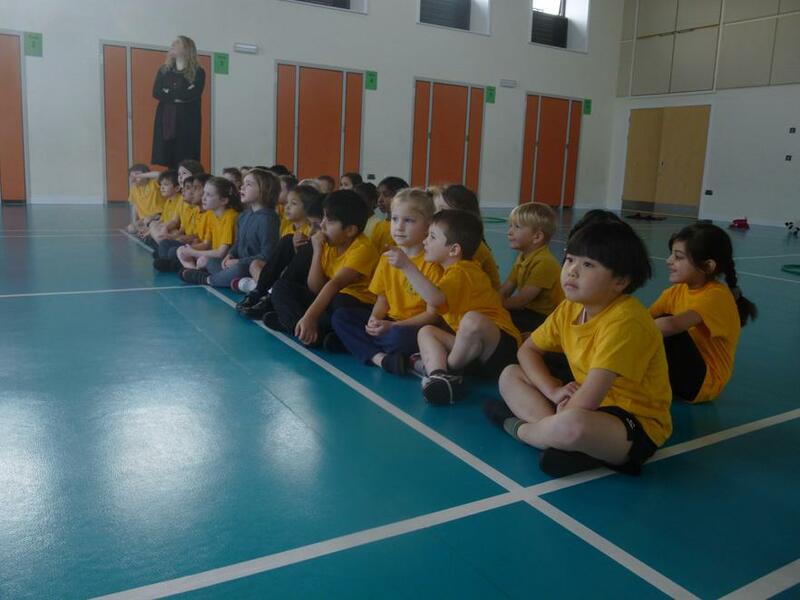 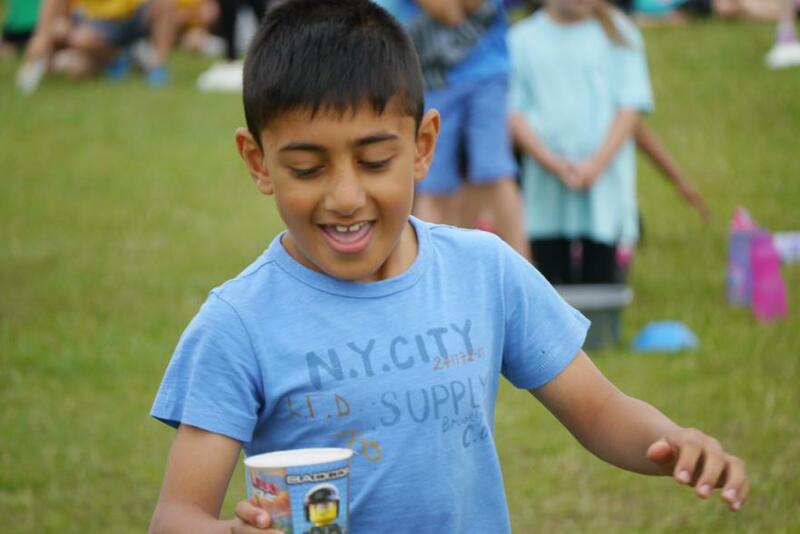 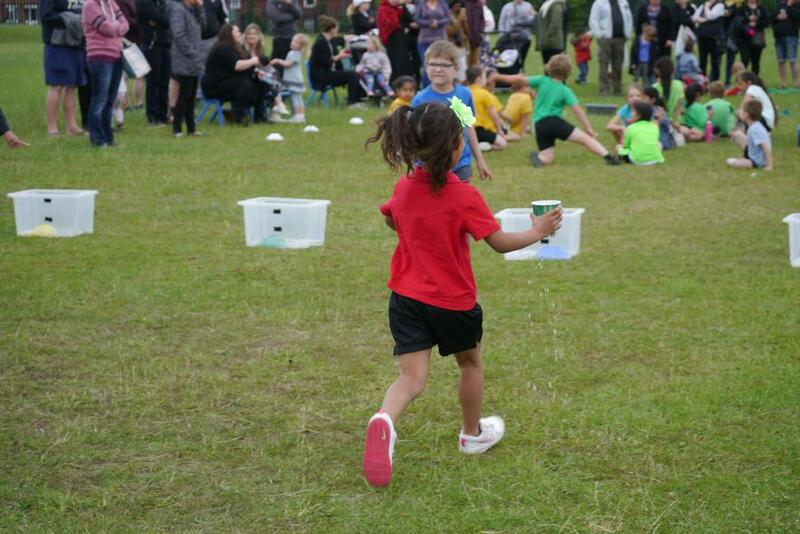 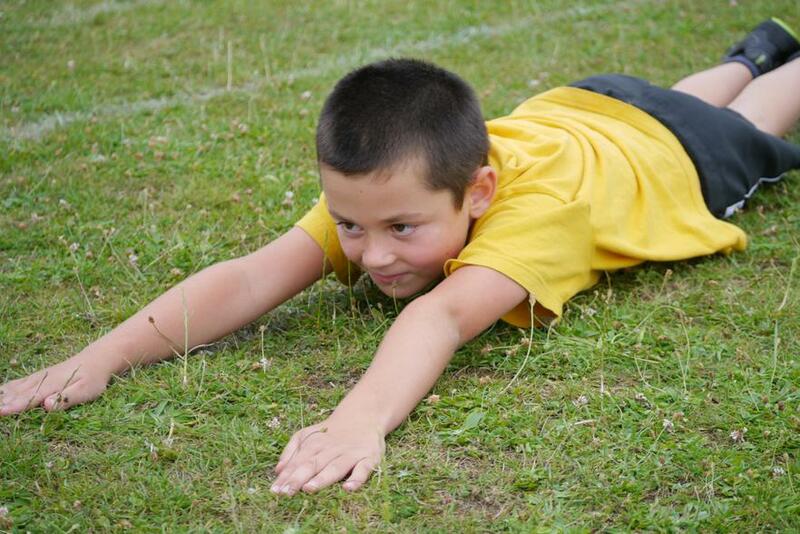 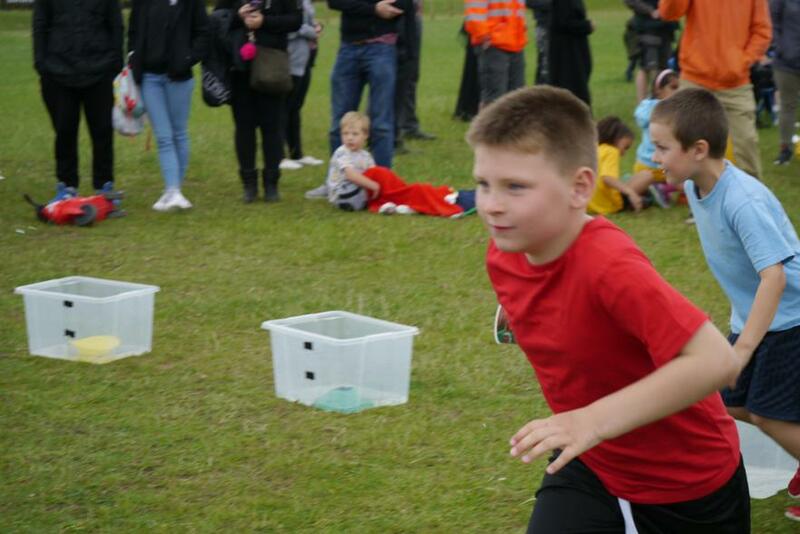 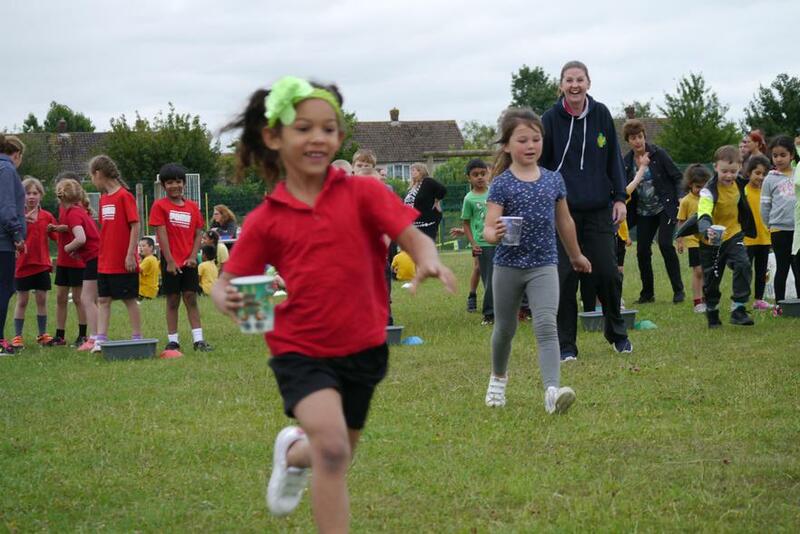 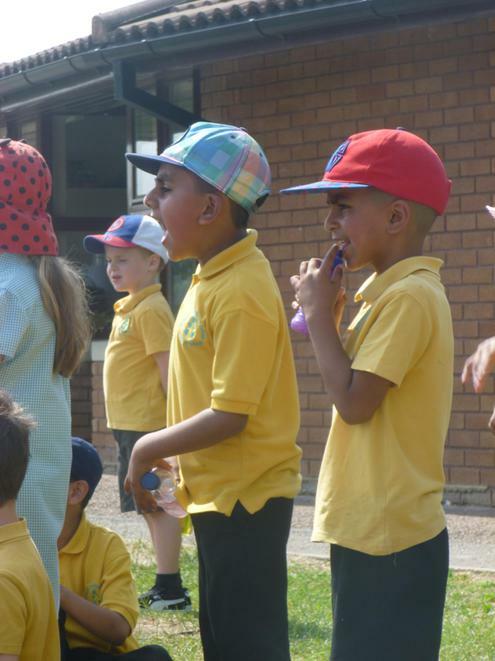 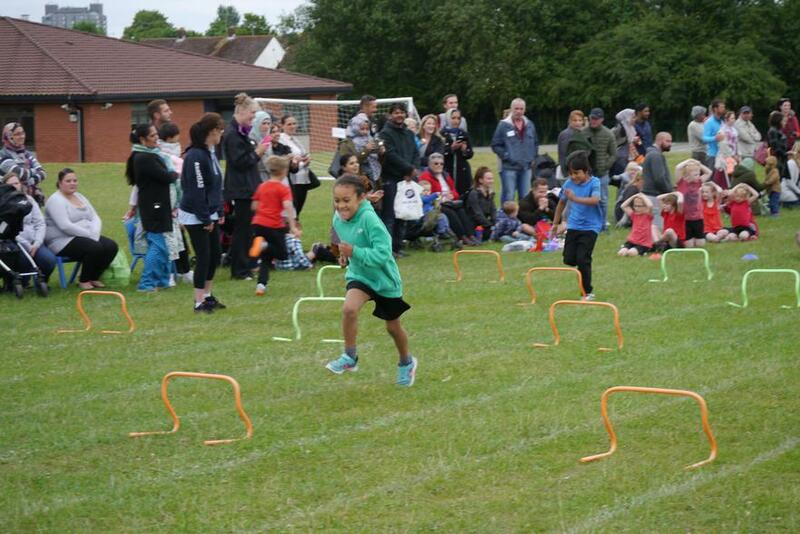 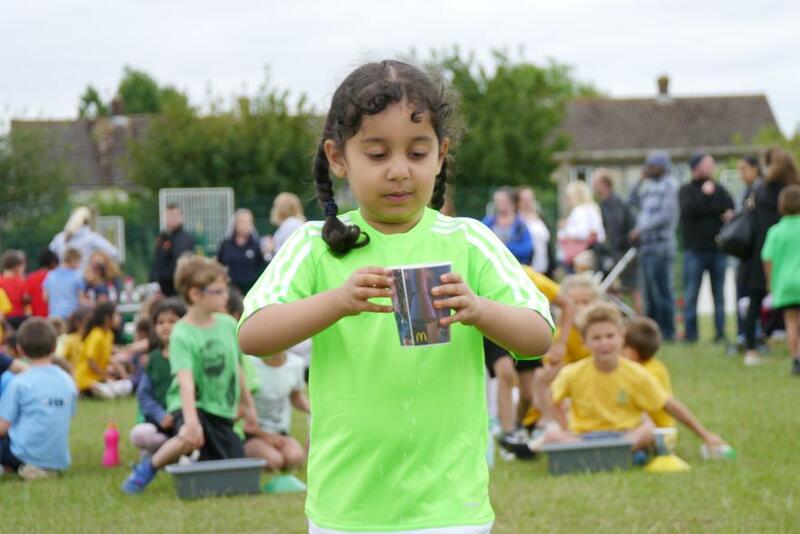 Your children behaved and performed with great determination and sportsmanship and clearly enjoyed every minute of sports day. 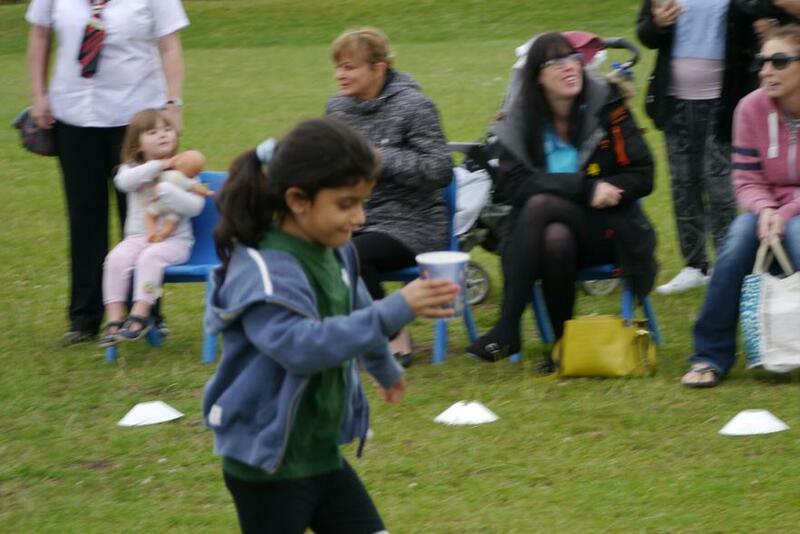 It was great to hear cheering for their friends, clapping for other teams and high fives to congratulate each other. 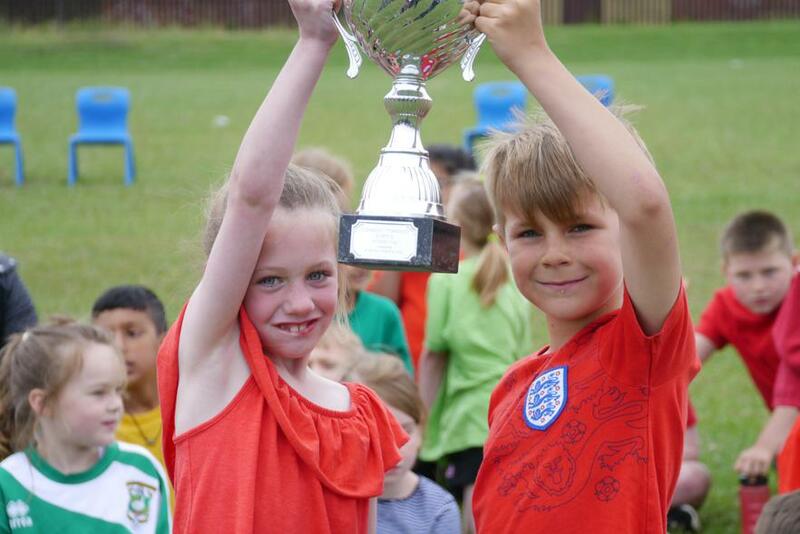 The overall winners were Falcons - well done! 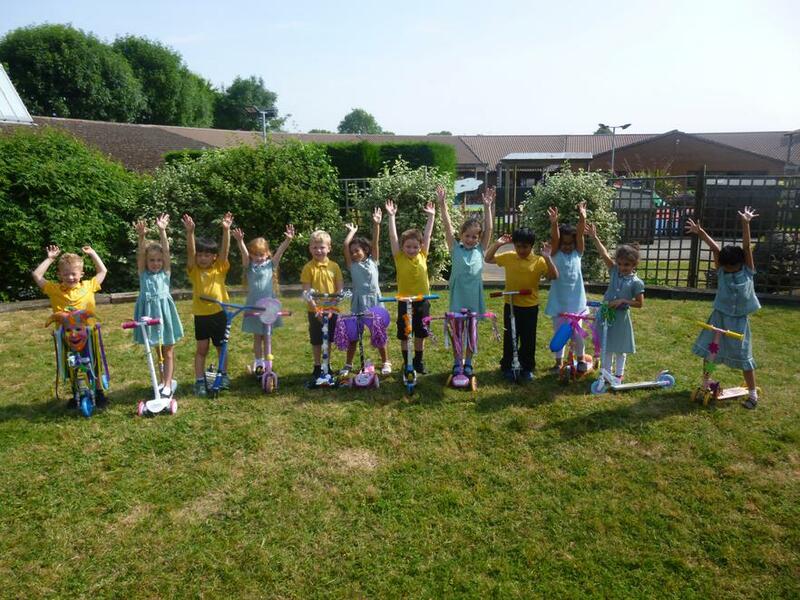 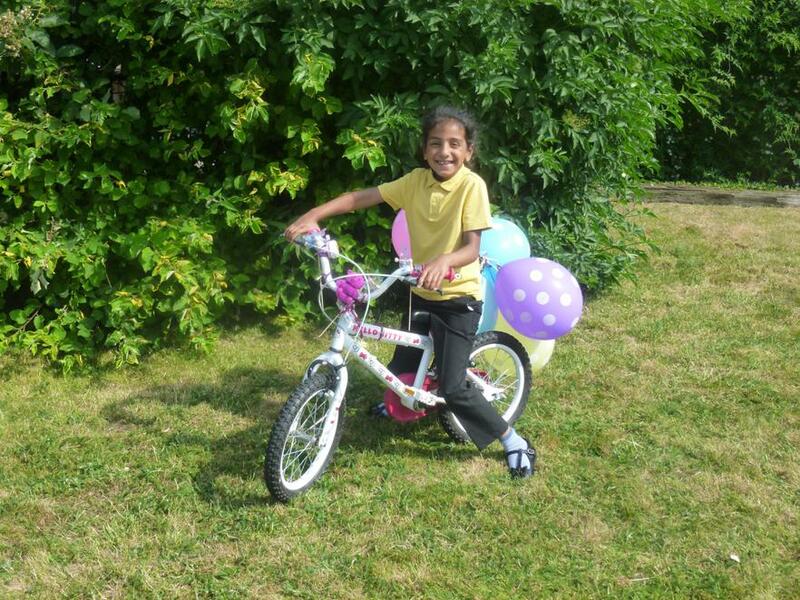 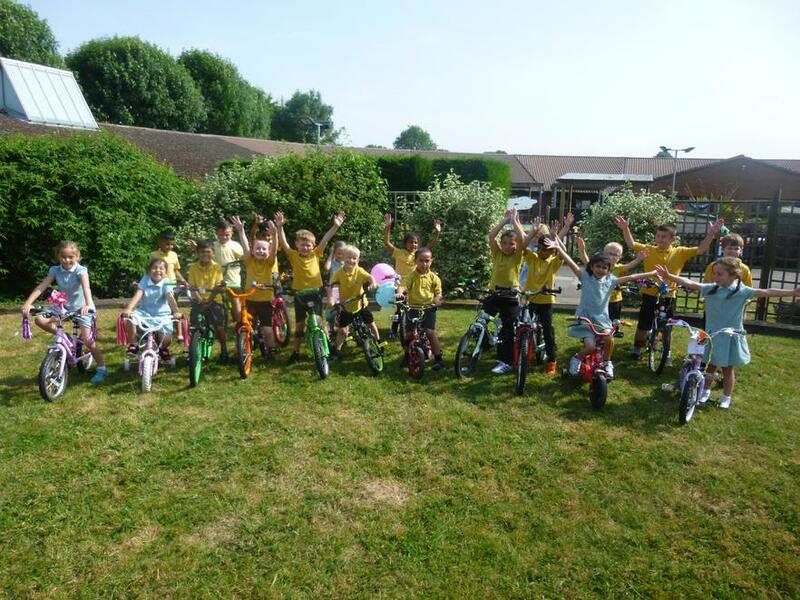 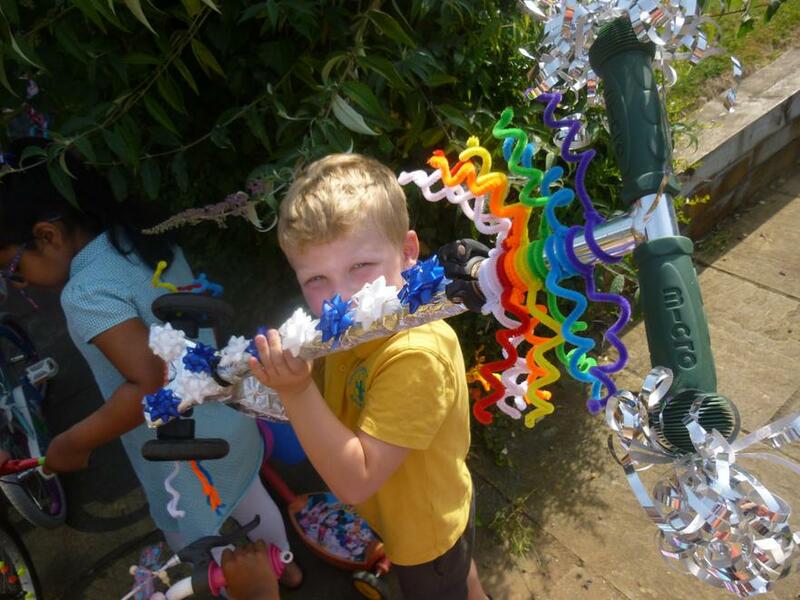 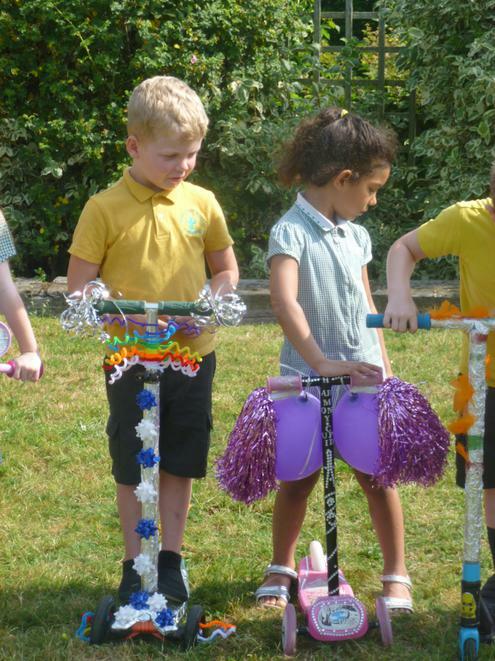 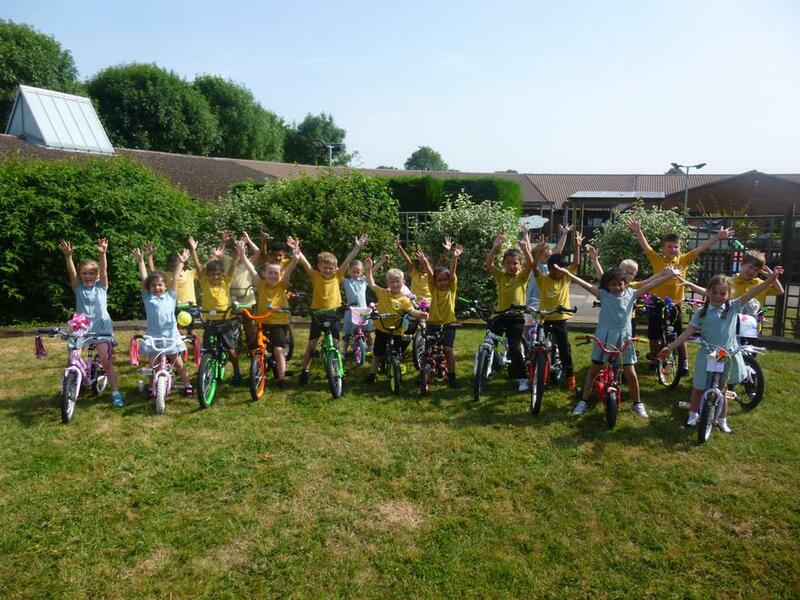 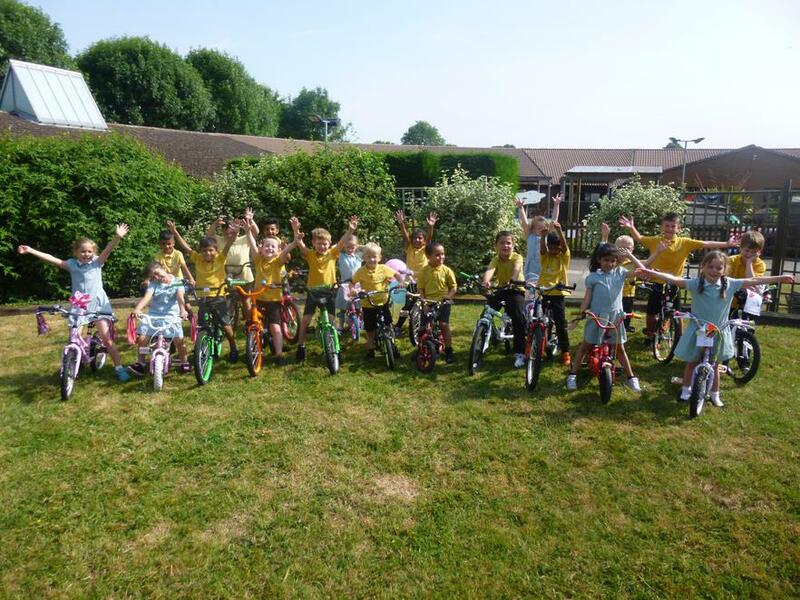 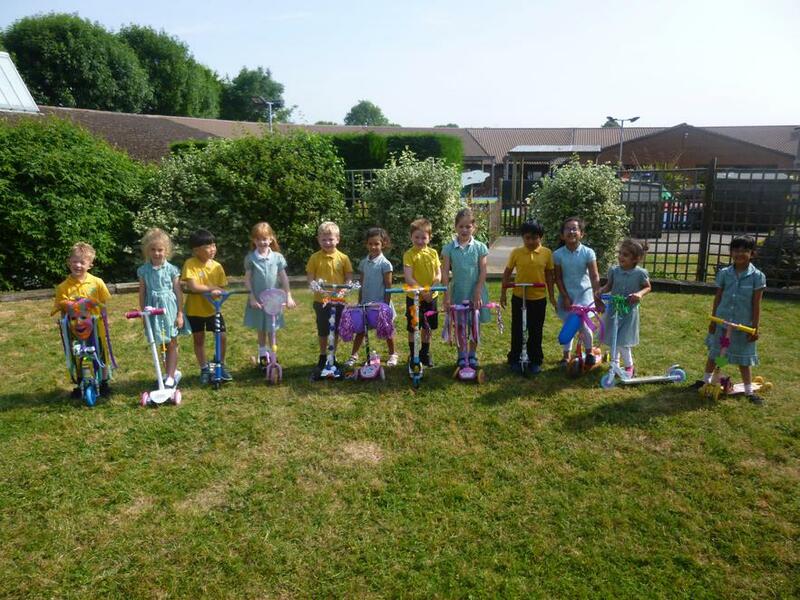 On Wednesday 21st June, the children decorated their bikes and scooters to celebrate 'Bling your Bike' day. 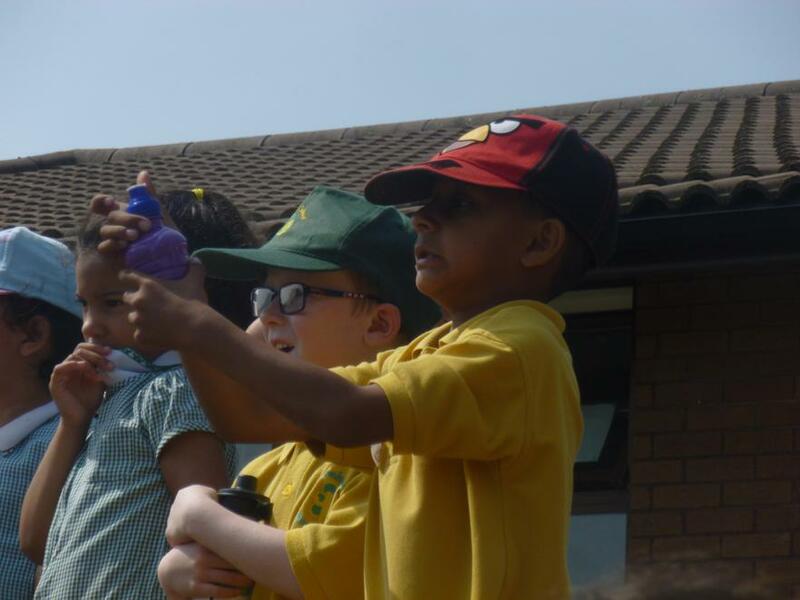 We saw a great display of colour and creativity and the children thoroughly enjoyed showing off their creations to their friends. 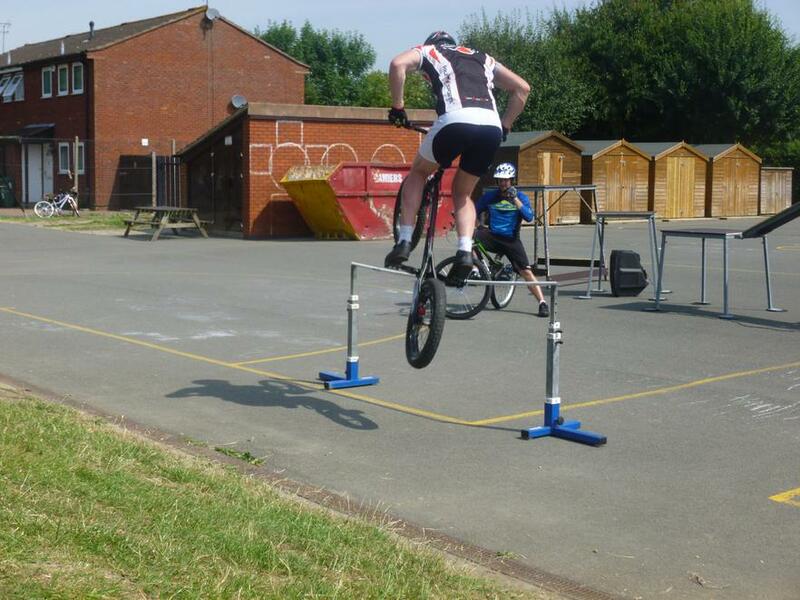 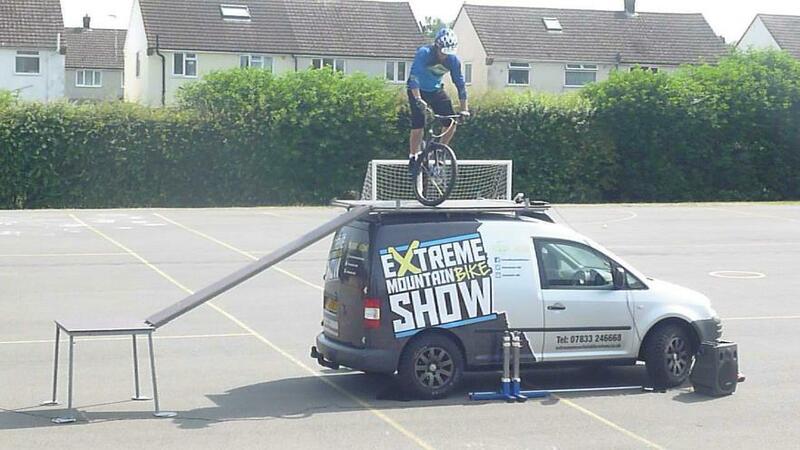 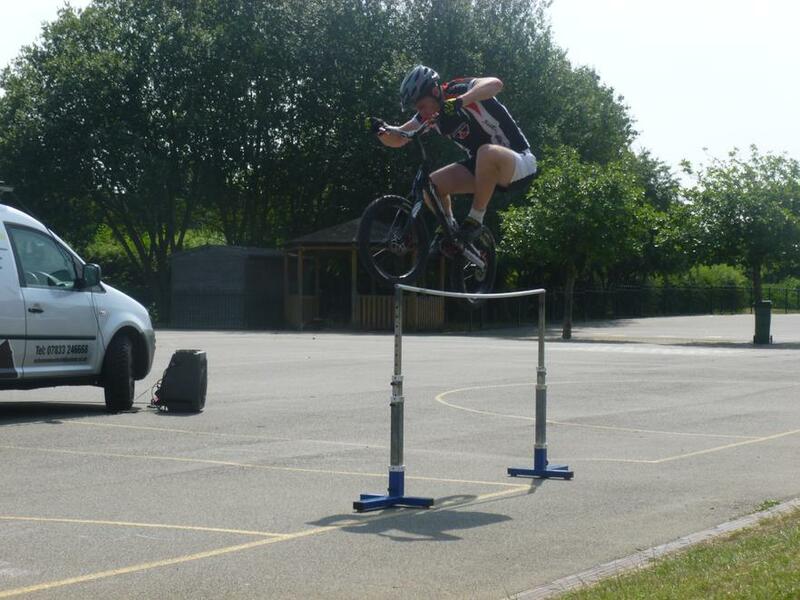 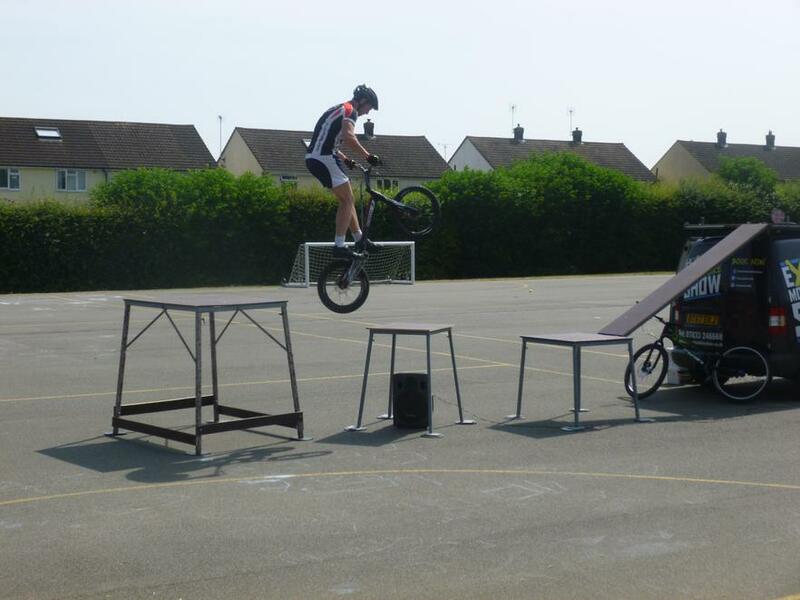 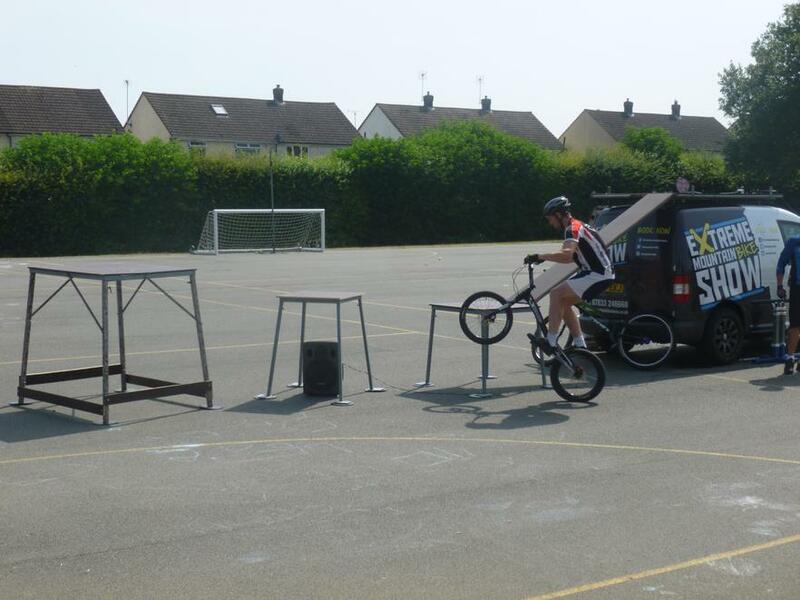 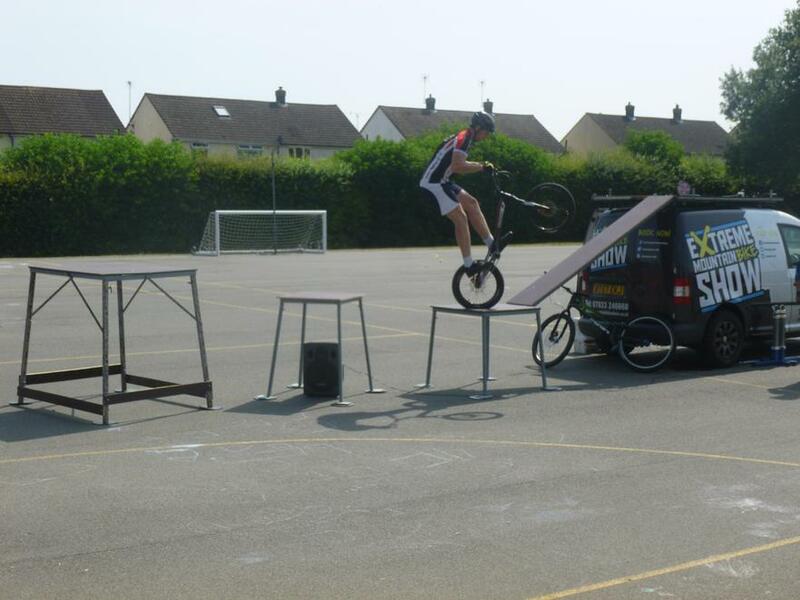 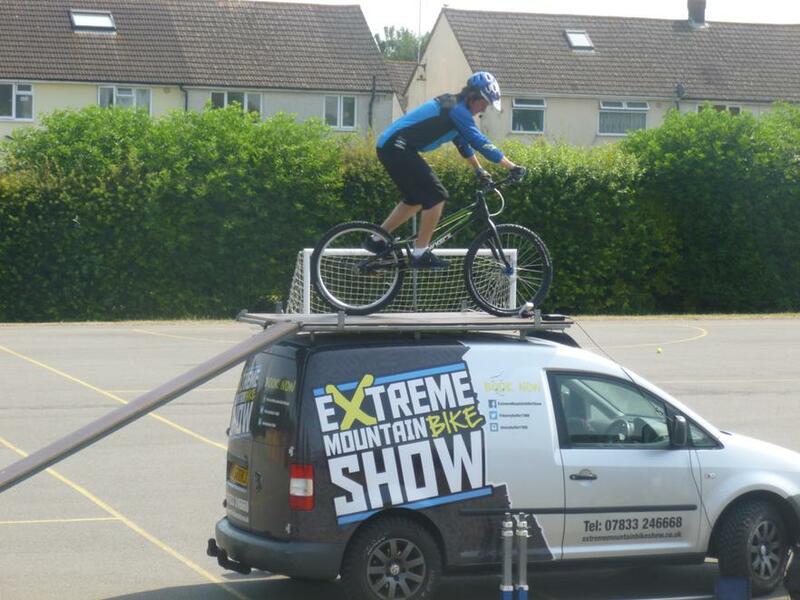 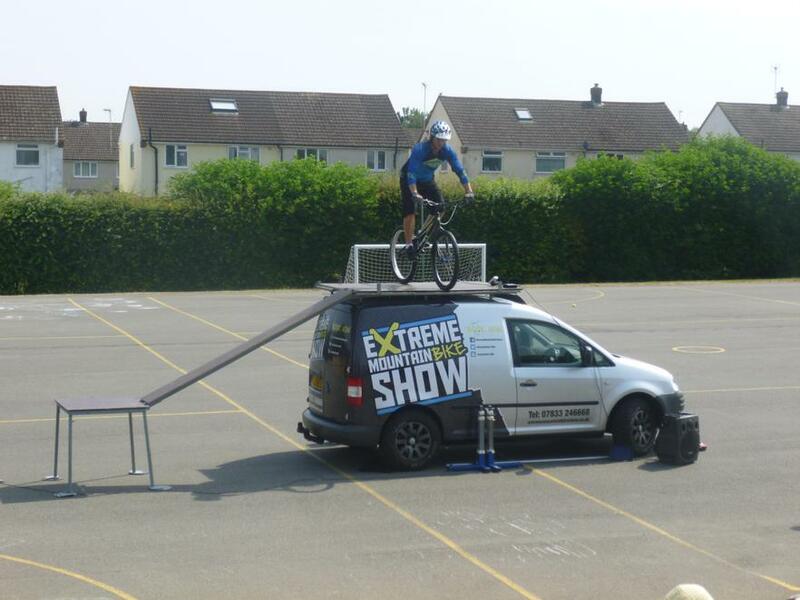 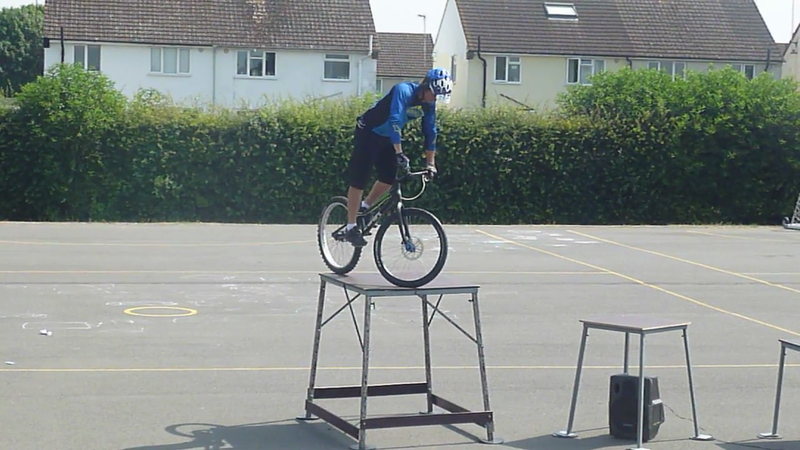 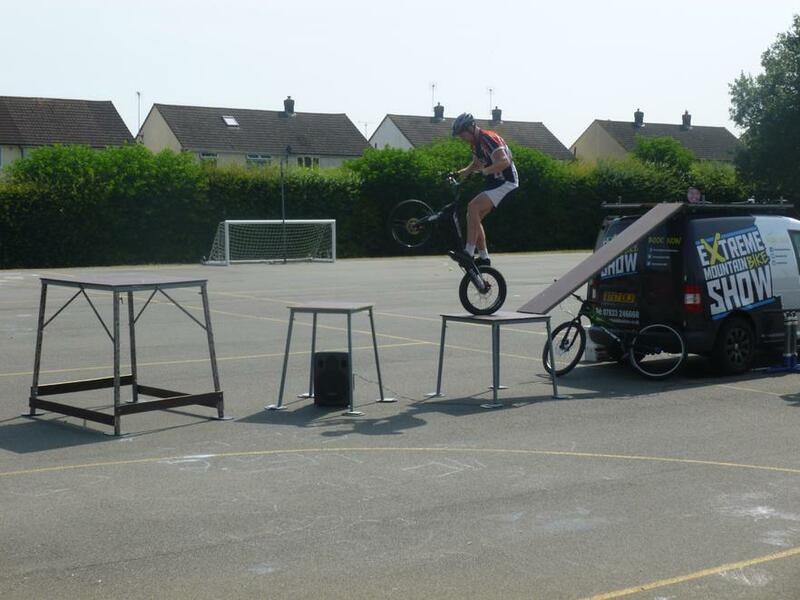 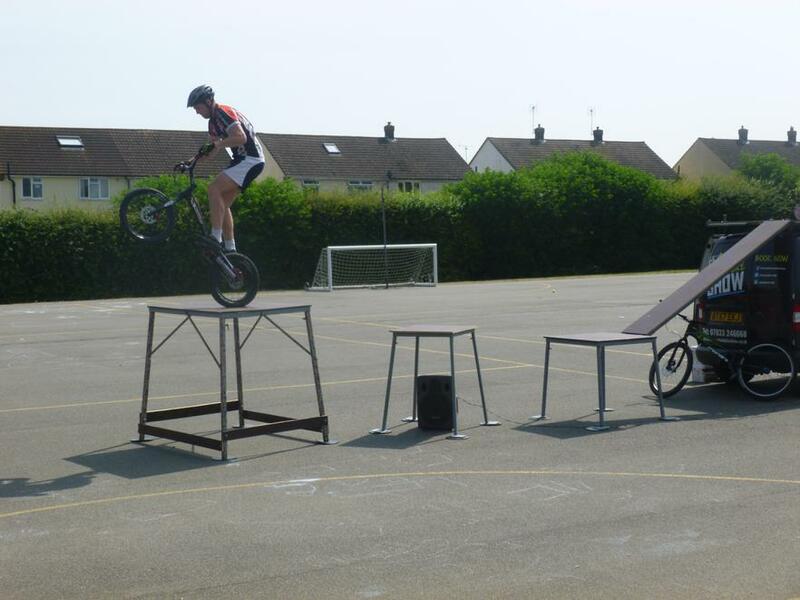 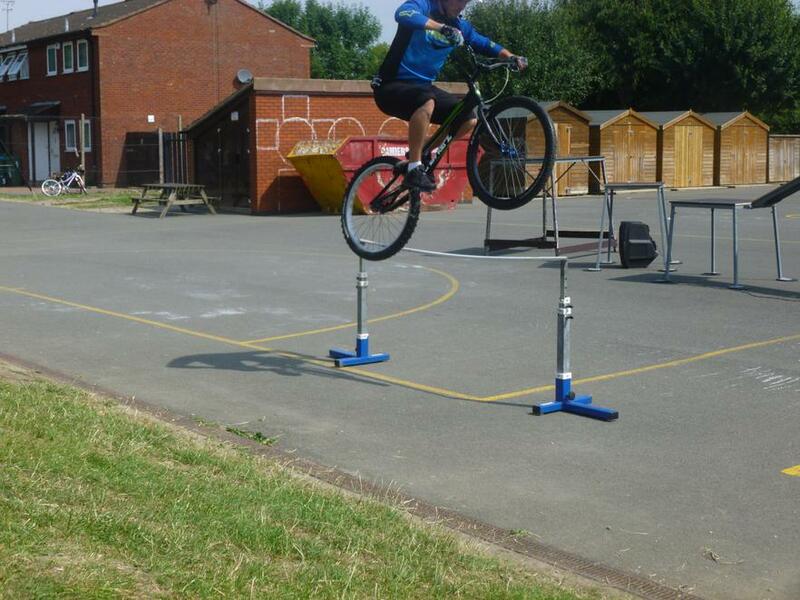 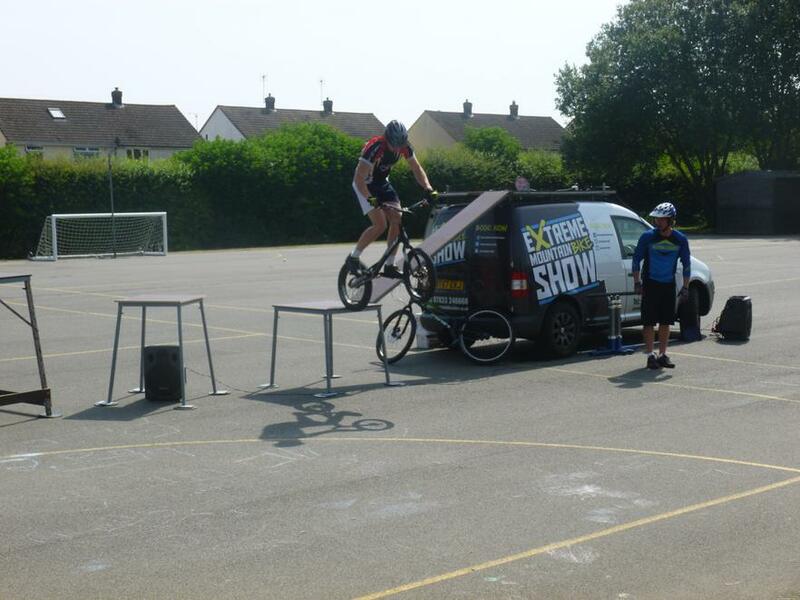 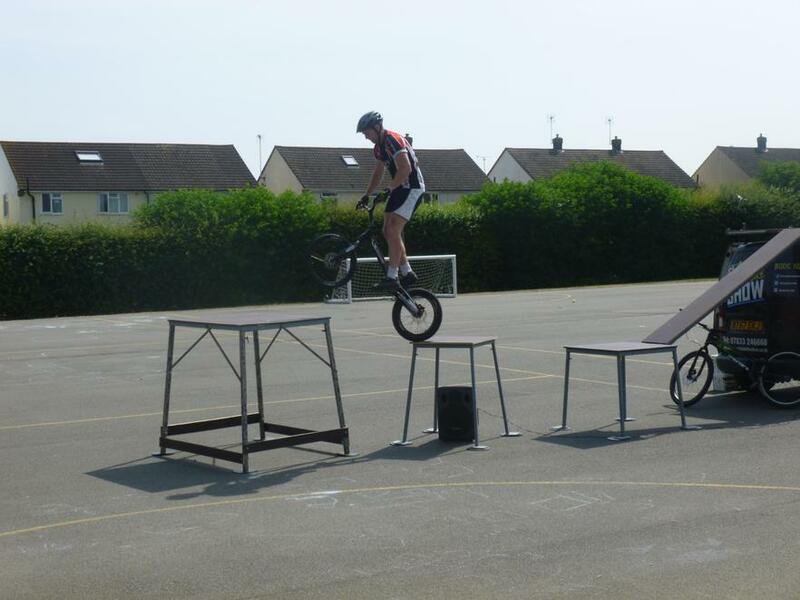 In the morning, we were treated to a display by the UK Mountain Bike Show. 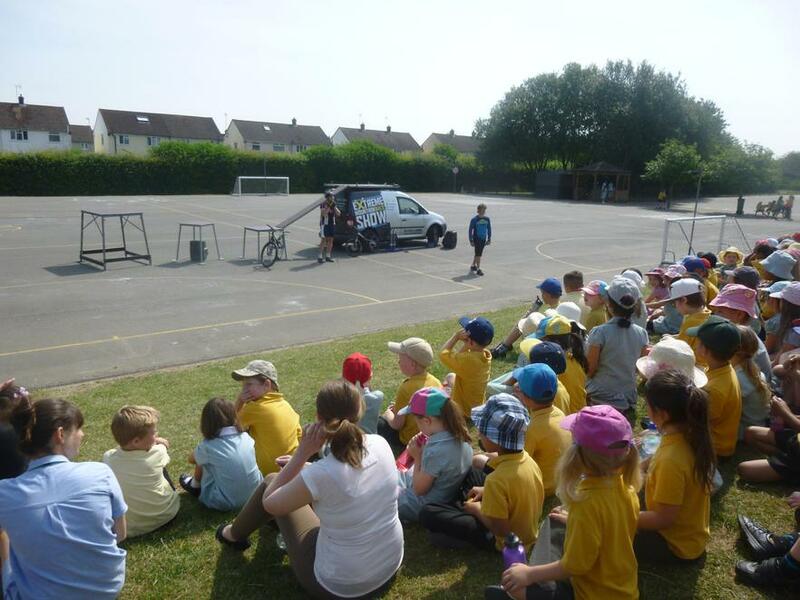 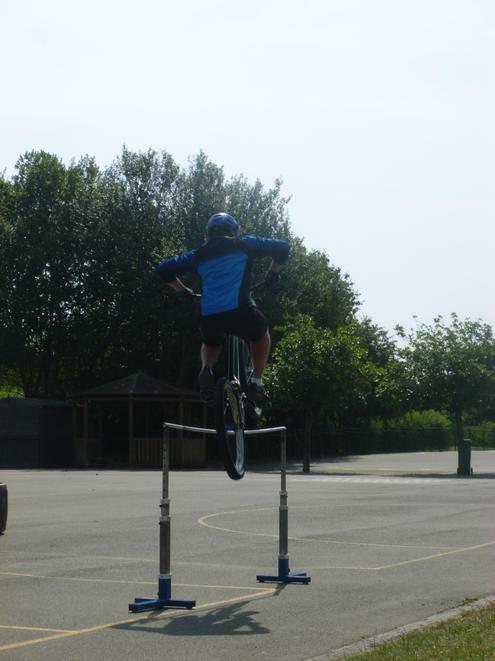 They showed us tricks and stunts and spoke to us about how to stay safe when using a bike or scooter. 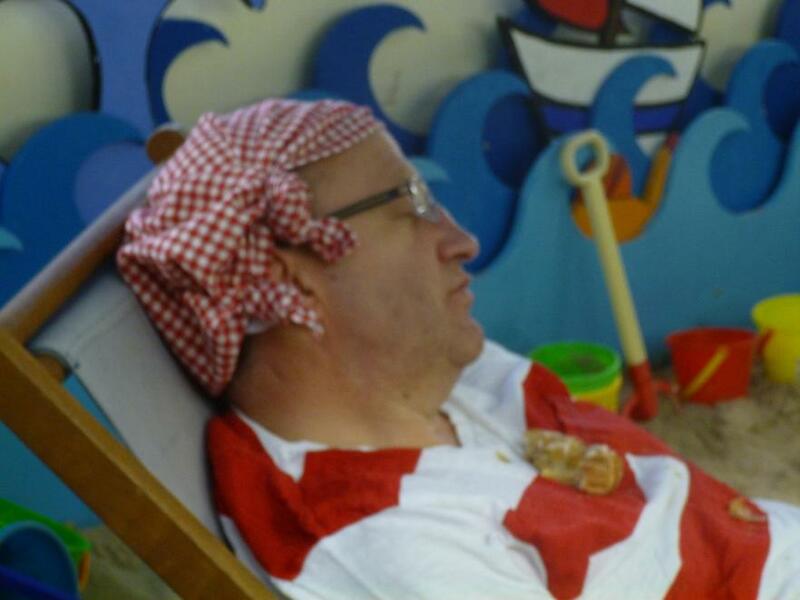 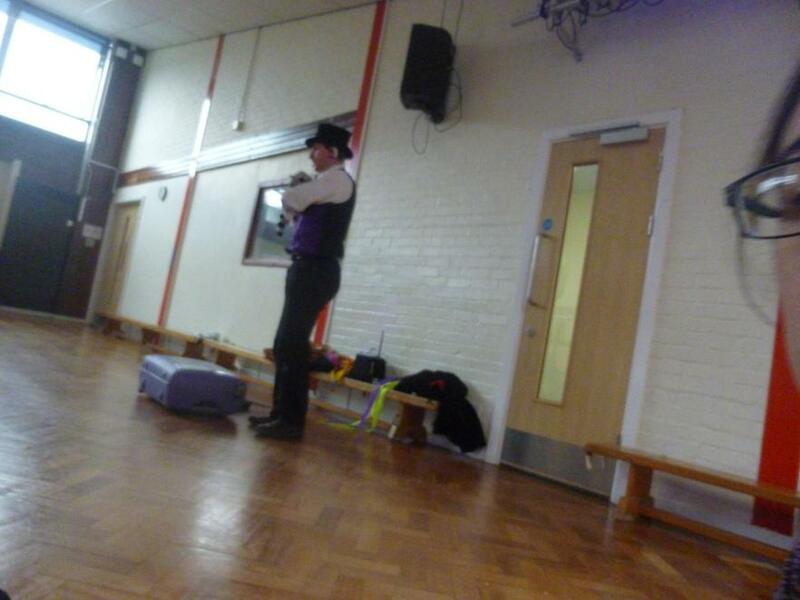 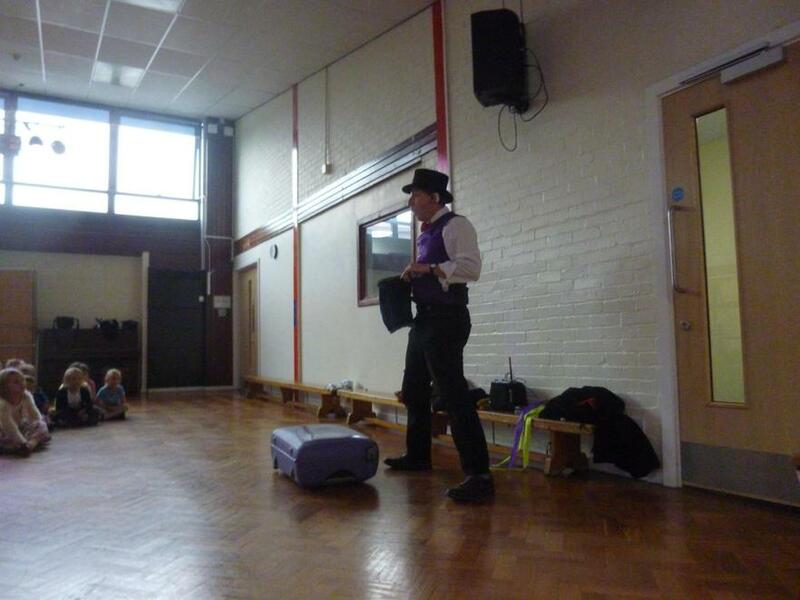 We had a surprise visit by a Lighthouse Keeper at the beginning of the half term. 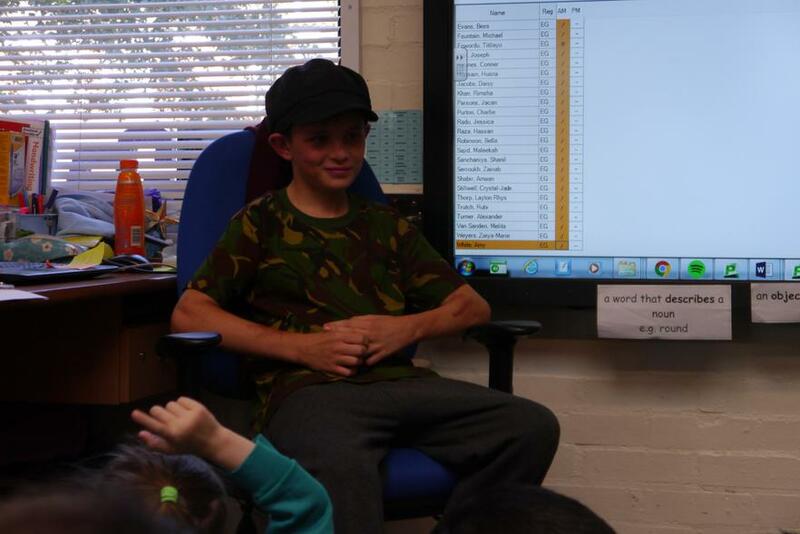 Mr. Grinling spoke to us about his lighthouse, his job, his family and all the things he gets up to. 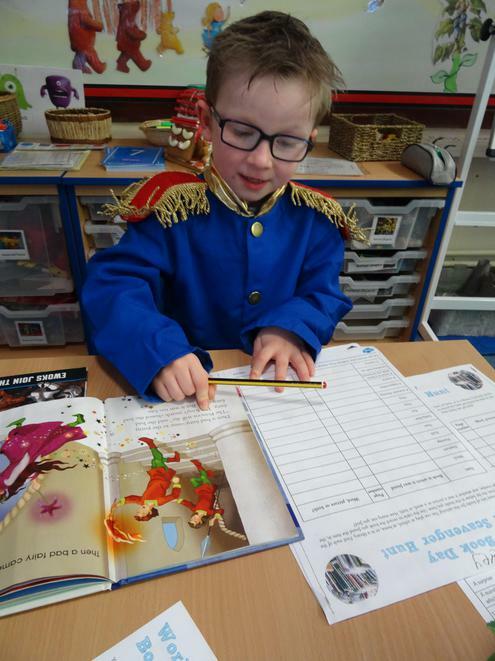 We discovered that his life has been made in to stories, and will be reading these stories throughout the half term. 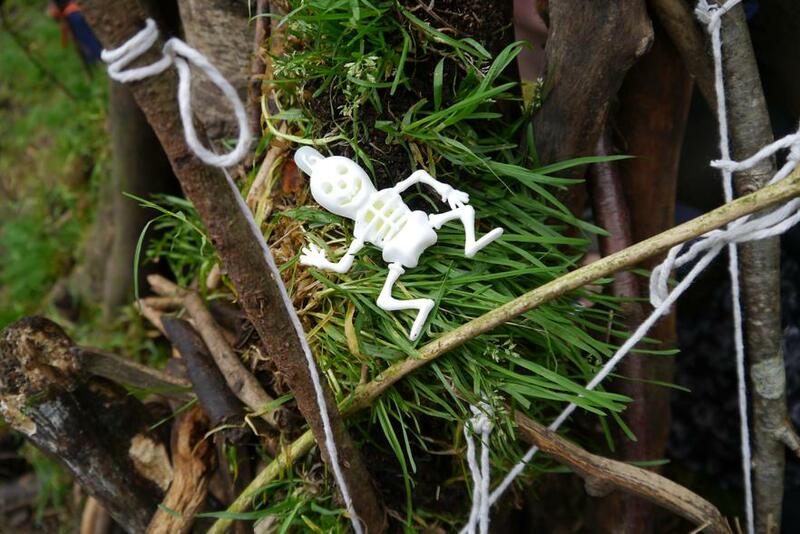 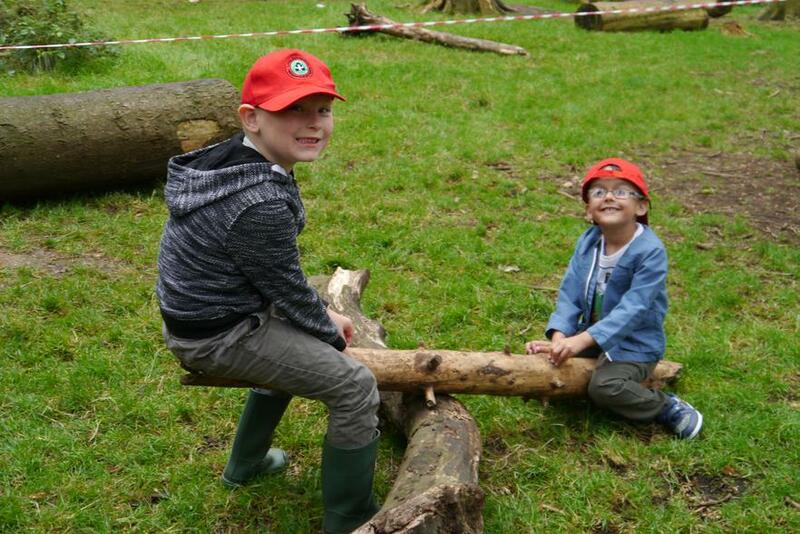 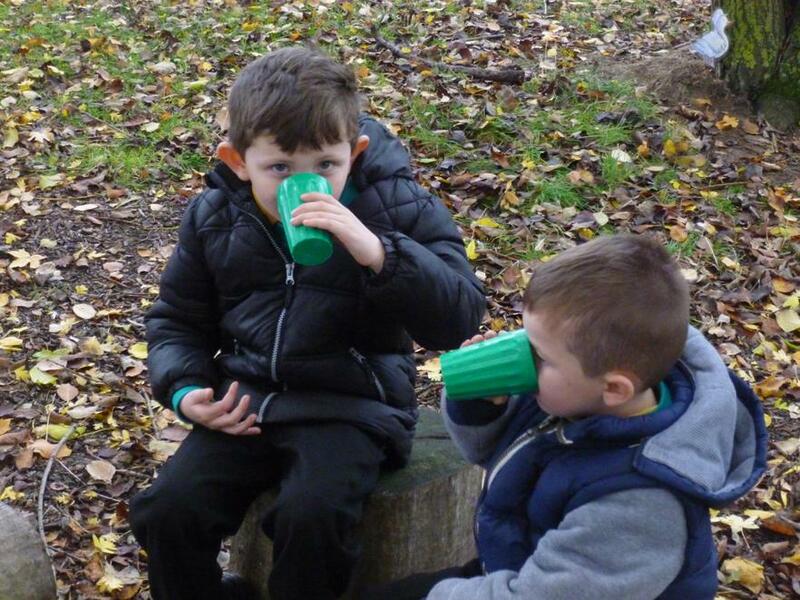 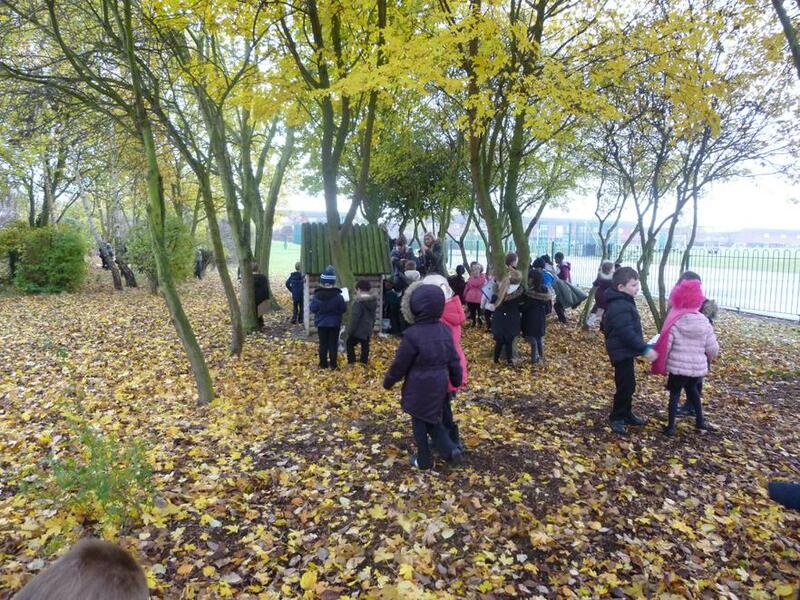 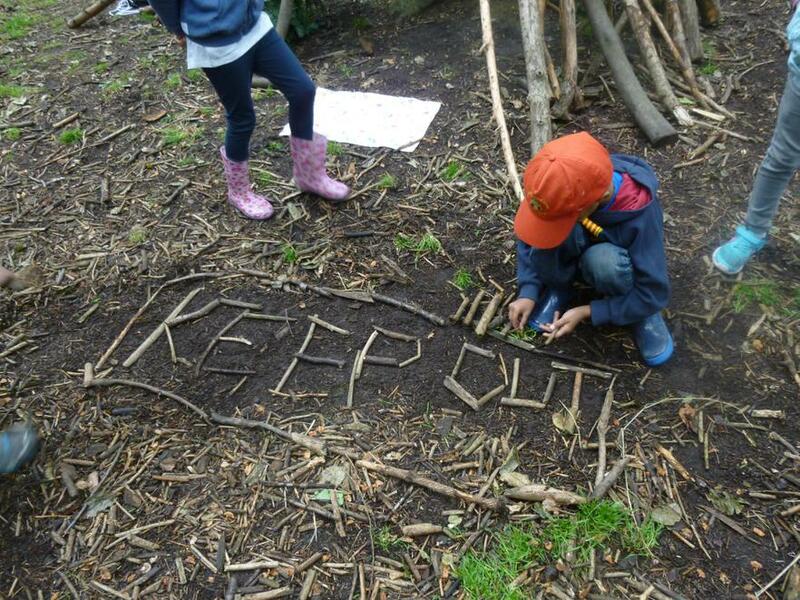 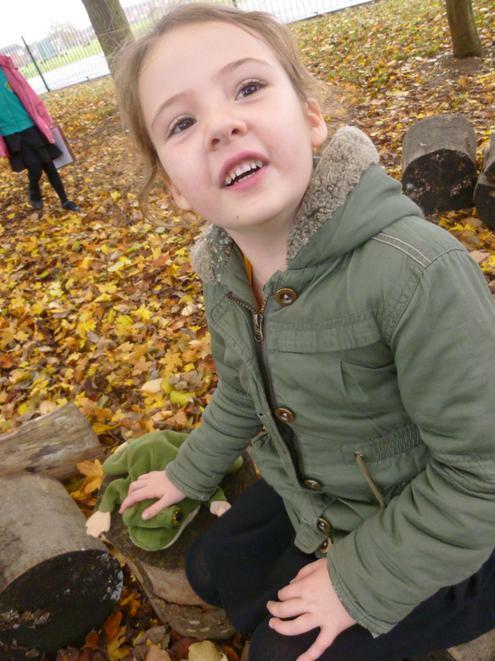 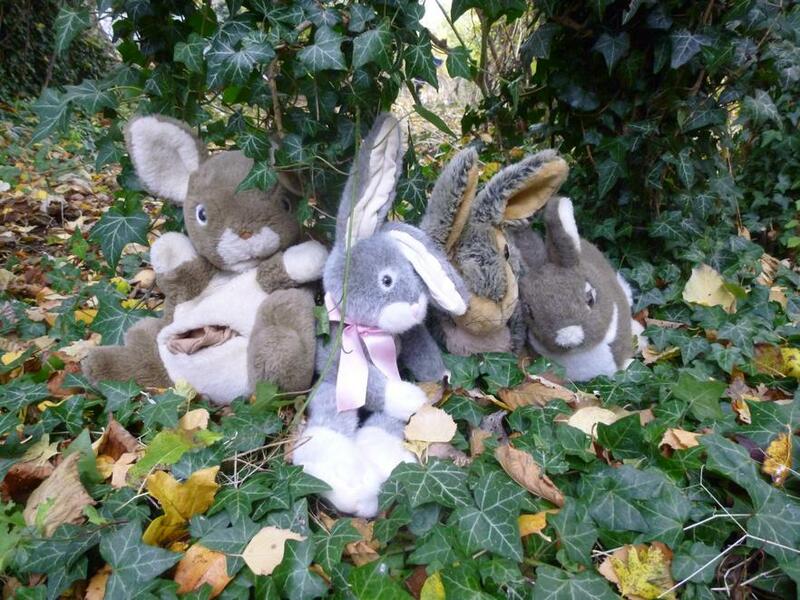 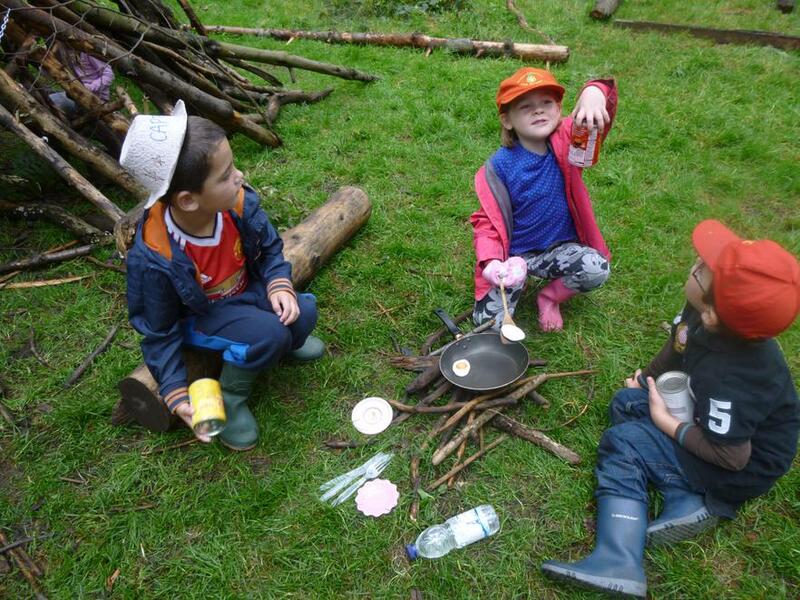 As the weather has been getting better, the children have been enjoying the use of Forest School. 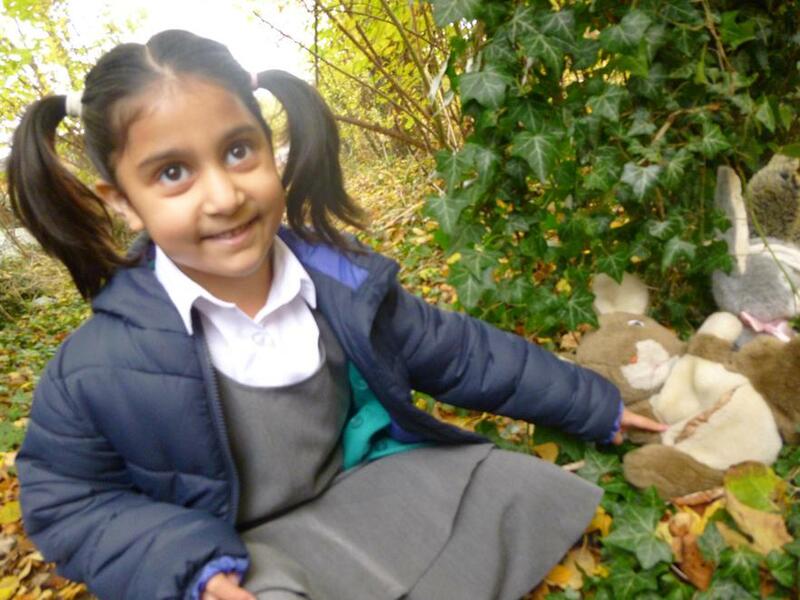 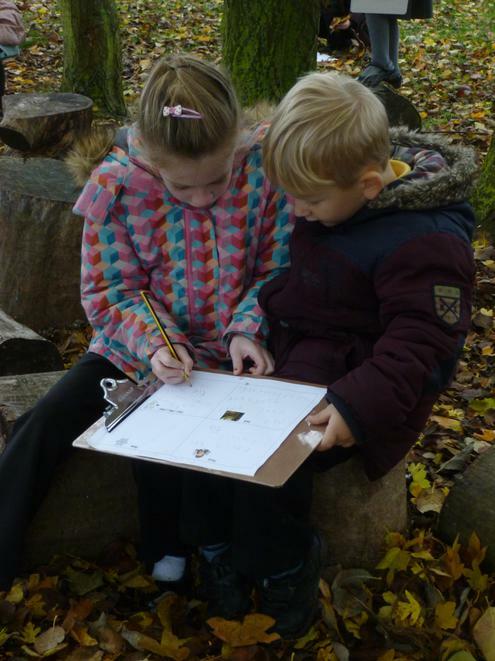 Year 2's have built bug hotels, collected leaves and have searched for interesting creatures. 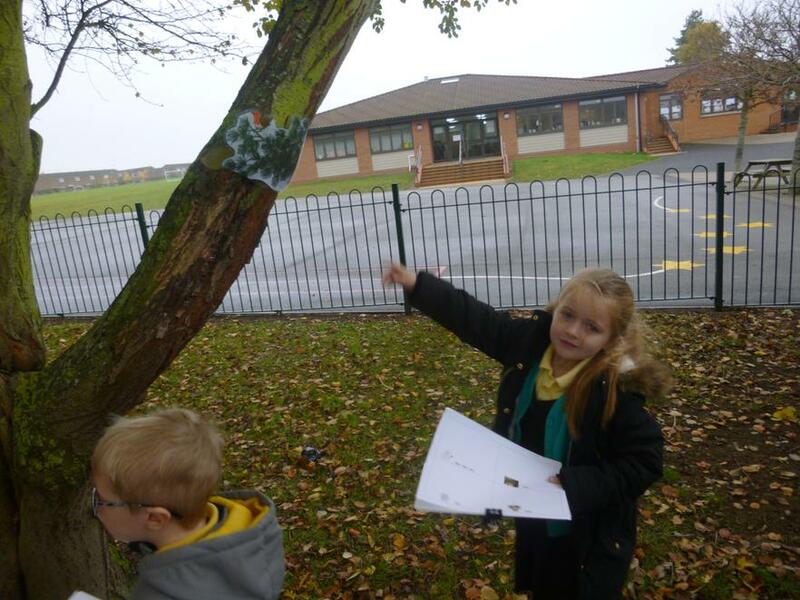 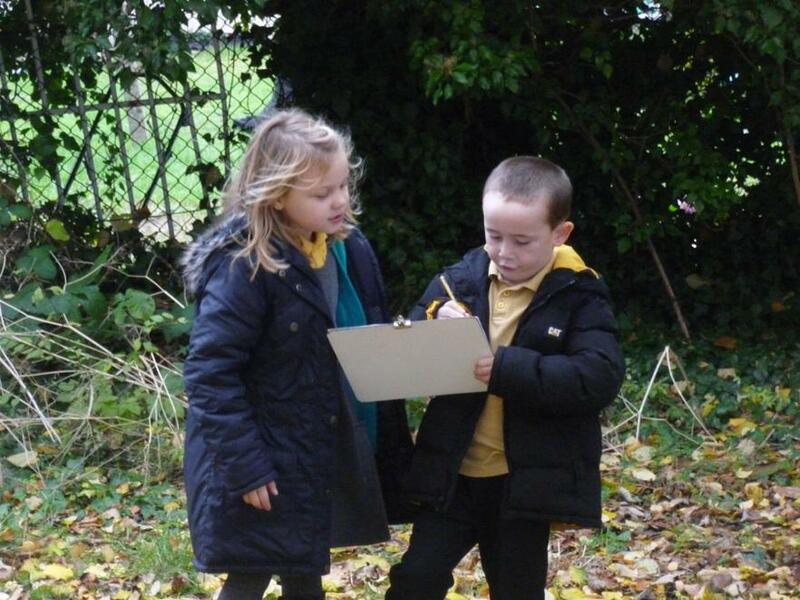 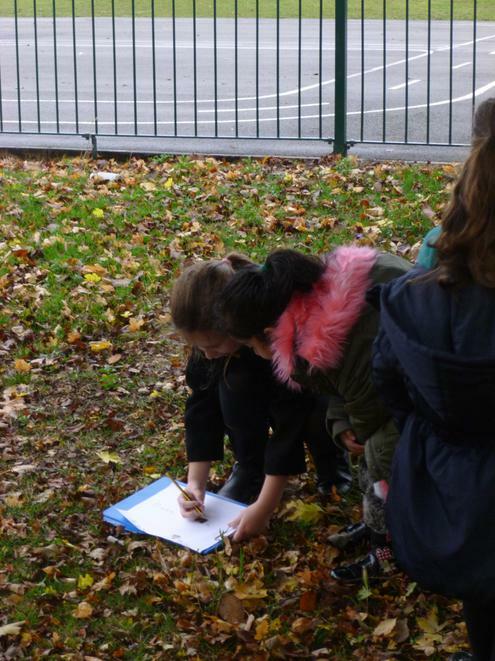 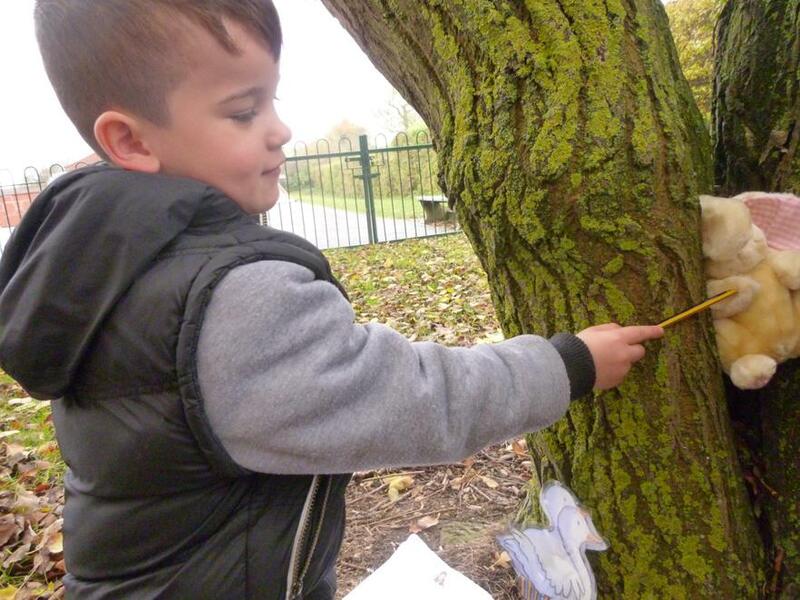 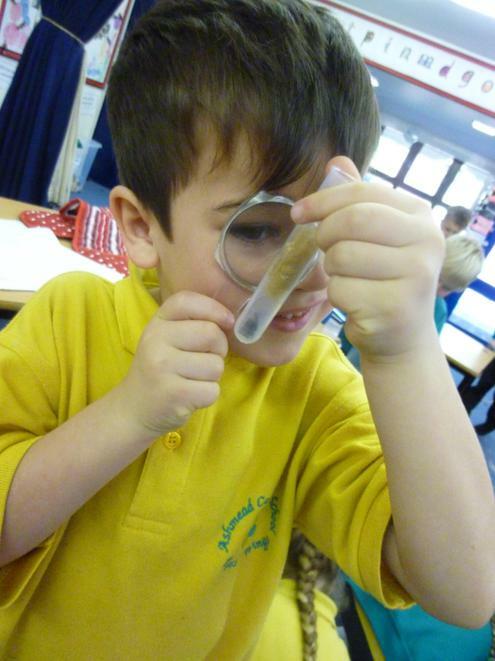 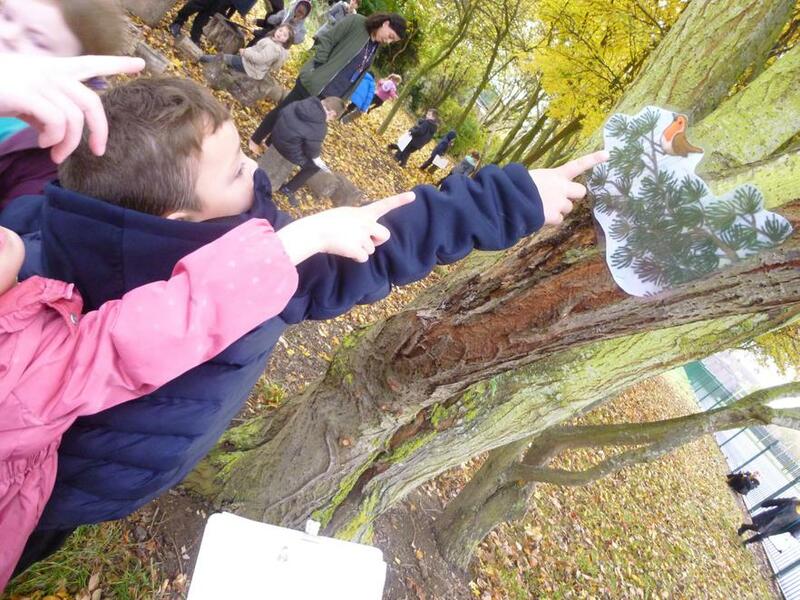 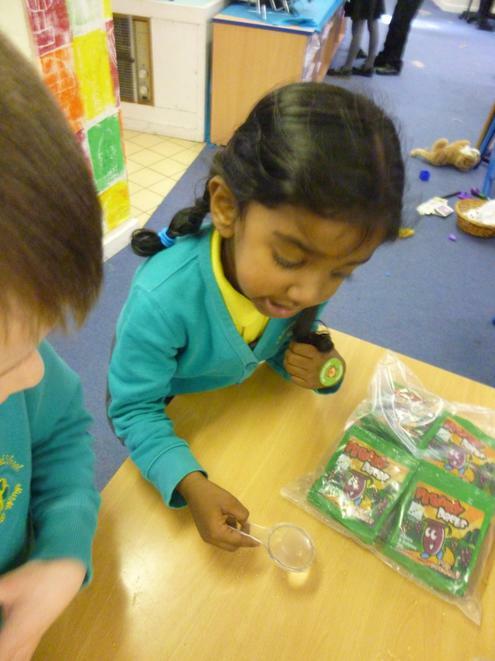 Year 1 have been identifying trees, birds and insects, and have enjoyed using magnifying glasses to get a closer look at minibeasts. 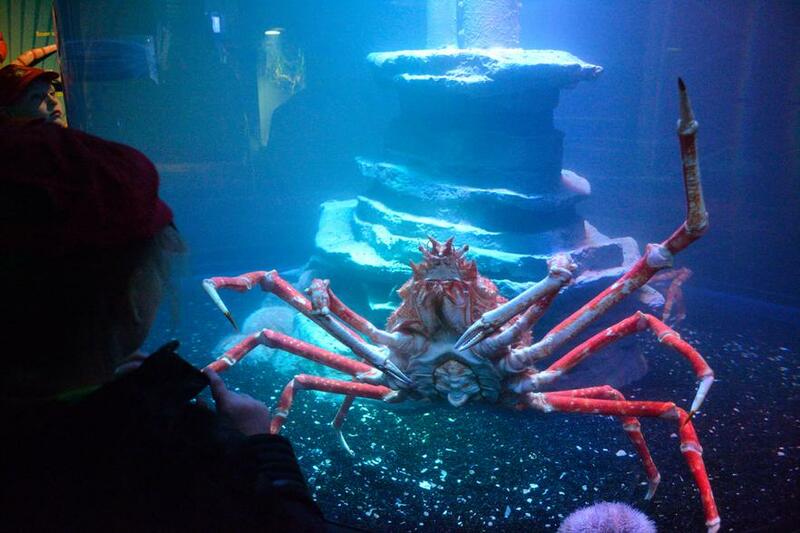 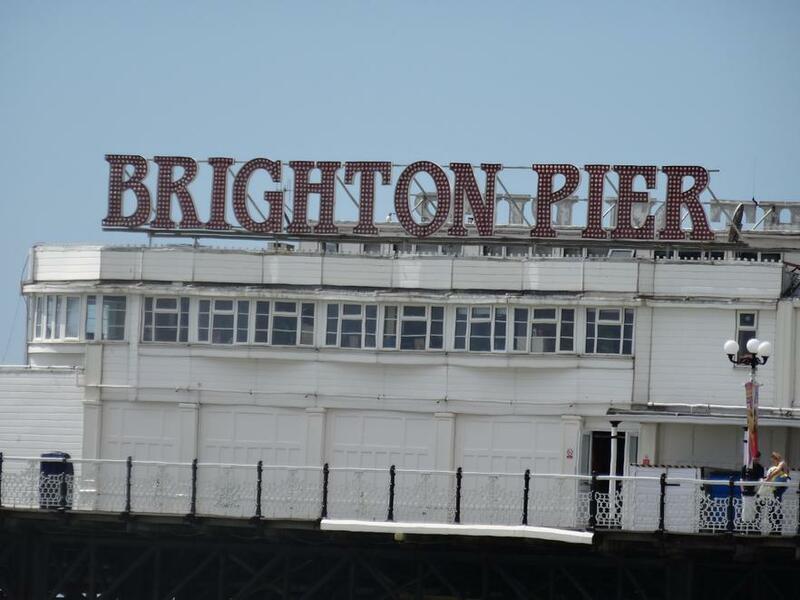 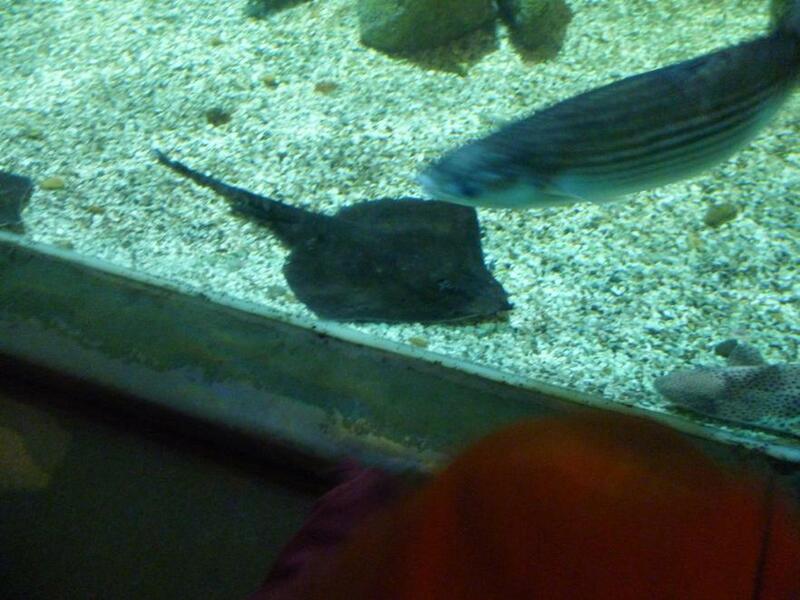 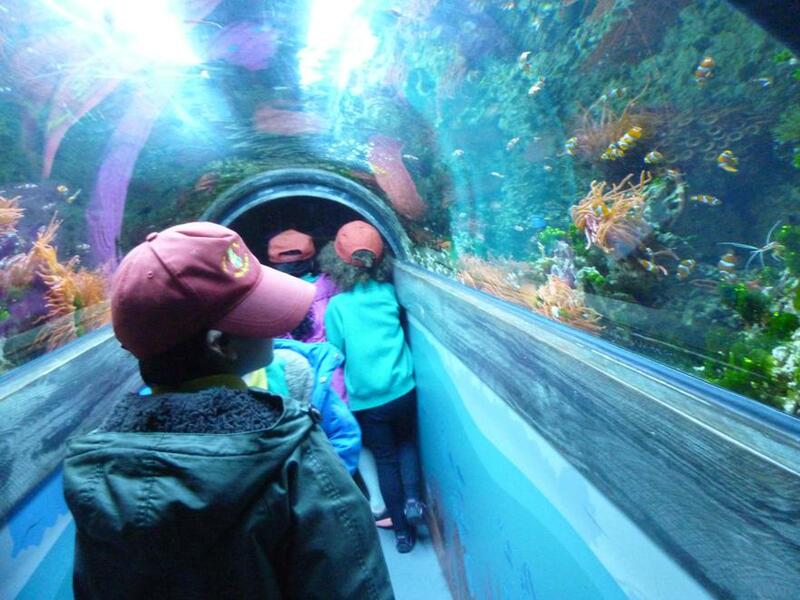 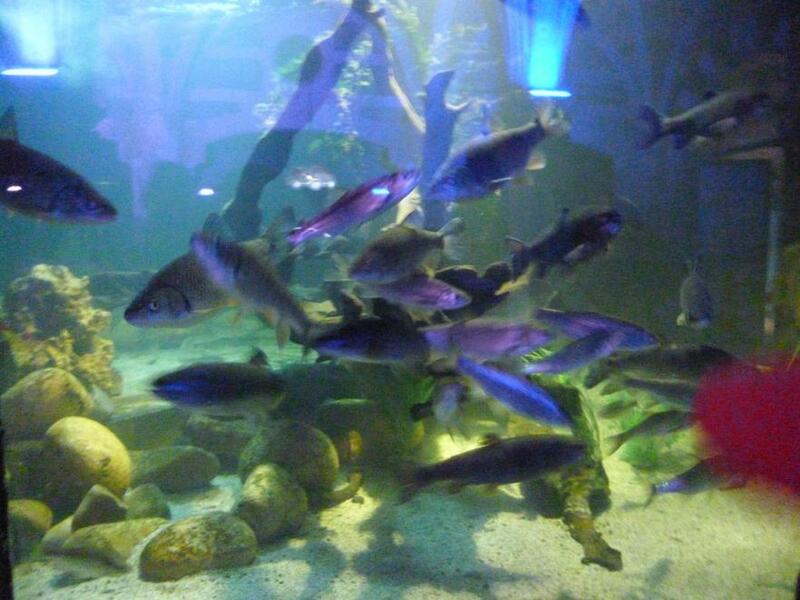 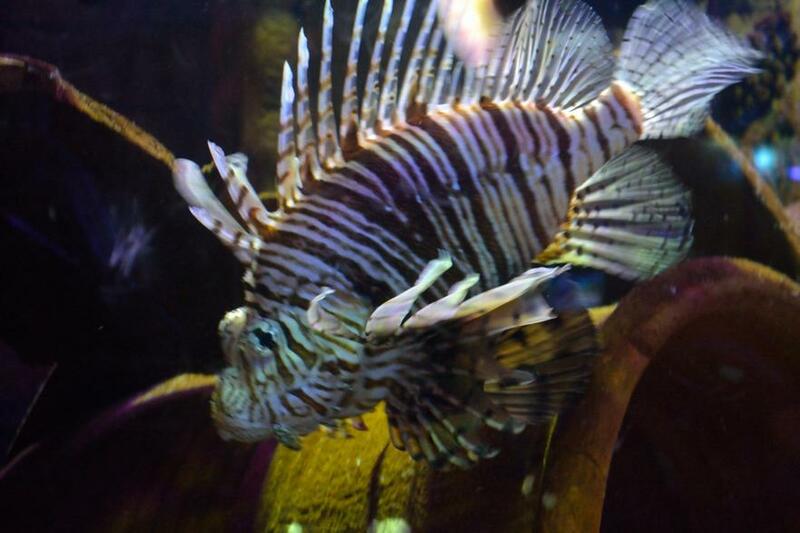 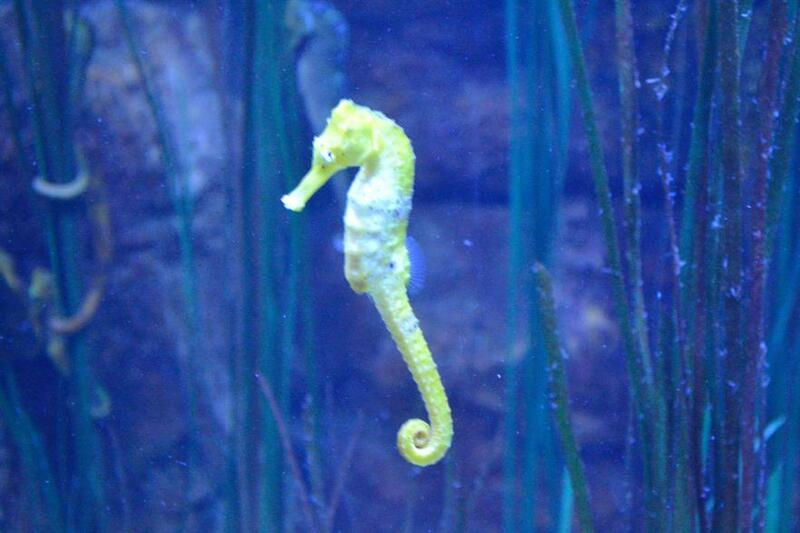 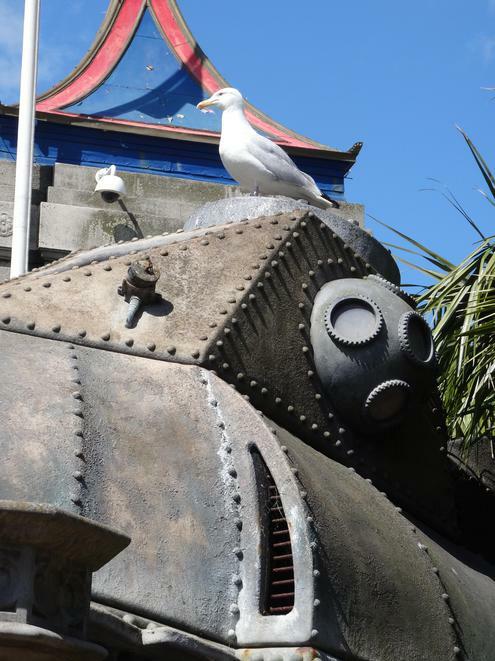 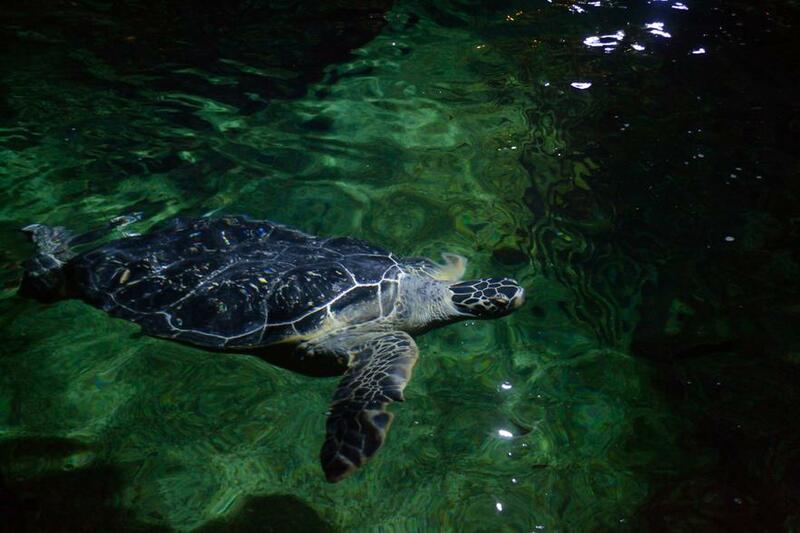 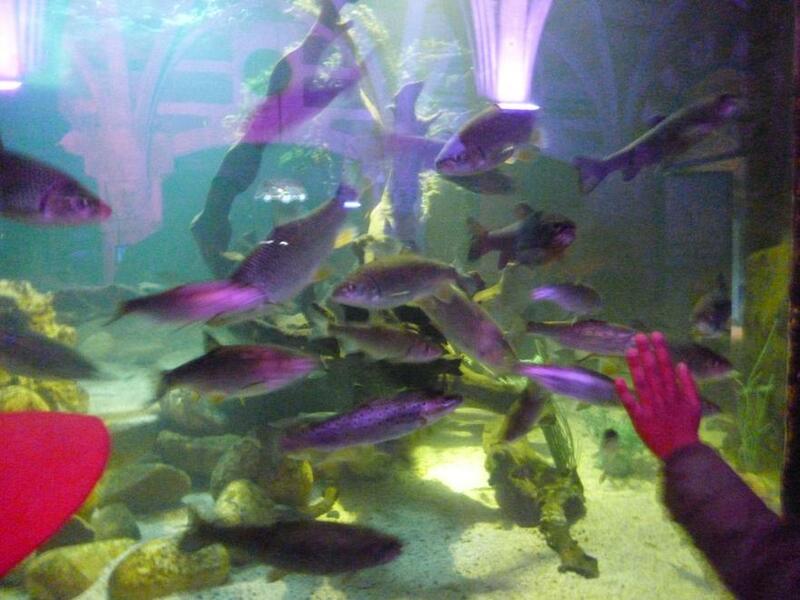 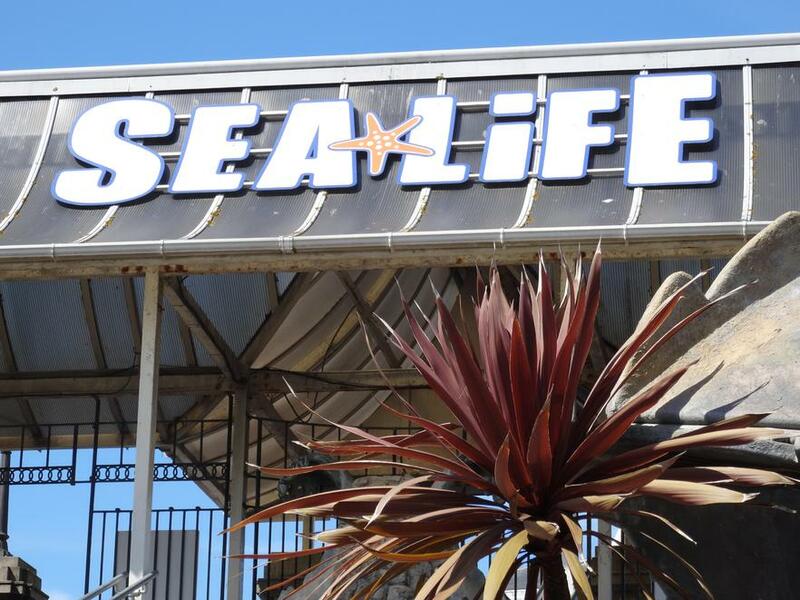 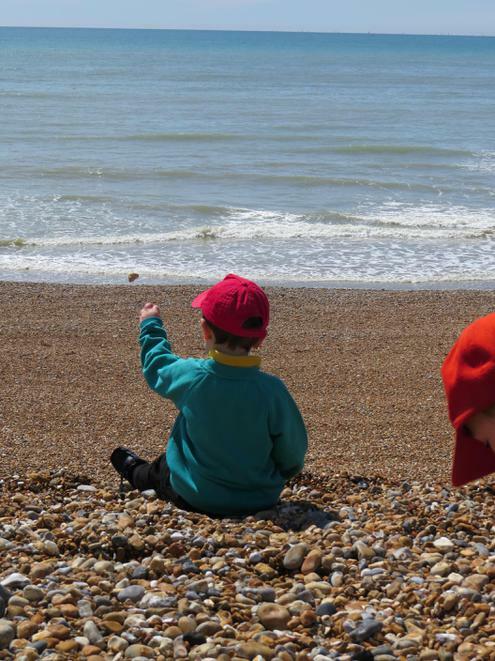 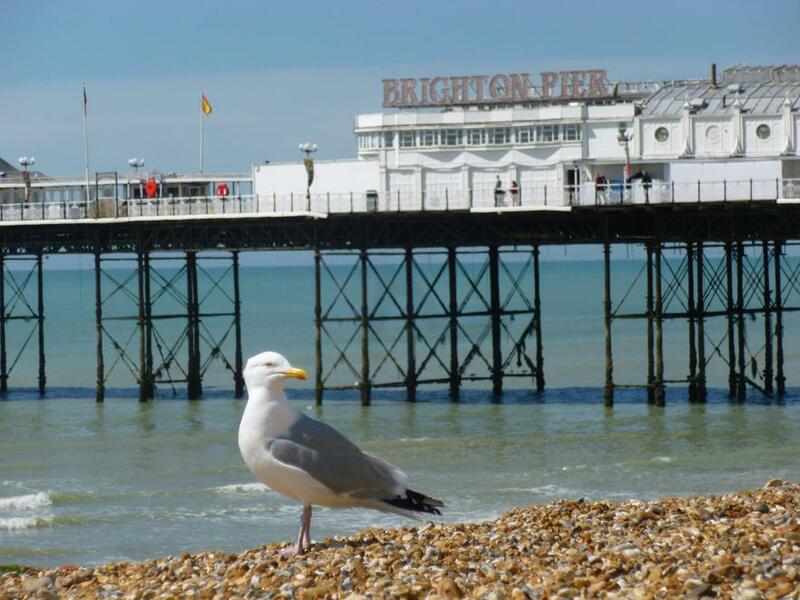 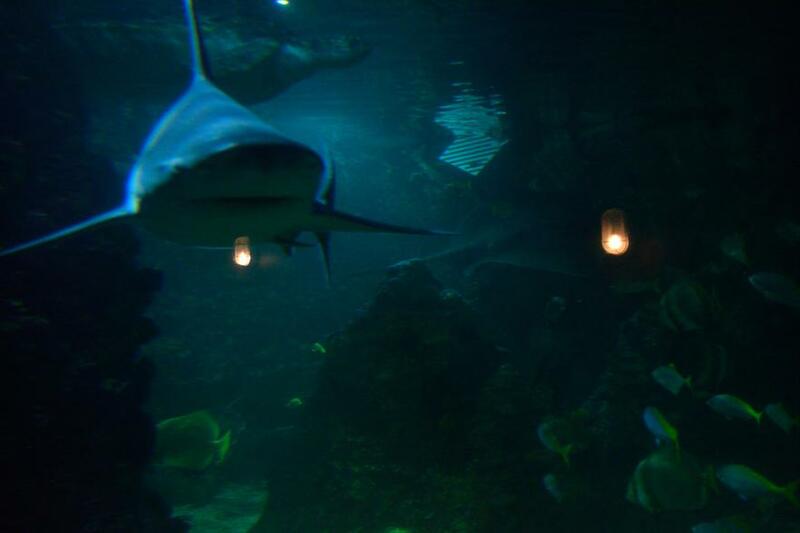 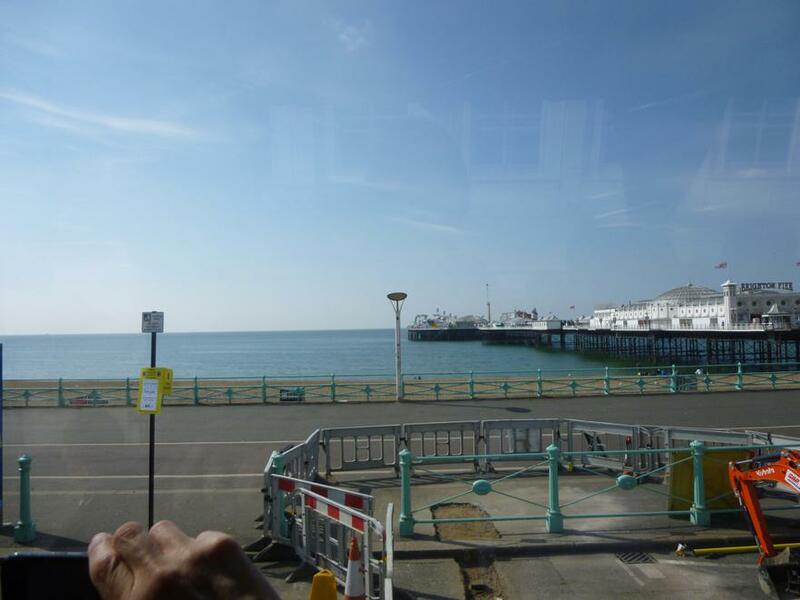 Year 1 and Year 2 have been on a trip to Brighton beach, and visited the Sealife Centre. 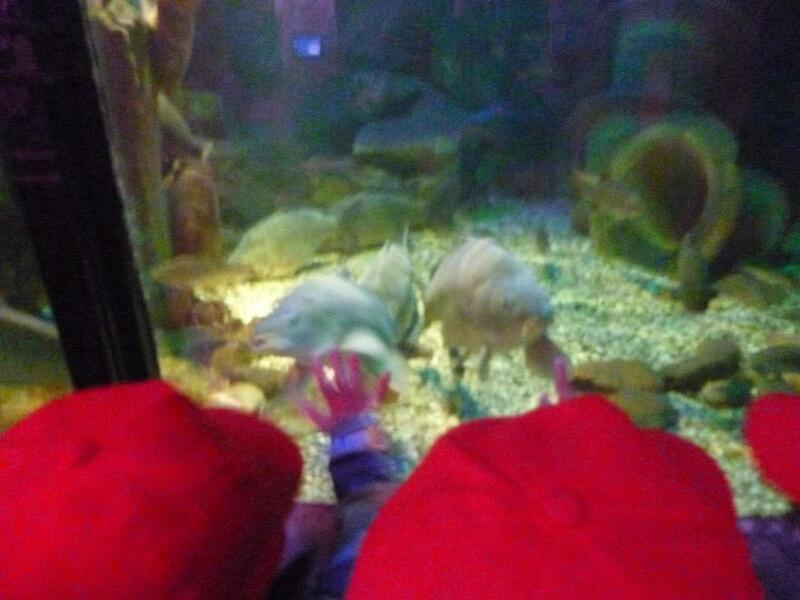 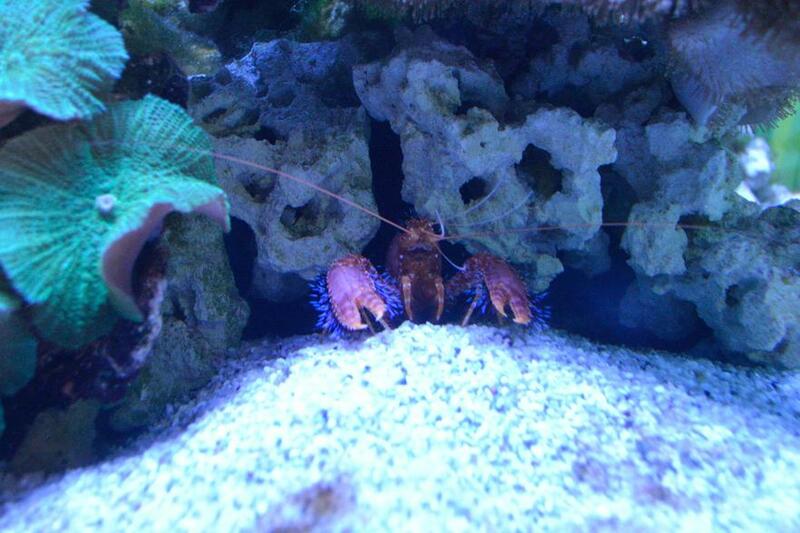 We saw lots of strange fish, scary sharks and smelly crabs! 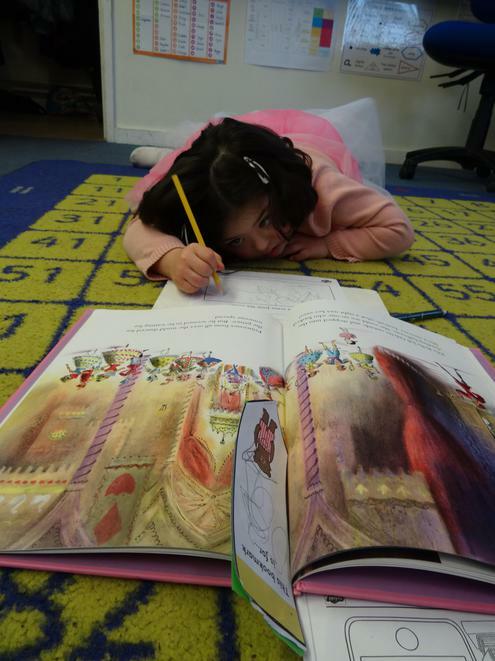 We all hope that you are rested and full of excitement for the new topic, Once Upon a Time. 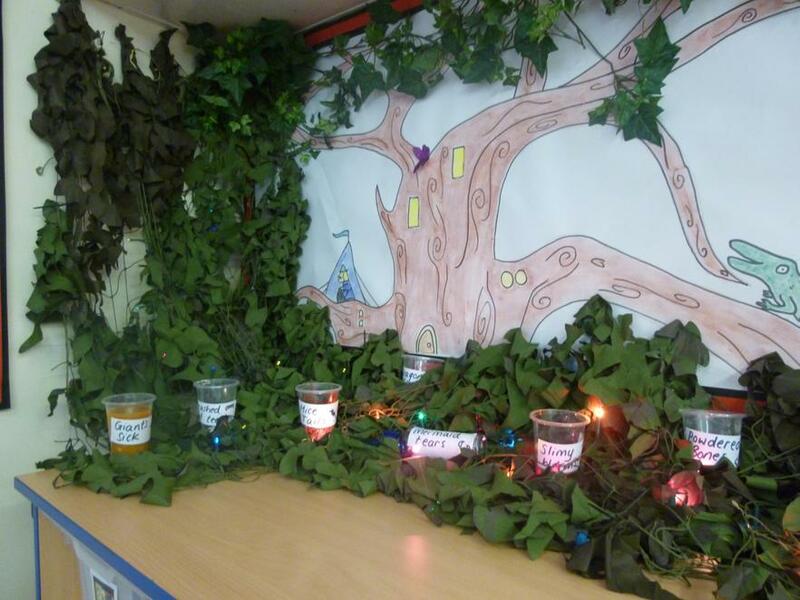 We will be looking at a range of fairytale stories like Hansel and Gretel, Jack and the Beanstalk and Cinderella. 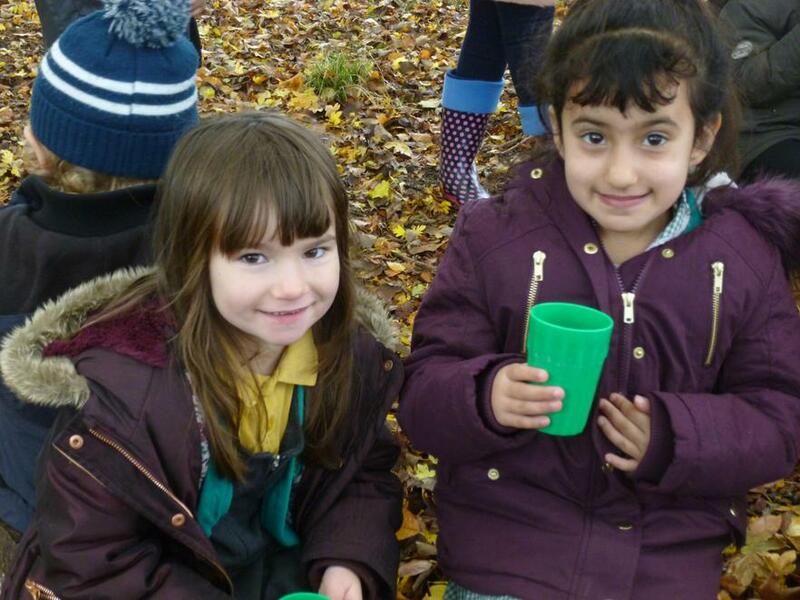 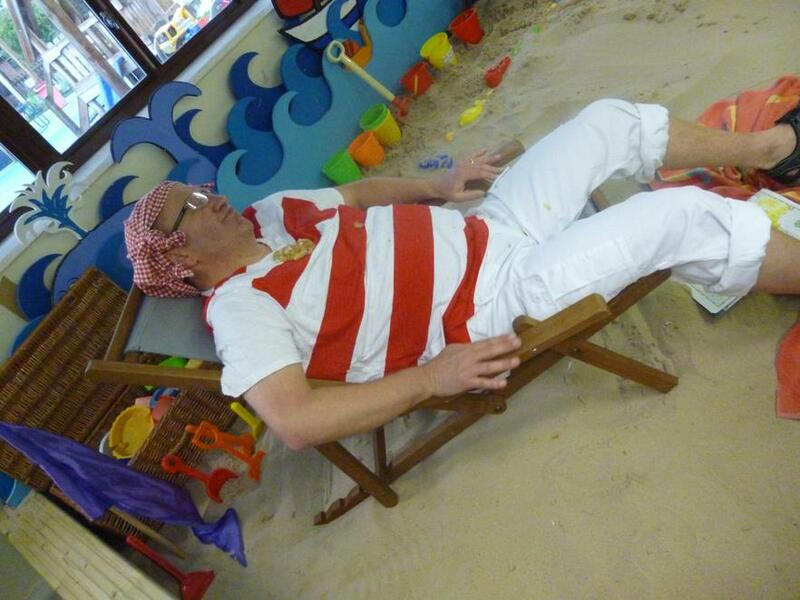 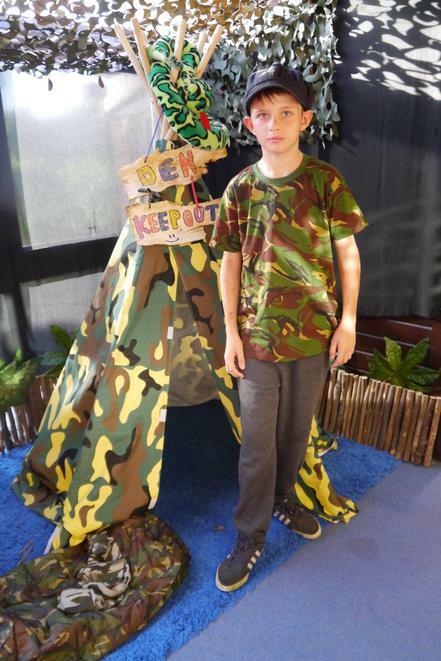 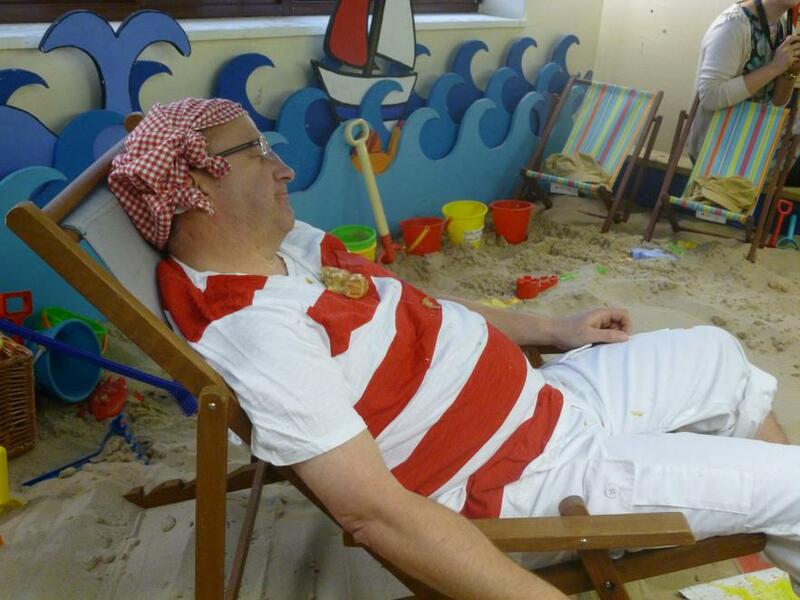 We will keep you updated with all the fun experiences the children get up to throughout the term! 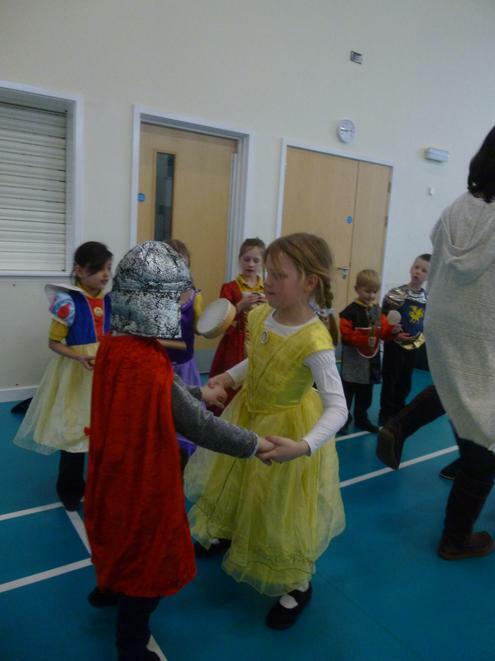 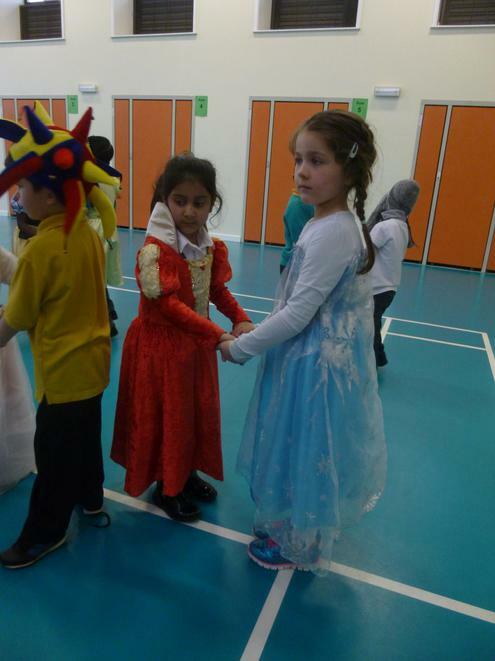 The Year 1 children enjoyed dressing up as a knight or princess for our Medieval themed experience day! 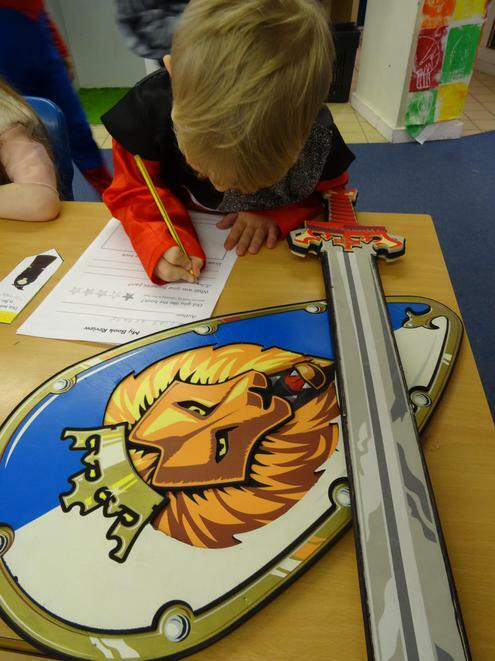 They loved acting as knights attacking a castle, writing about the weapons used, aiming at targets to gain points and dancing as lords and ladys! 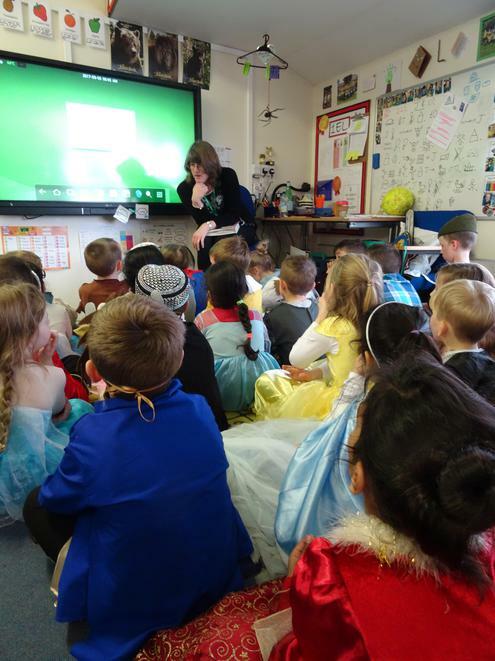 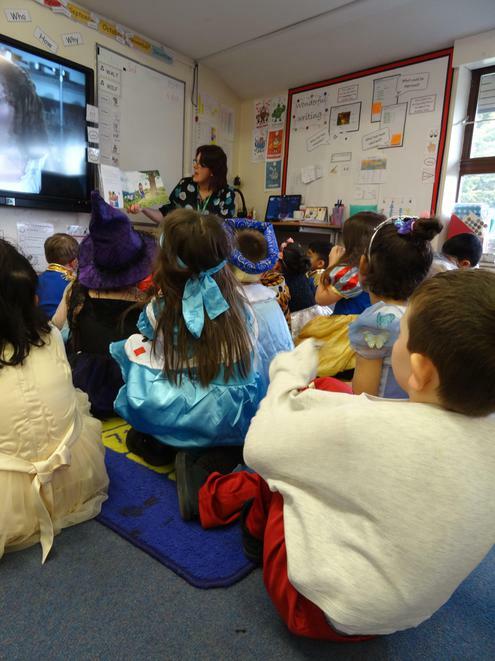 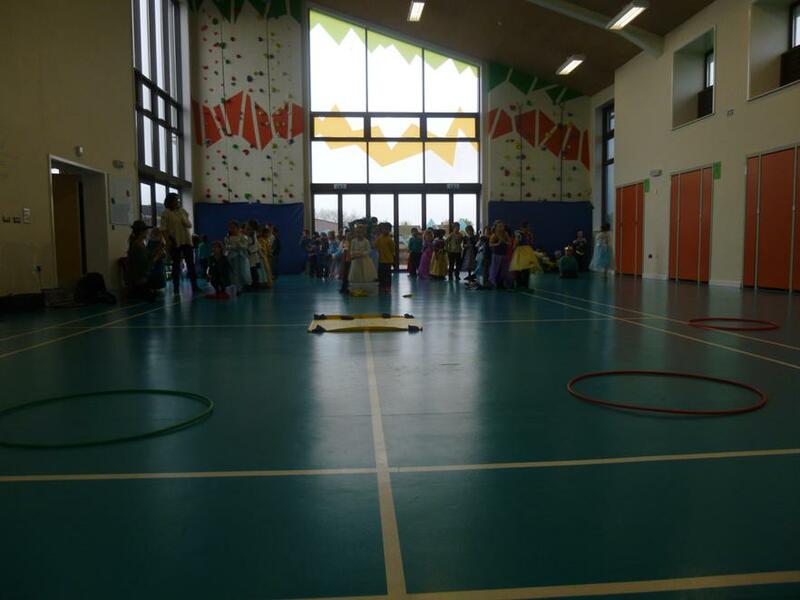 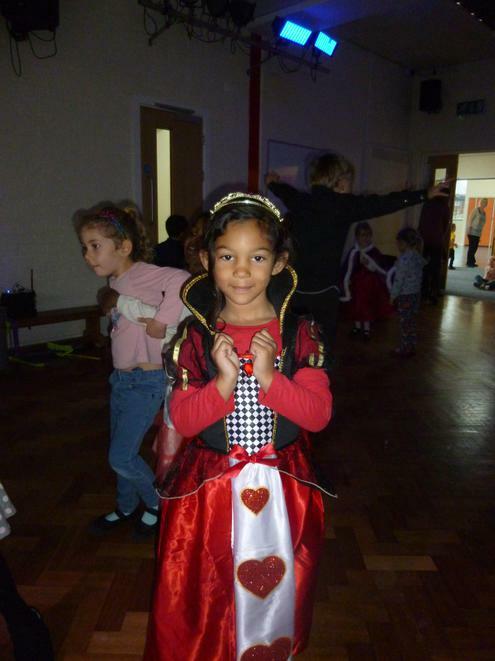 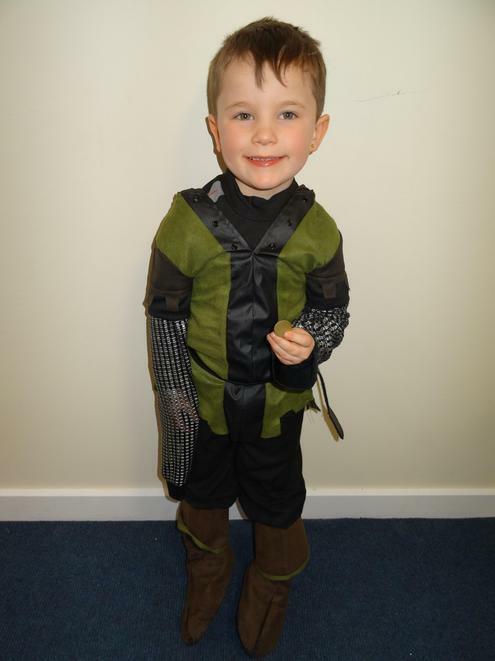 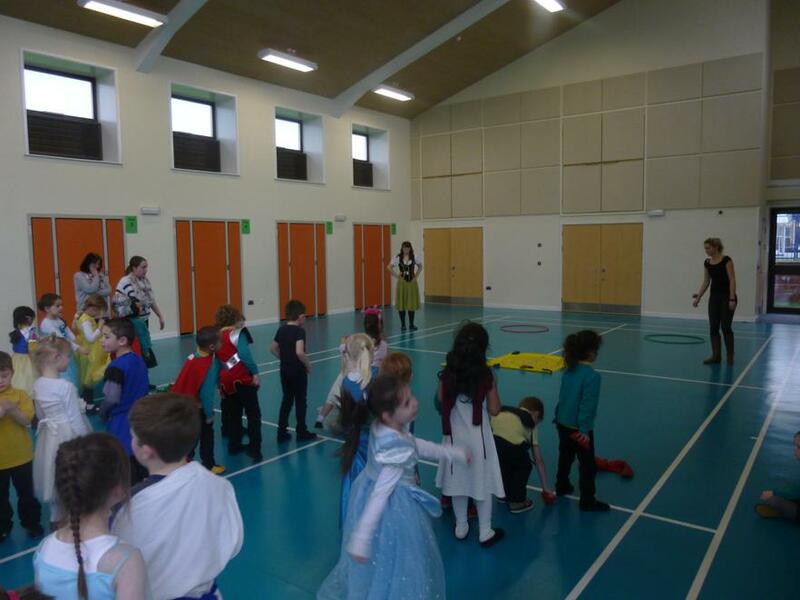 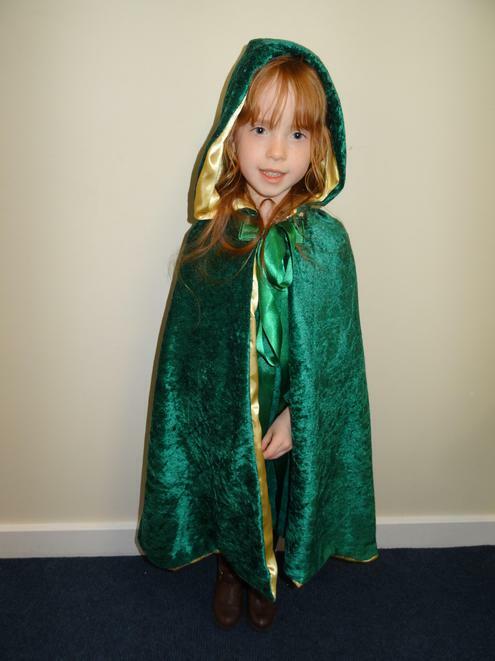 We thoroughly enjoyed seeing all the children dressed up as a character from a story starting, "Once upon a time". 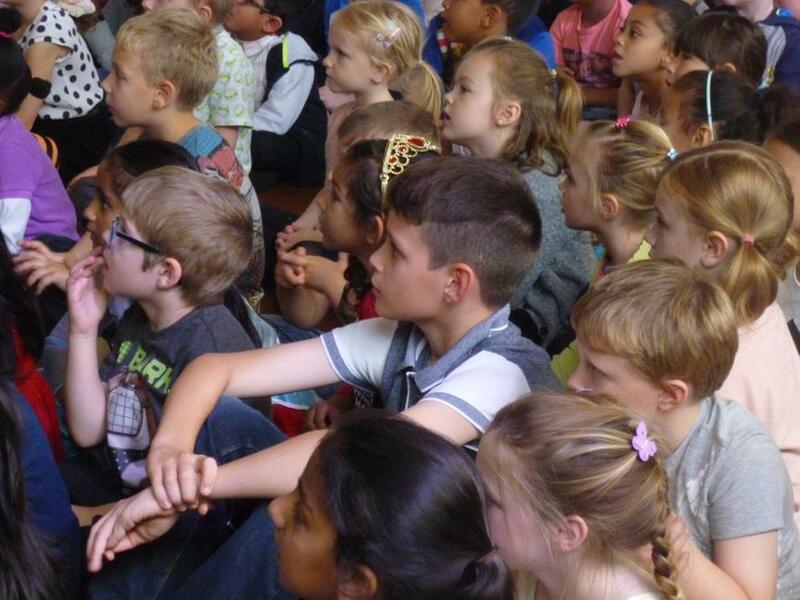 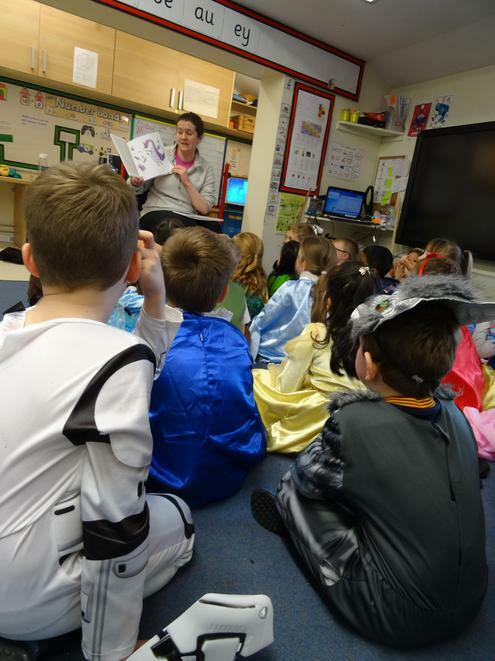 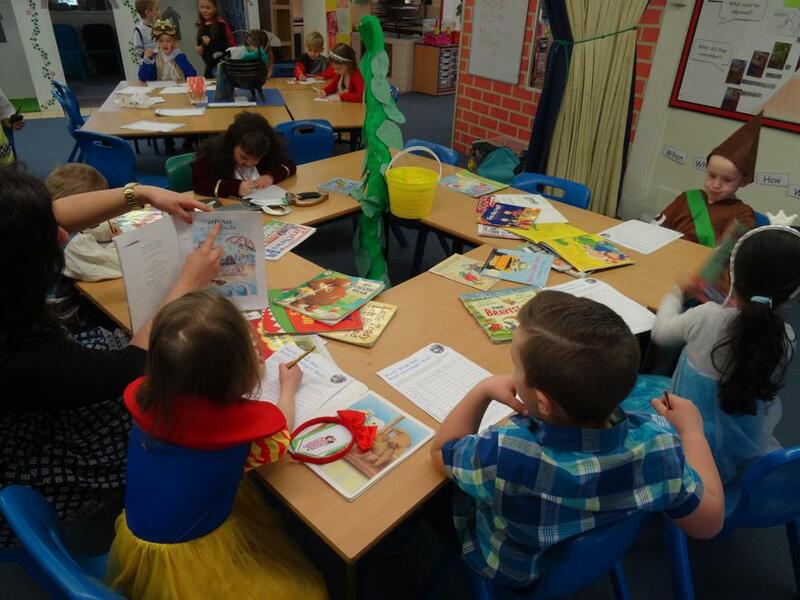 The children had a great day, with children across the school having a 'mystery' reader come and read a story to them. 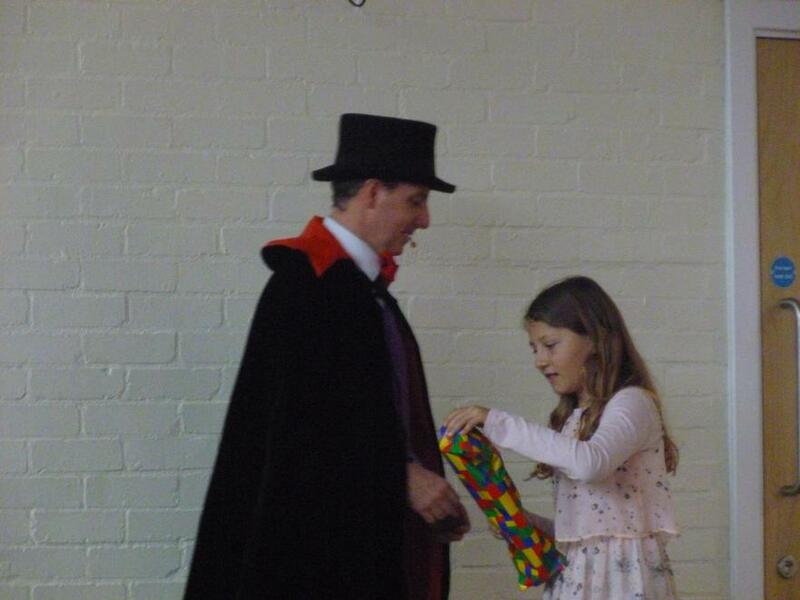 The outfits looked amazing and so much thought had been put in to their costumes. 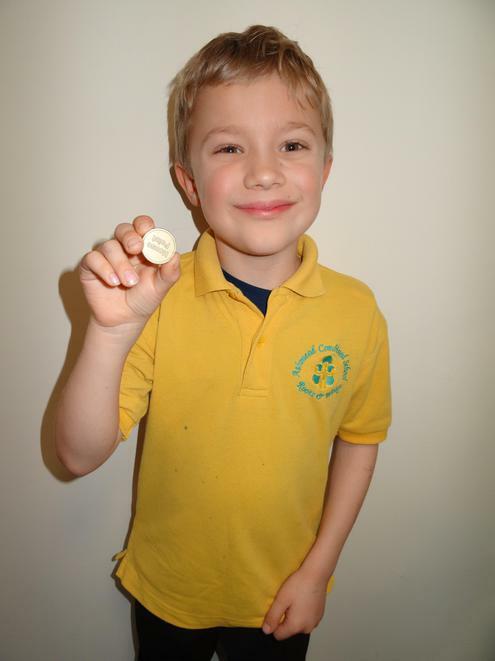 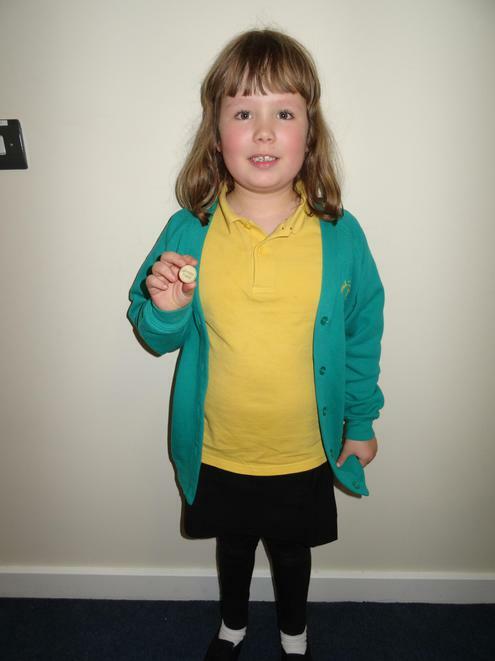 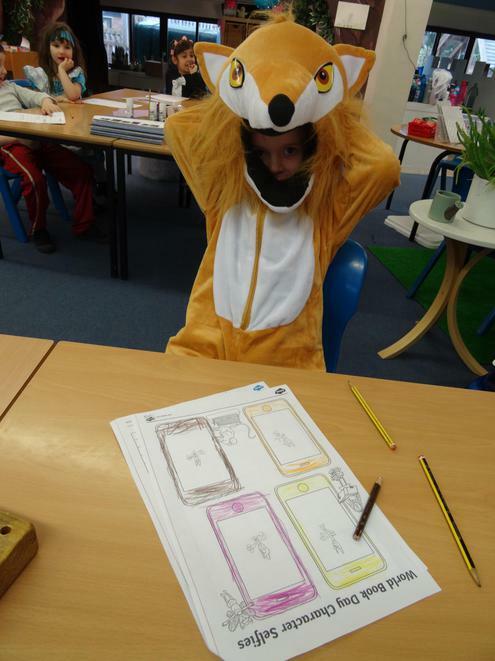 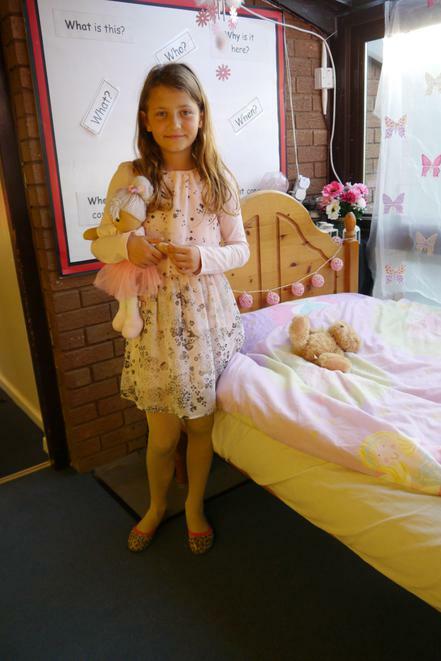 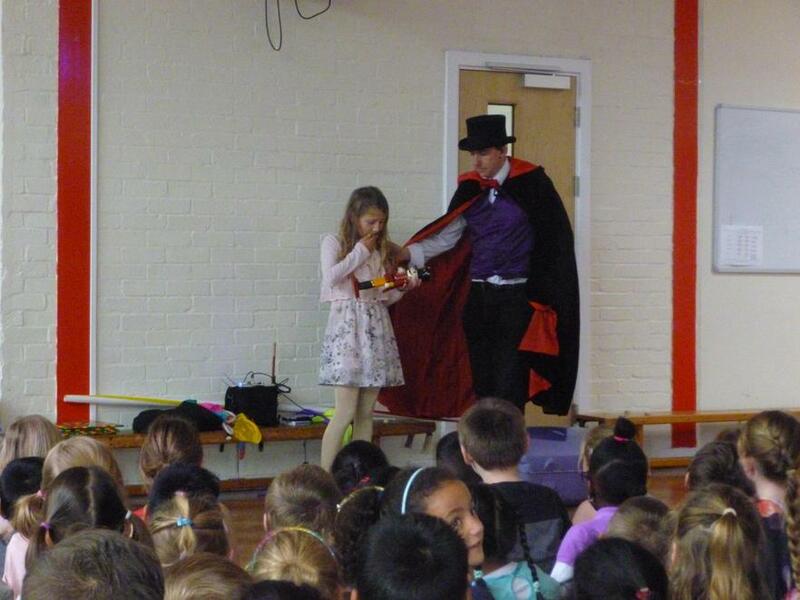 Well done to those who were chosen to receive an amazing golden housepoint for the 'best dressed'! 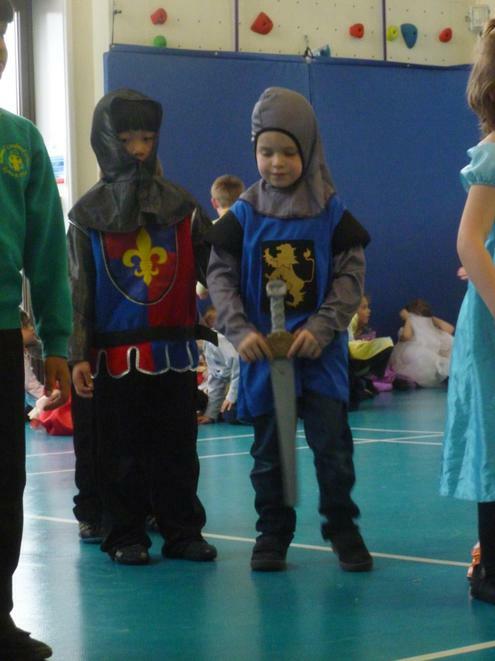 The children in Year 1 and Year 2 enjoyed a historical trip to Warwick Castle. 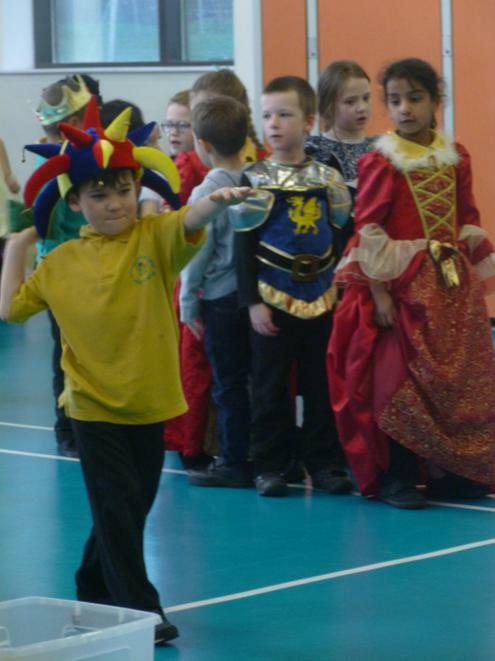 They were baffled by the Ballista, mezmorised at the views from the Mound, greeted by knights in the Great Hall, happy to try on the helmets and some were grossed out by the gaol! 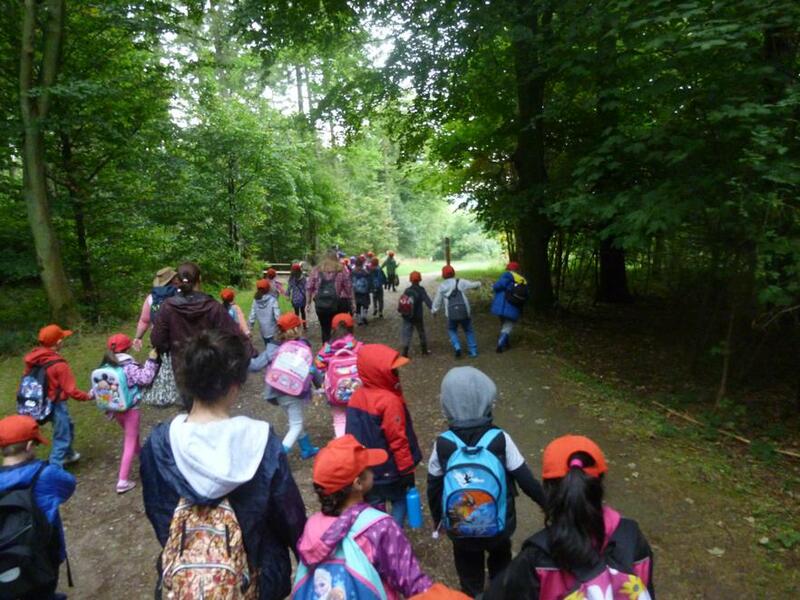 They were brilliantly behaved from start to end, and we hope that they loved the trip as much as we did! 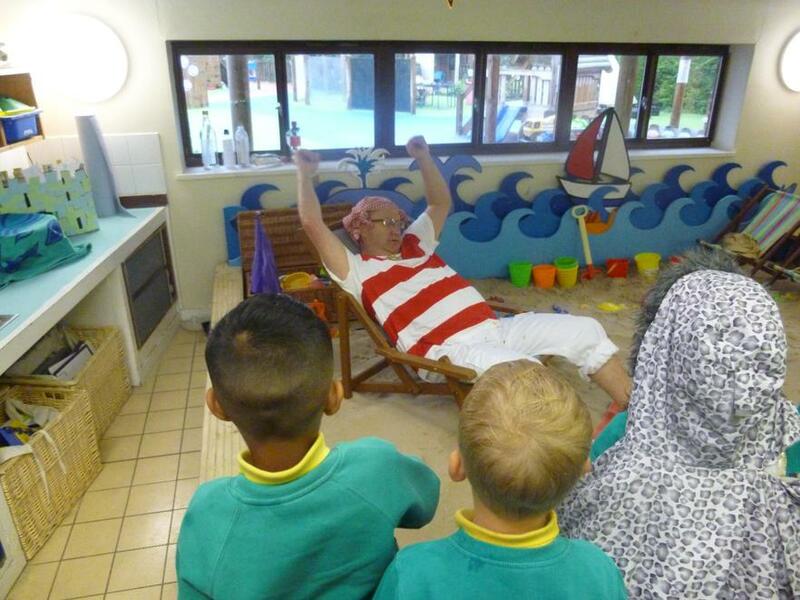 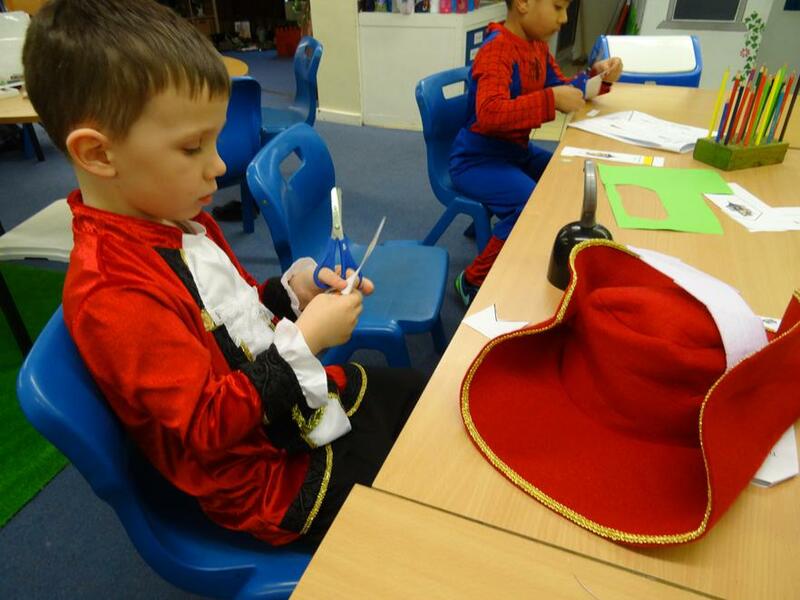 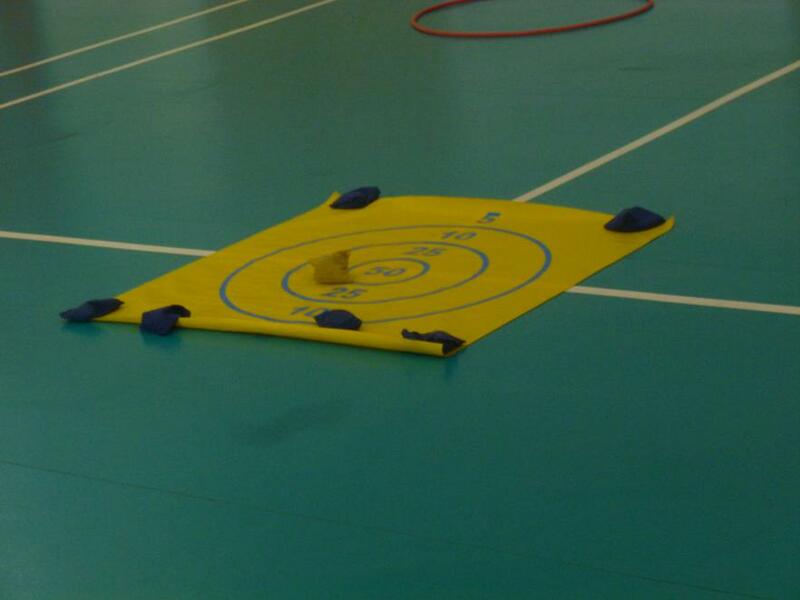 Year 1's were 'Jack' for the day! 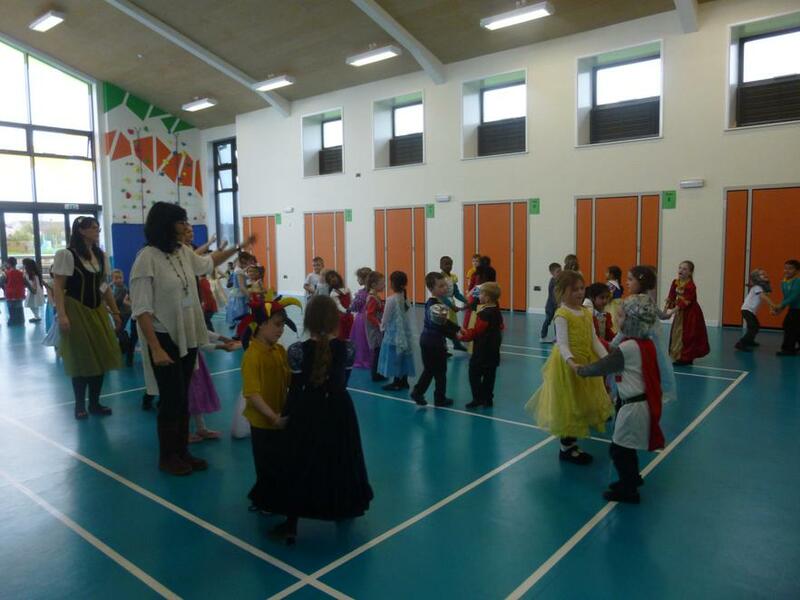 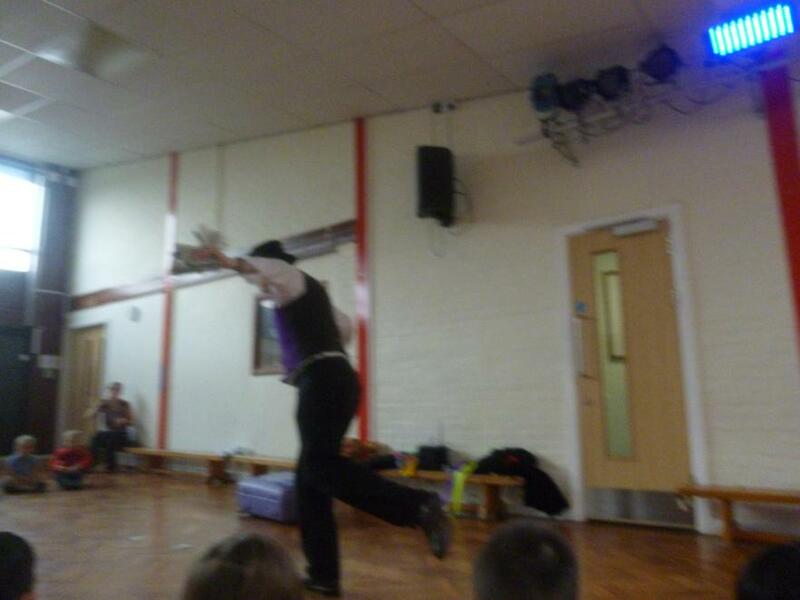 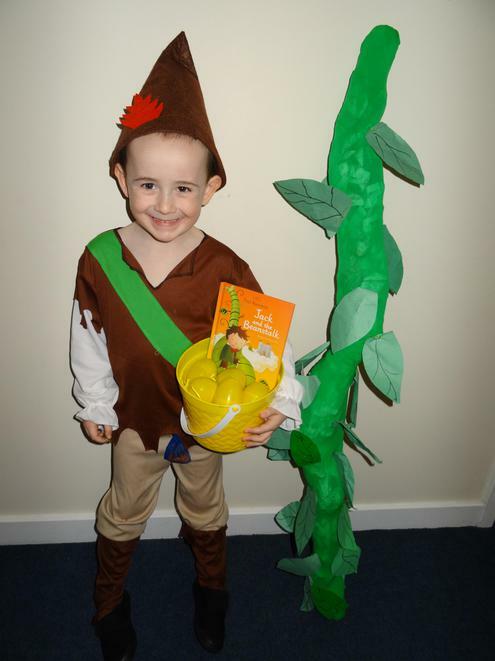 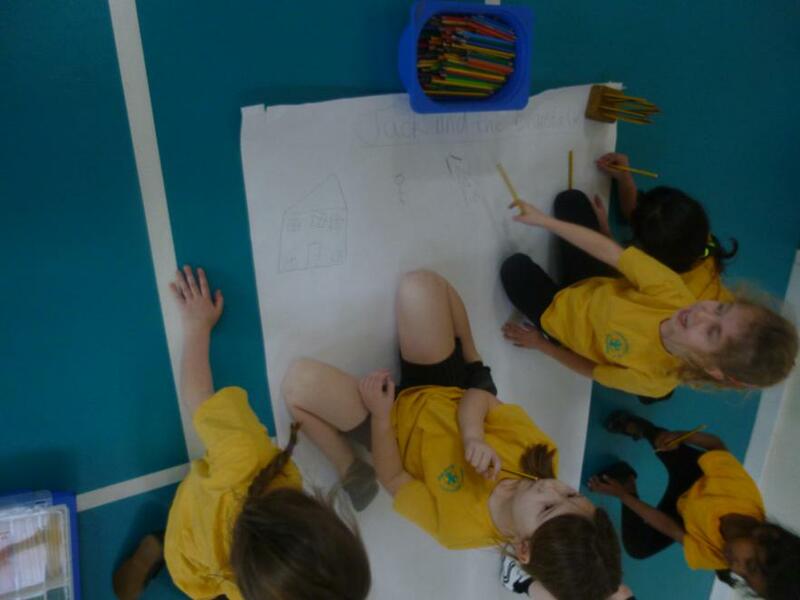 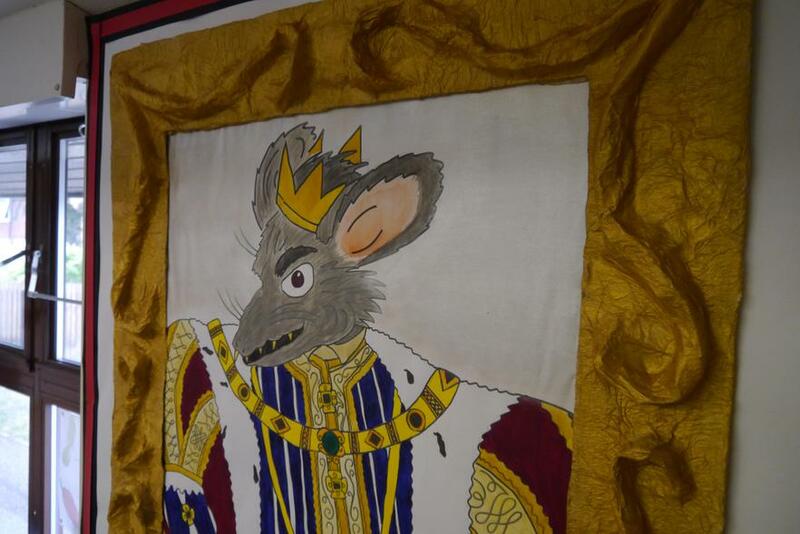 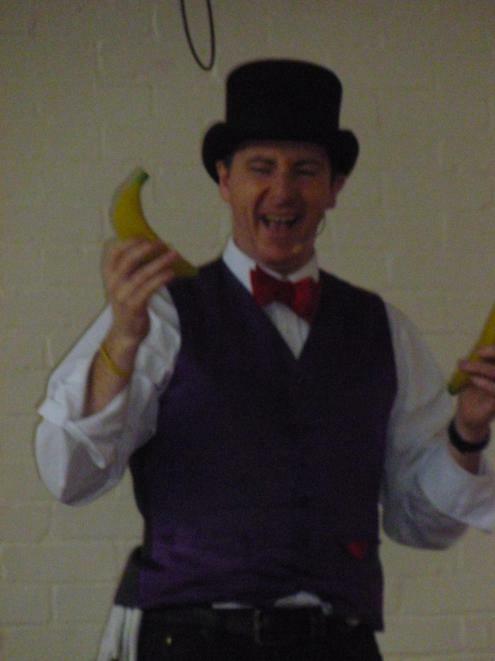 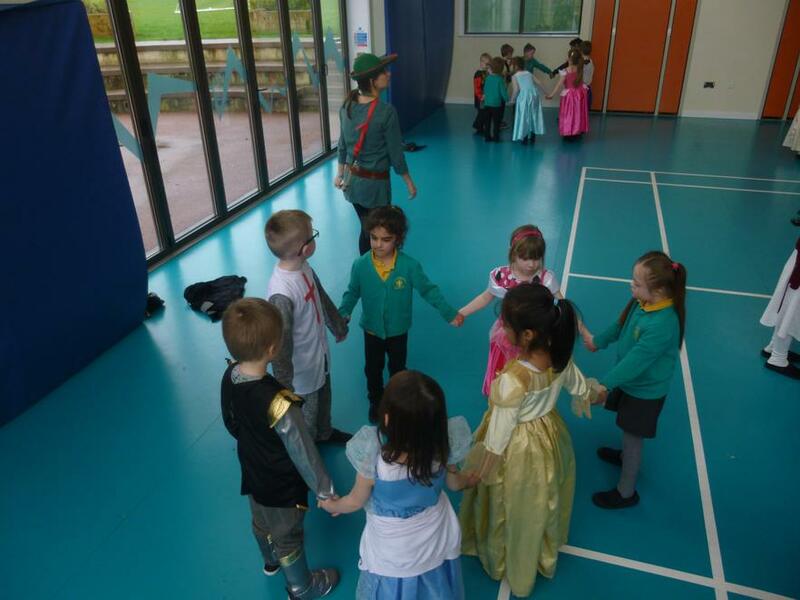 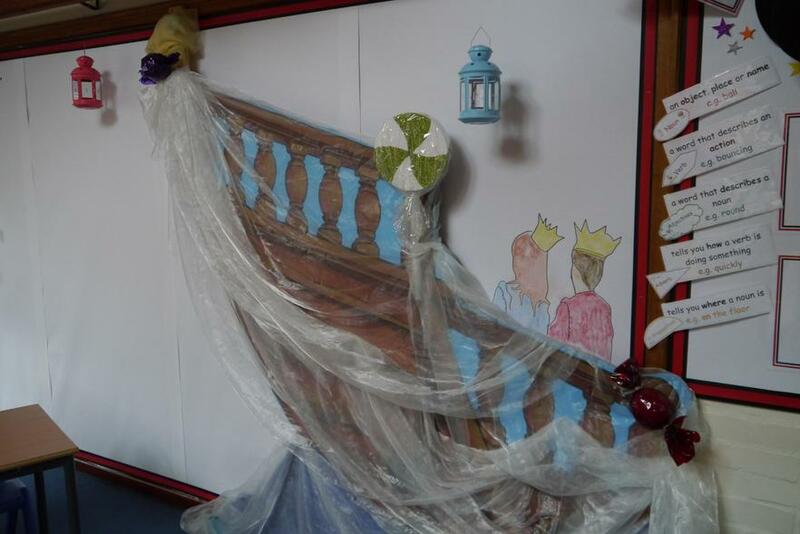 The Year 1 children thoroughly enjoyed their day on Monday, acting like Jack from the story, 'Jack and the Beanstalk'. 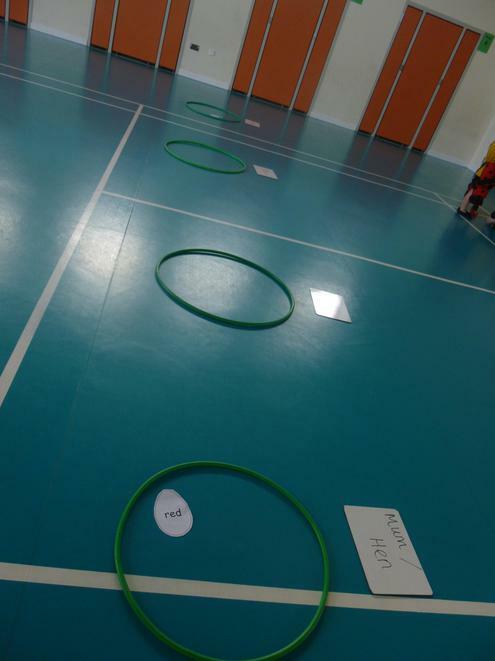 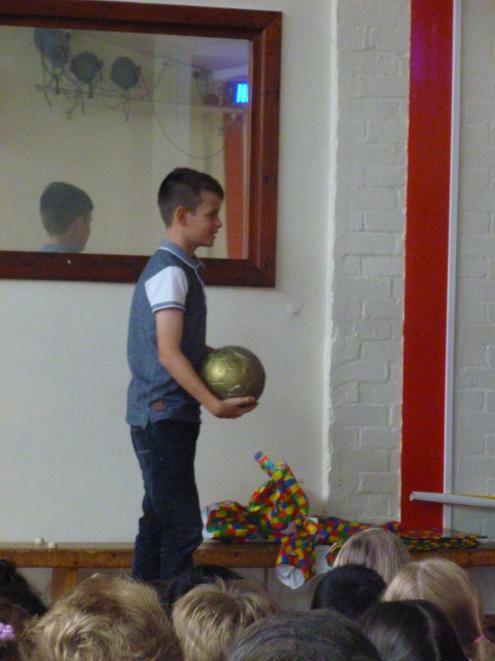 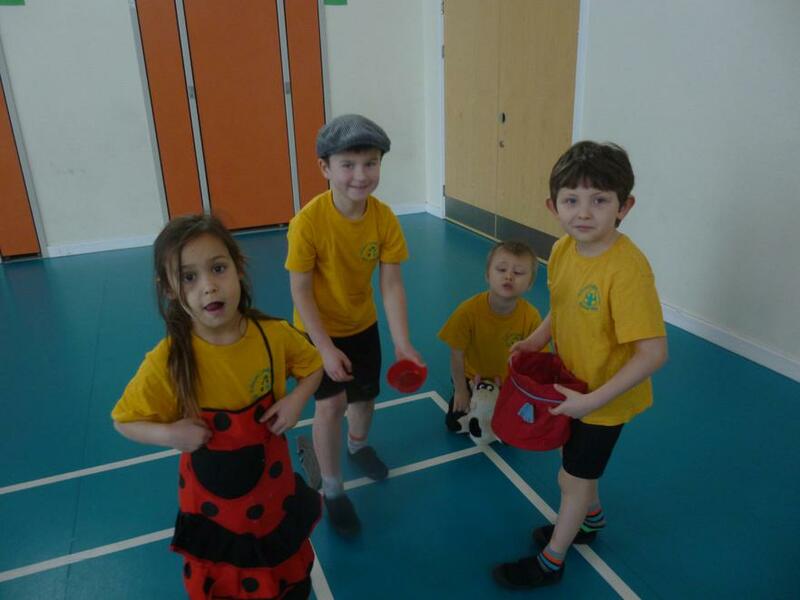 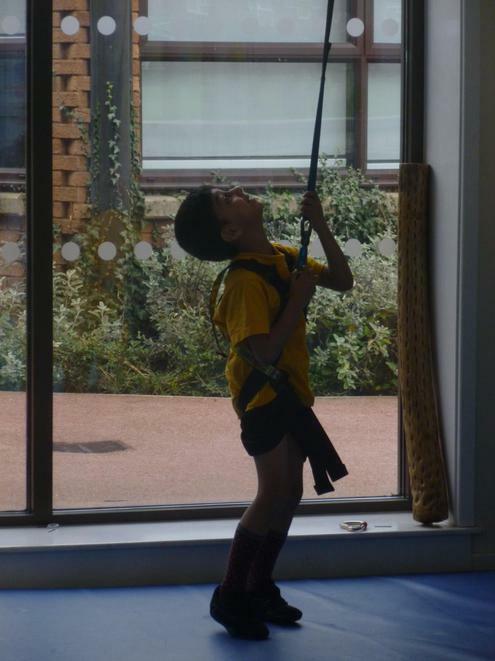 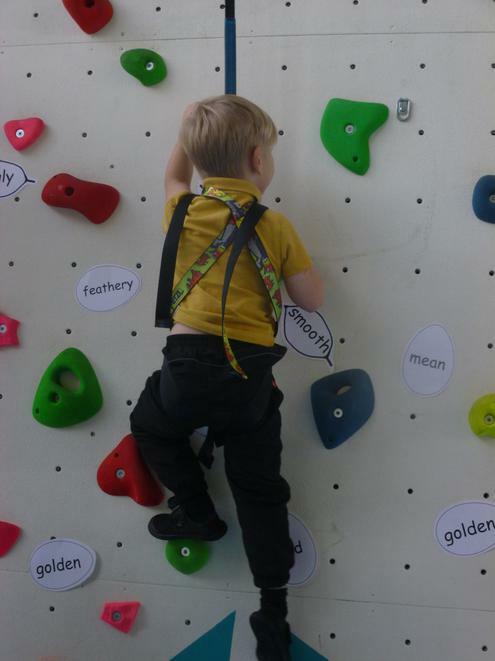 Just like Jack, they bravely climbed the 'beanstalk' in the sports hall with Mr Pickover and Mr Pearse's help. 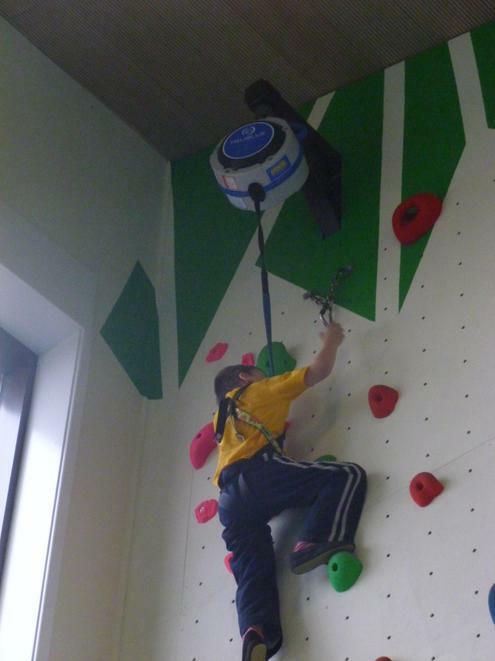 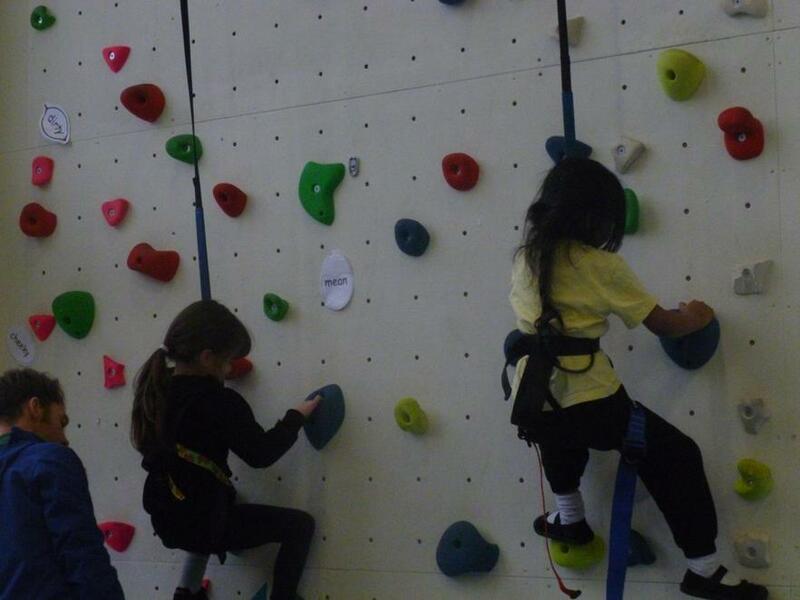 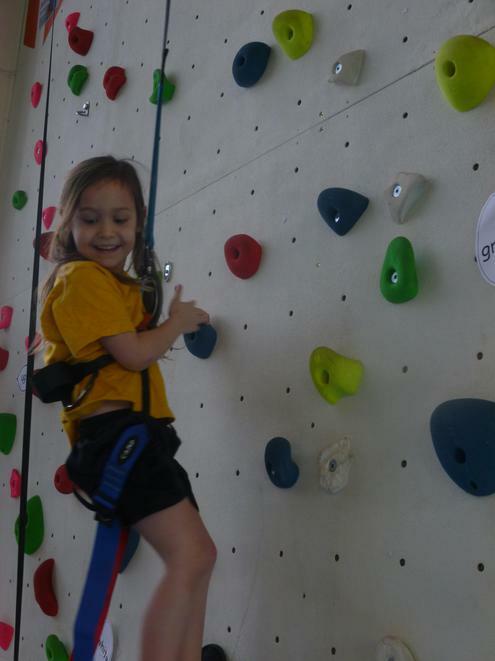 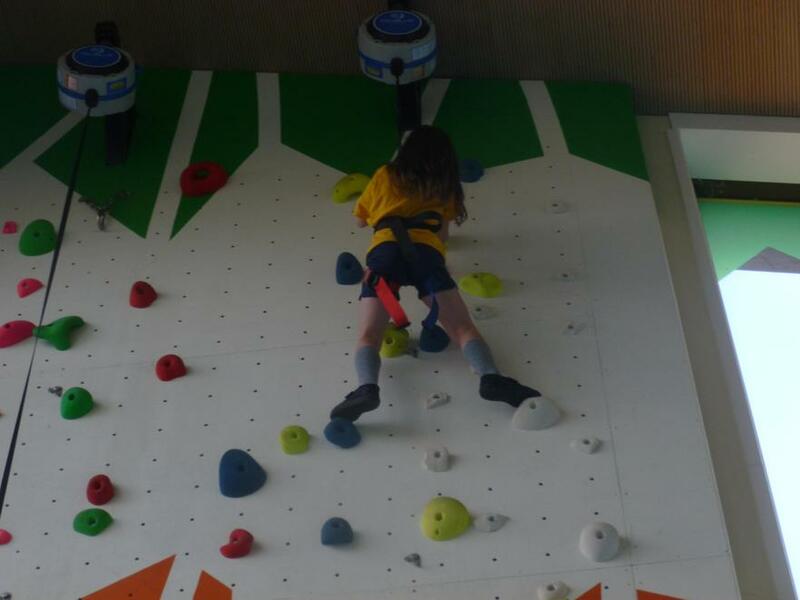 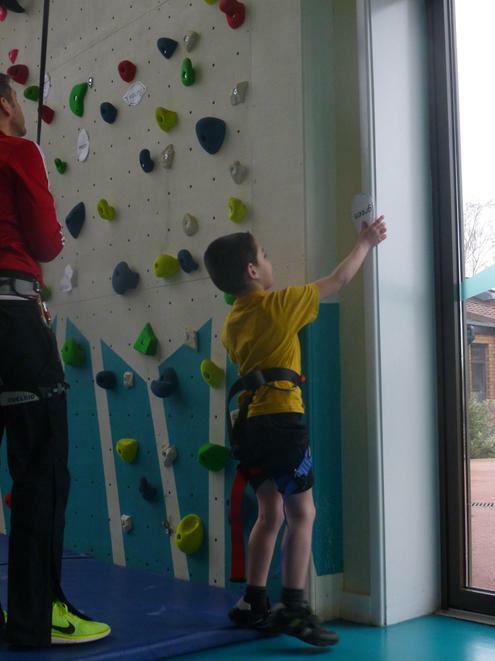 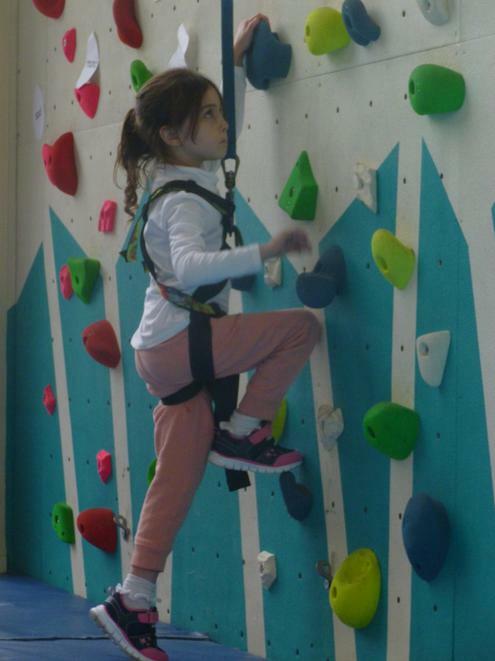 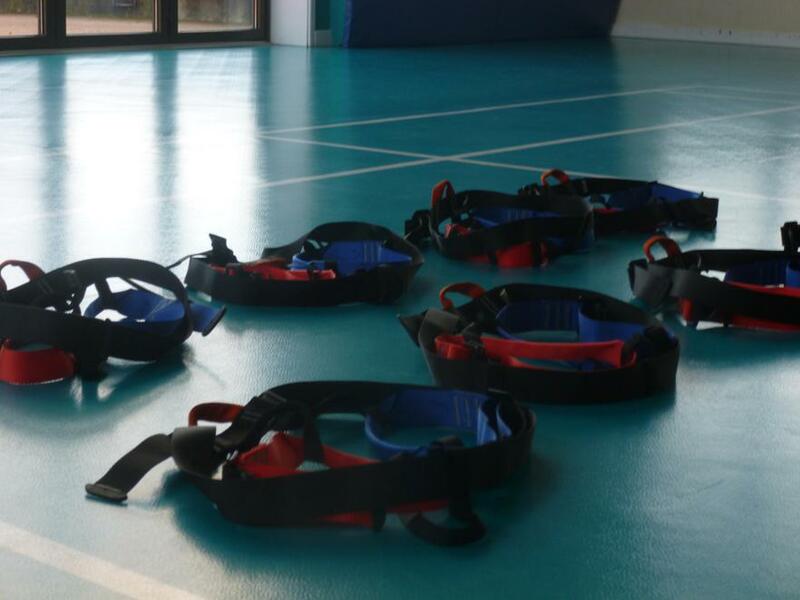 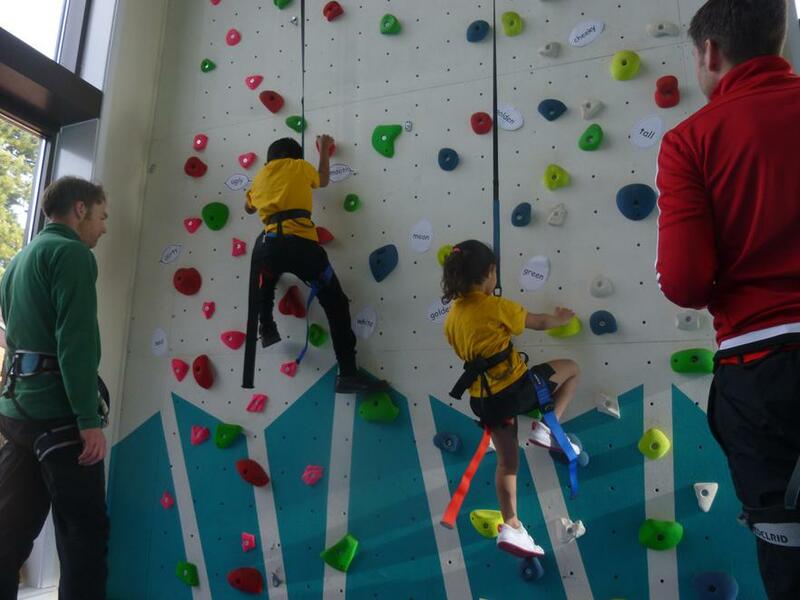 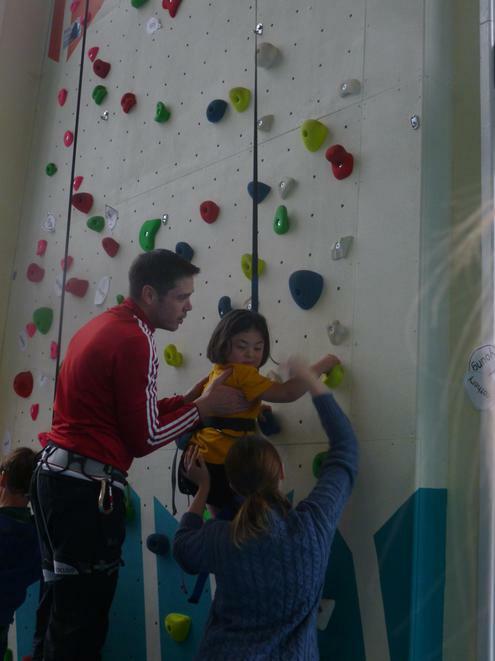 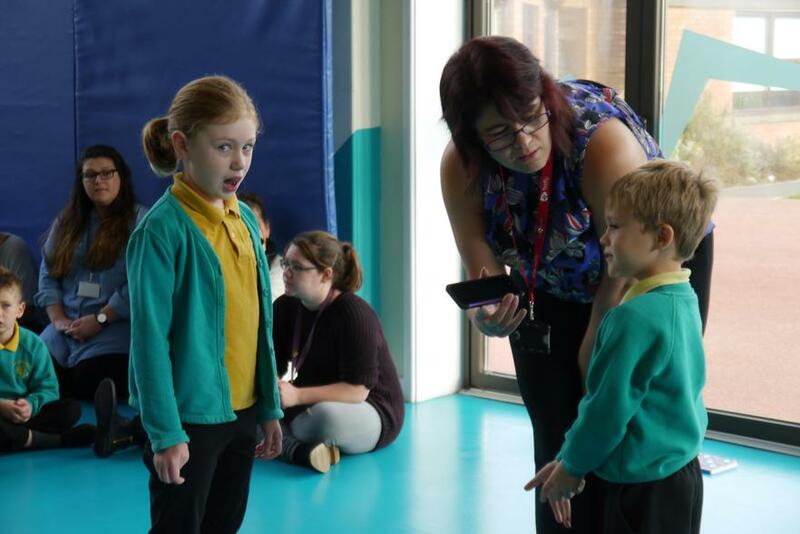 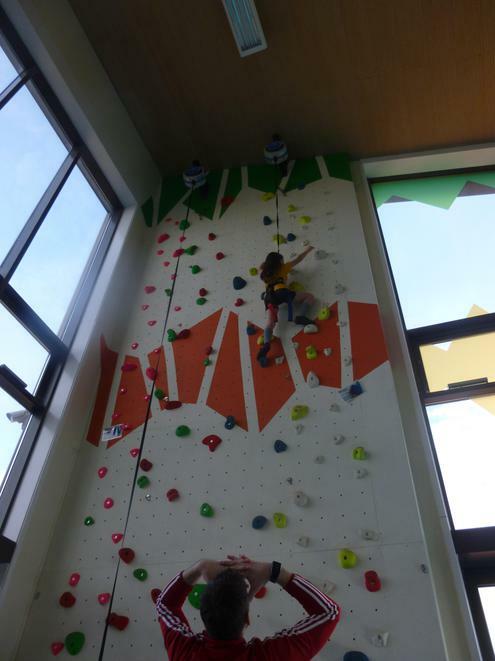 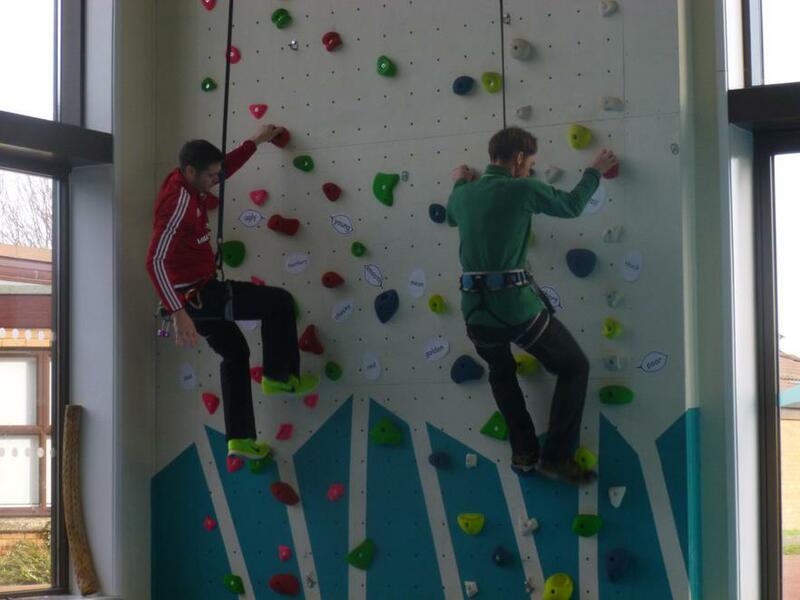 Every child climbed the climbing wall, and by looking at every child's face, they loved it! 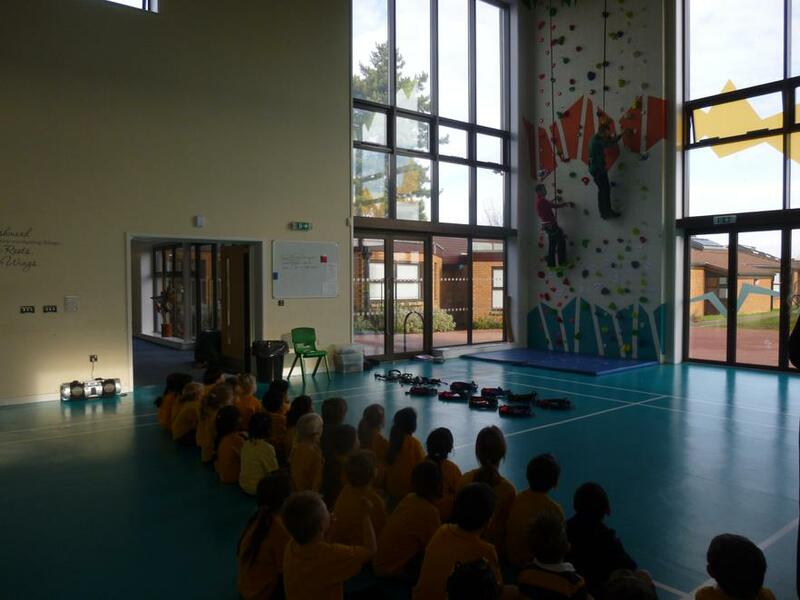 Mr Pickover was very impressed by those who climbed, and Mr Pearse was surprised to see so many children climbing all the way to the top! 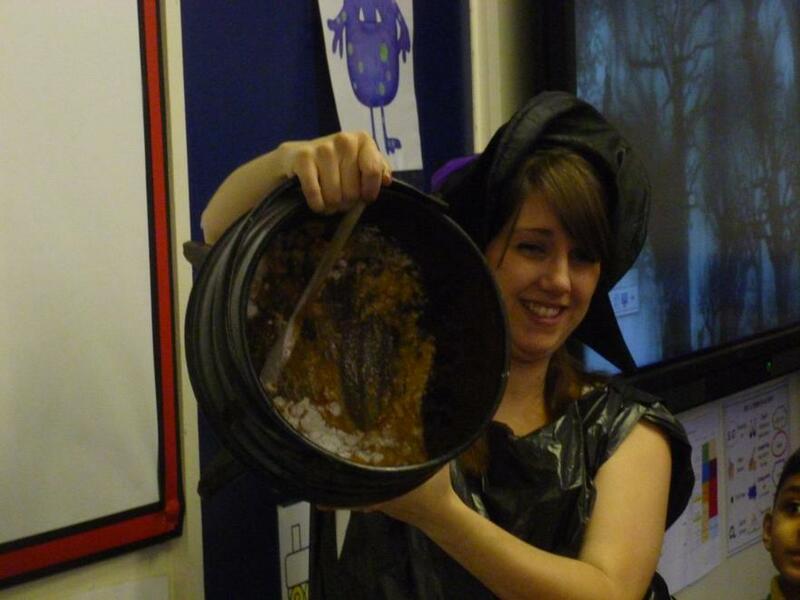 Miss Davis's Nanny, and Miss Skipp's sister are witches! 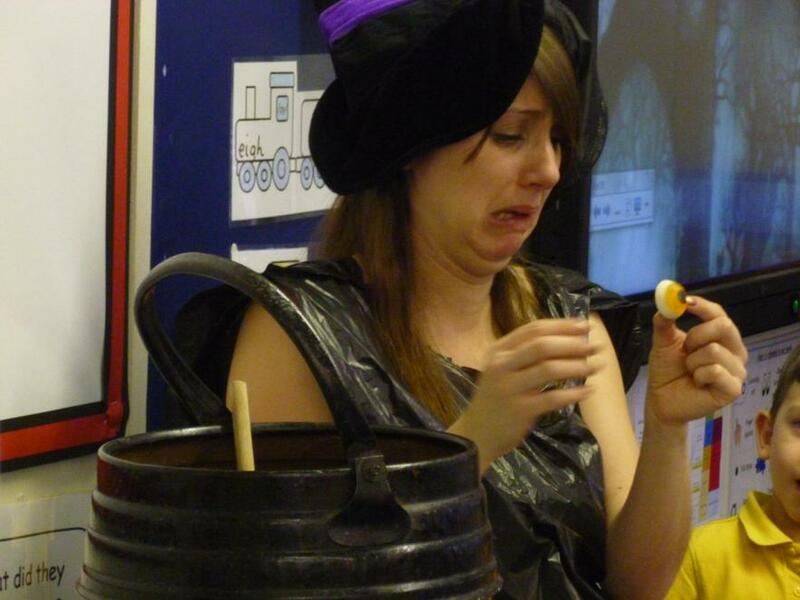 Year 1 had a visit from Miss Davis, who told us all that her Nanny was a witch! 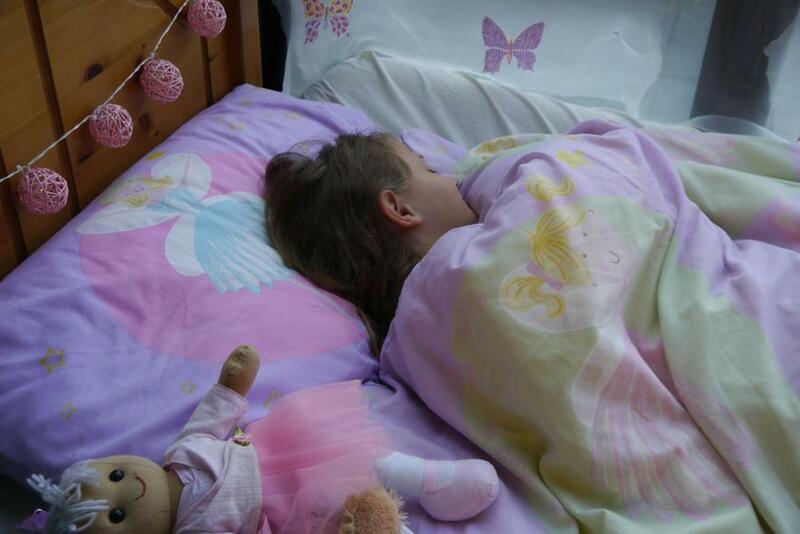 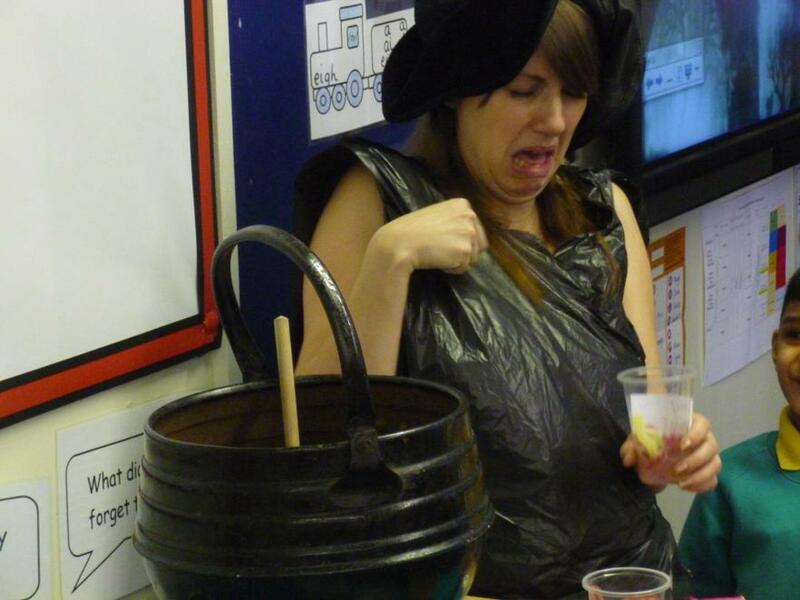 We watched Miss Davis create a potion that her Nanny makes to make grown ups fall asleep! 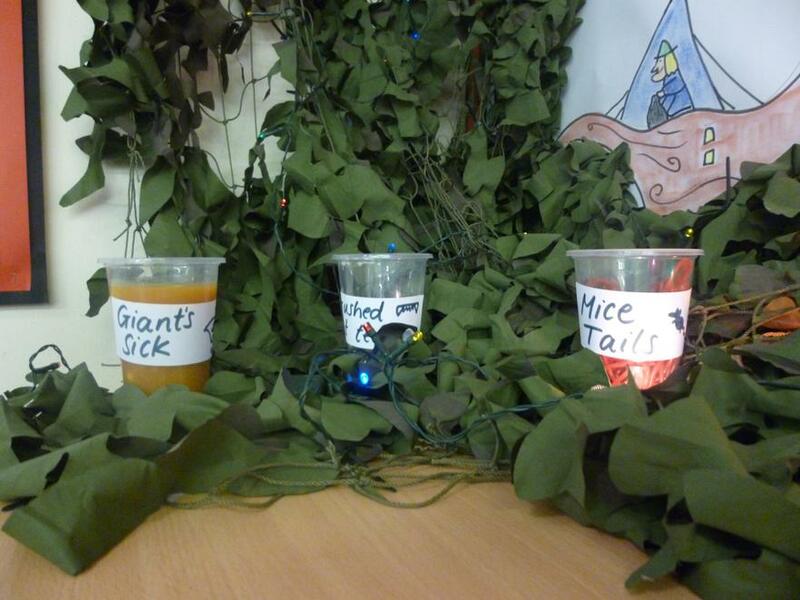 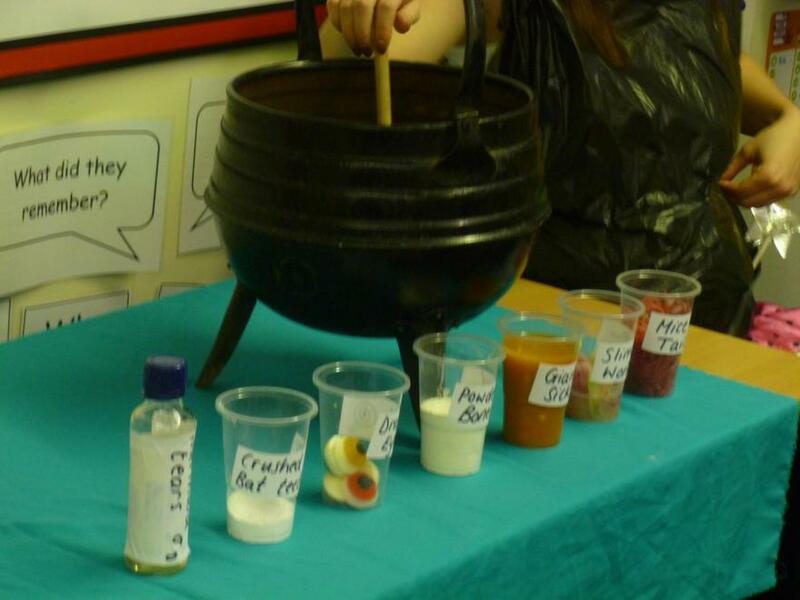 We then did some writing on the potion and made it really disgusting, using ingredients such as oozy giant's sick, gooey mice tails and slimy worms! 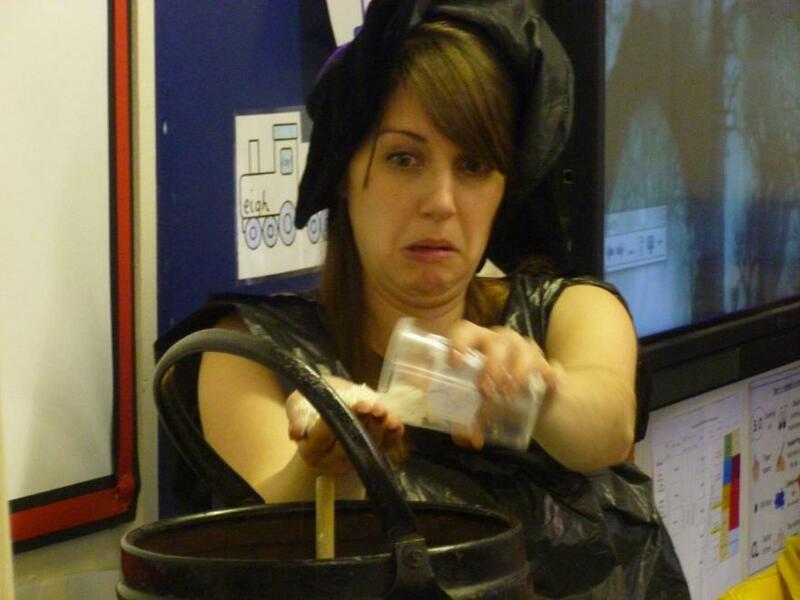 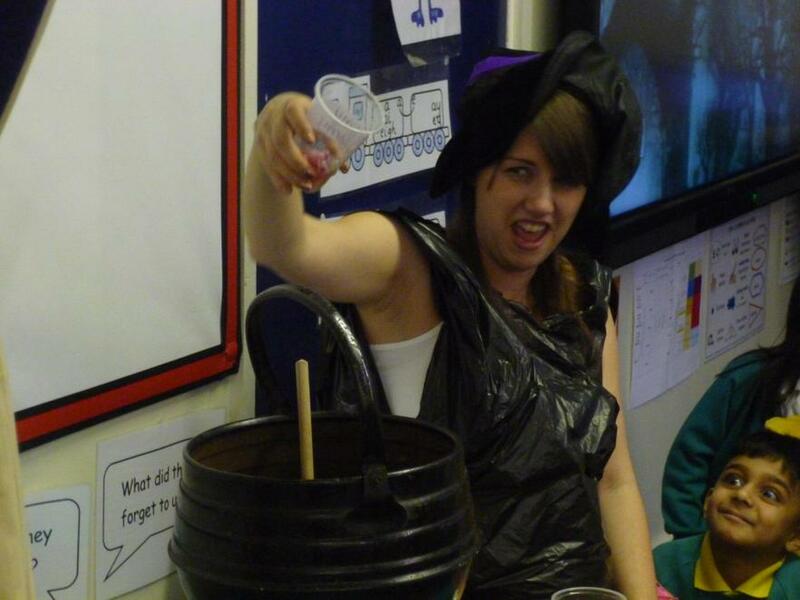 The Year 2's had a visit from Miss Skipp's sister, who also made a gruesome potion! 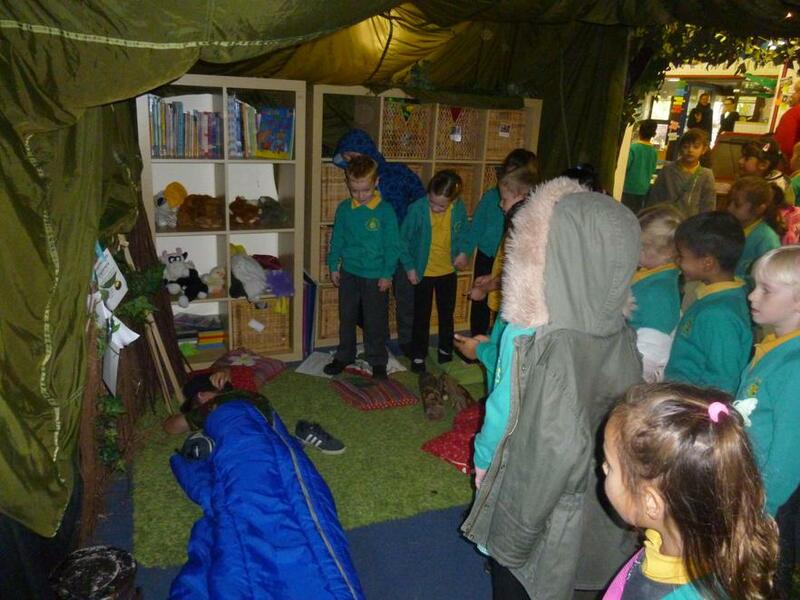 Here are some of the photographs from the experience. 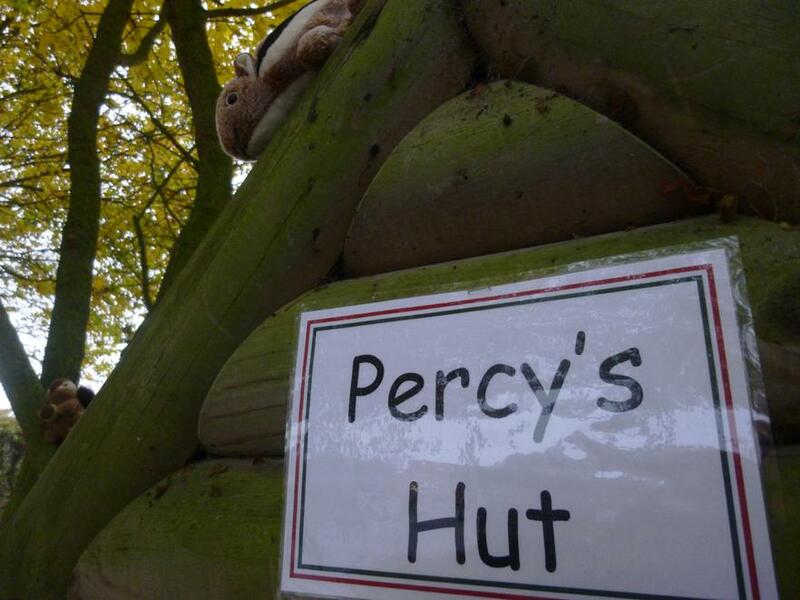 Percy came for a visit! 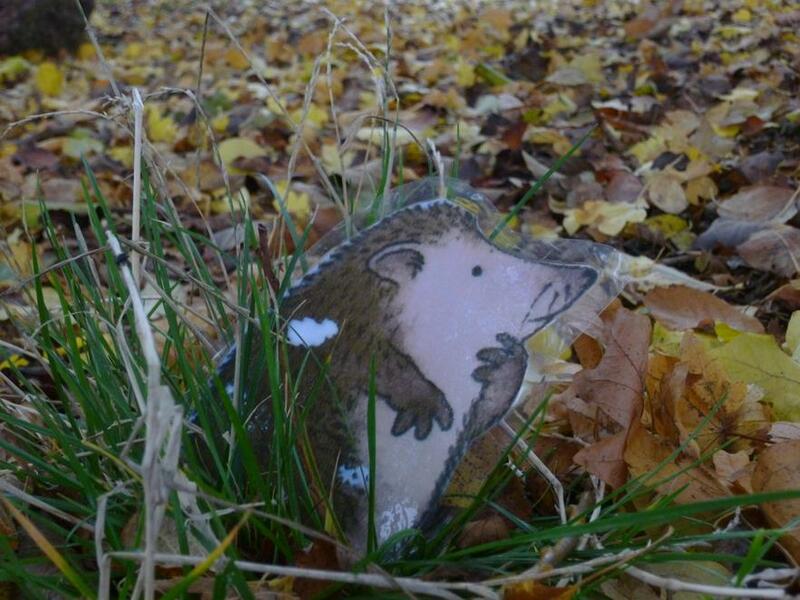 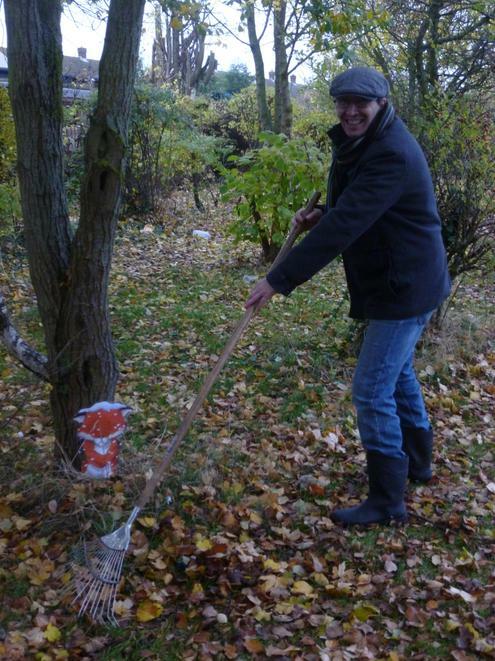 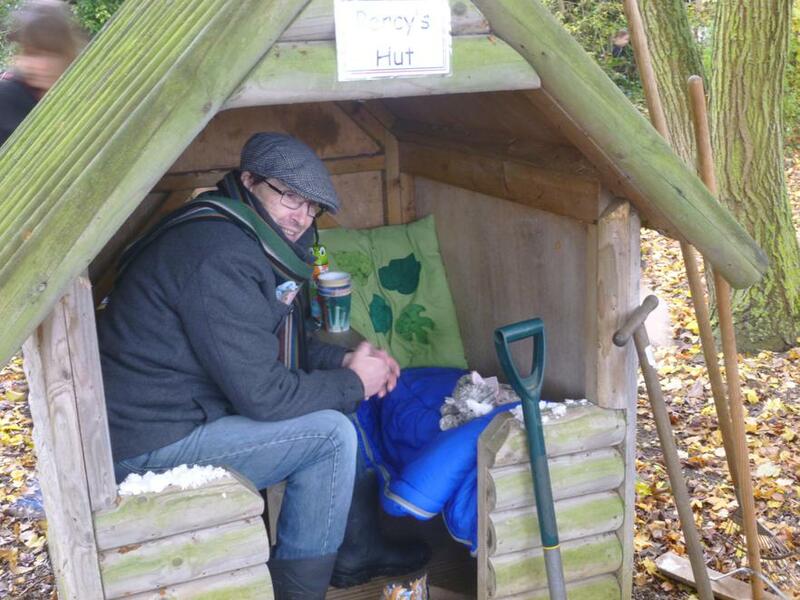 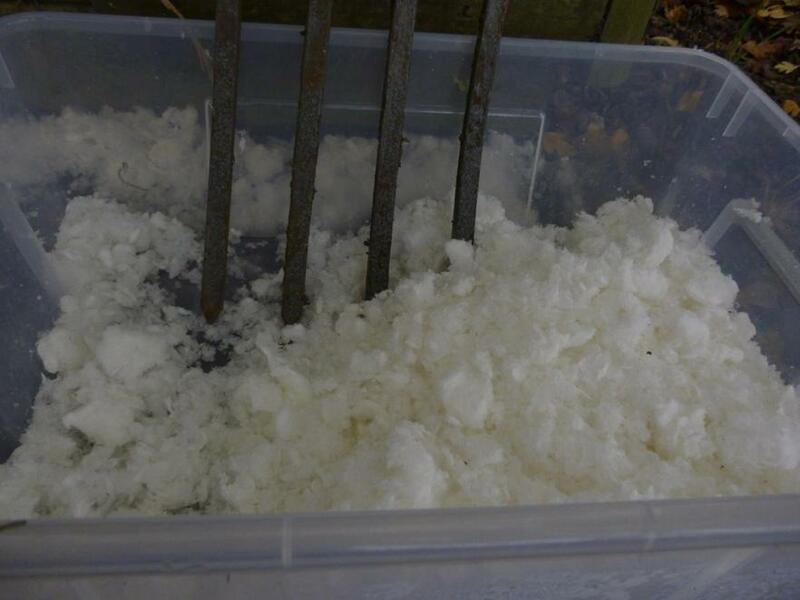 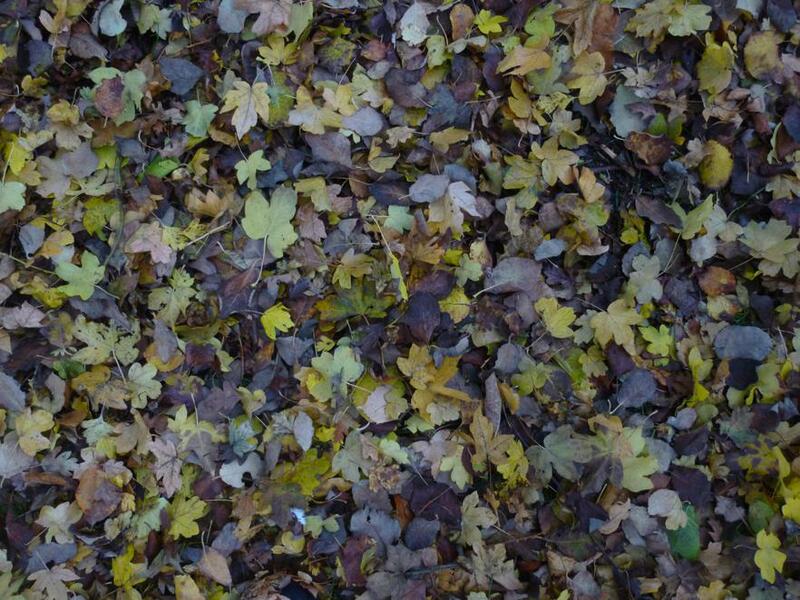 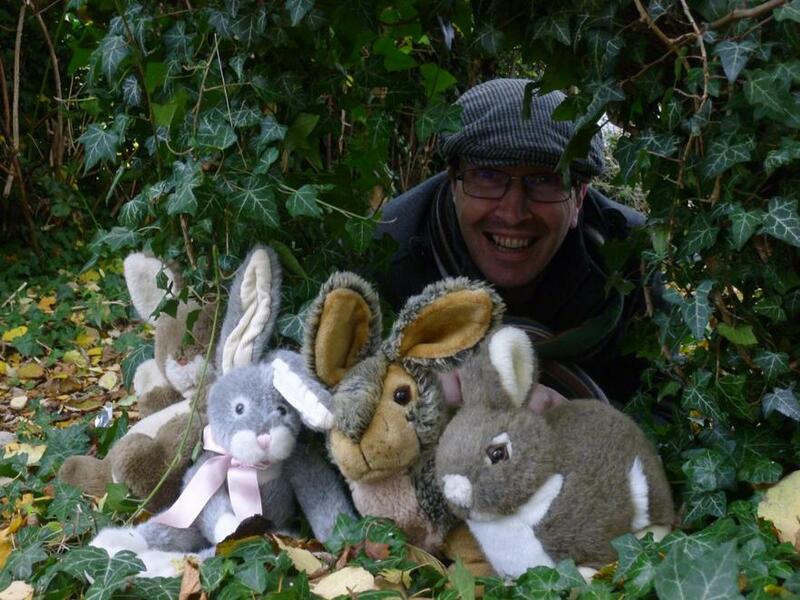 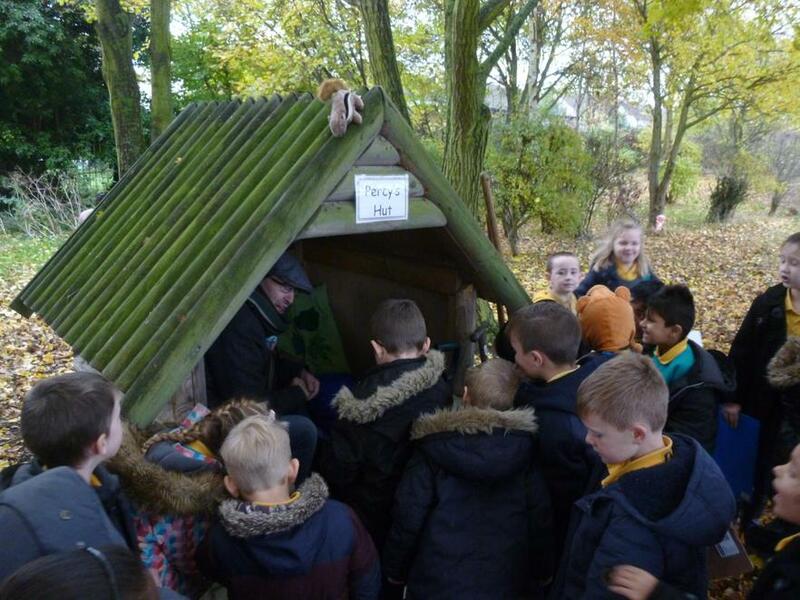 Year 1 and Year 2 have been studying the story of 'One Snowy Night' - a story set in a frosty, wintery park where Percy the park keeper lives and works. 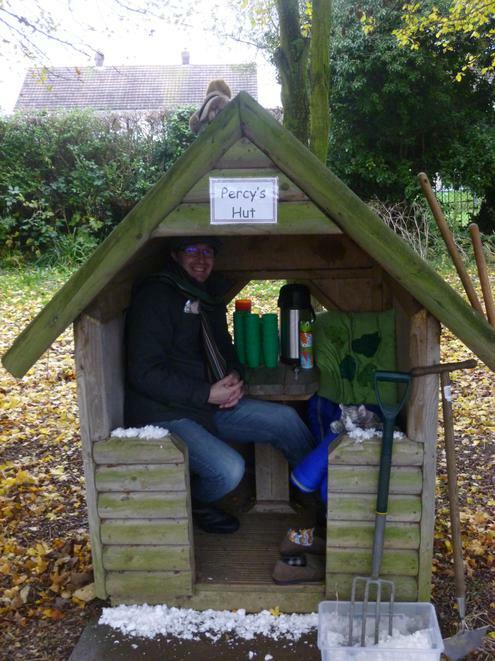 On a very cold night, one by one, his animal friends appear at his hut asking for shelter but soon there's no room in the bed for Percy! 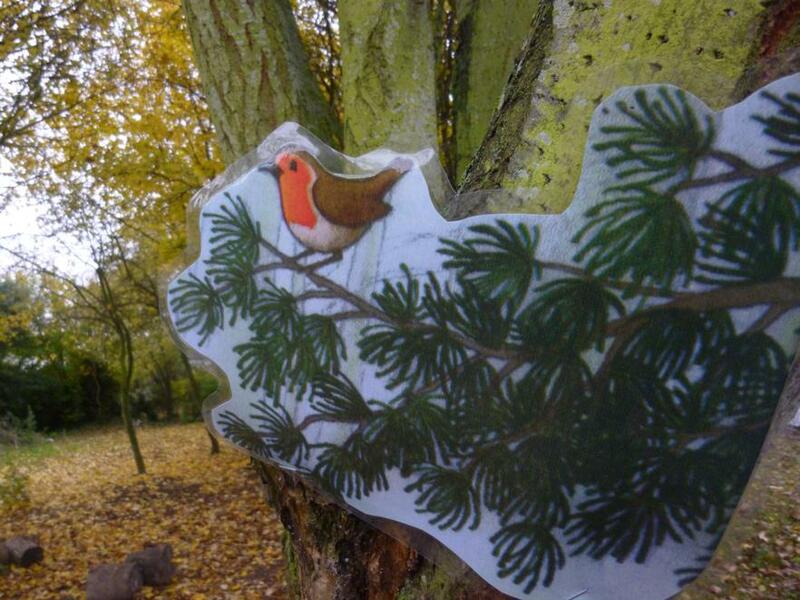 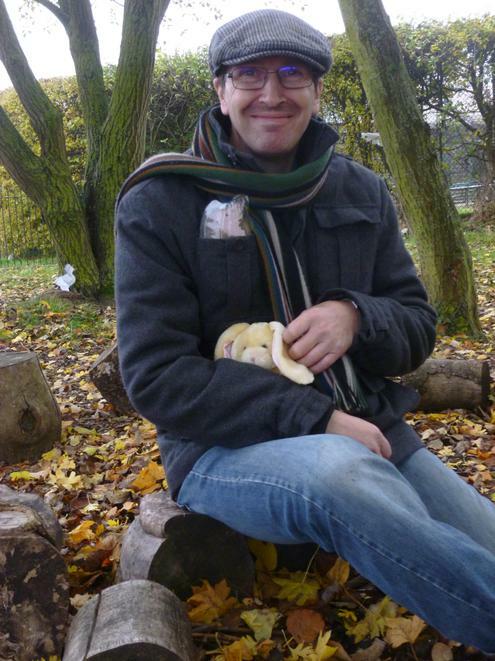 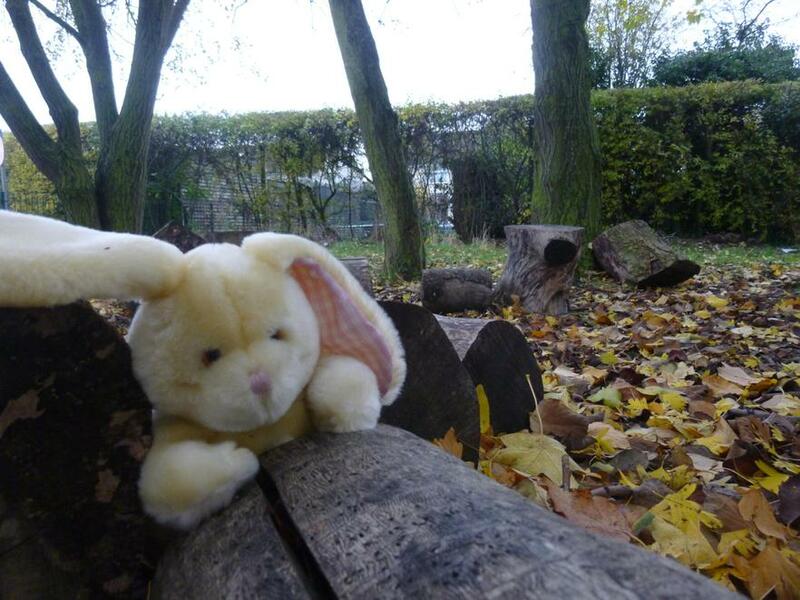 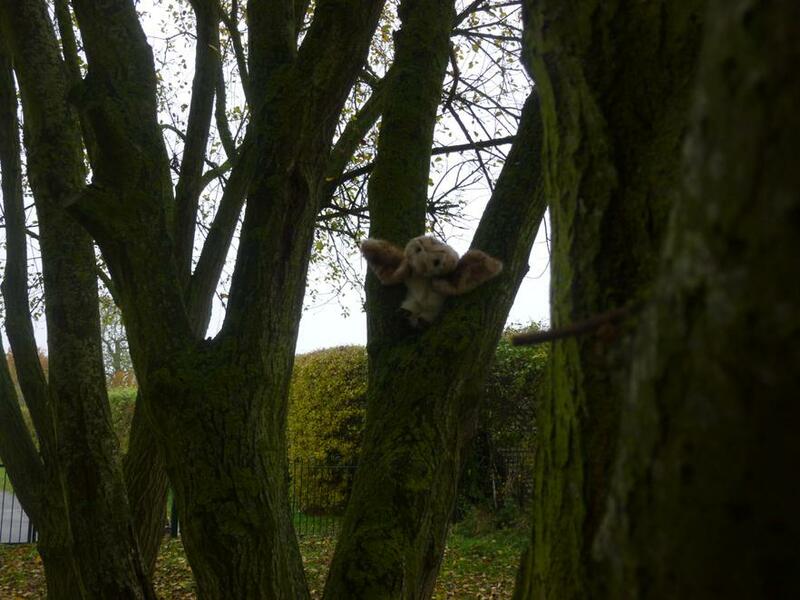 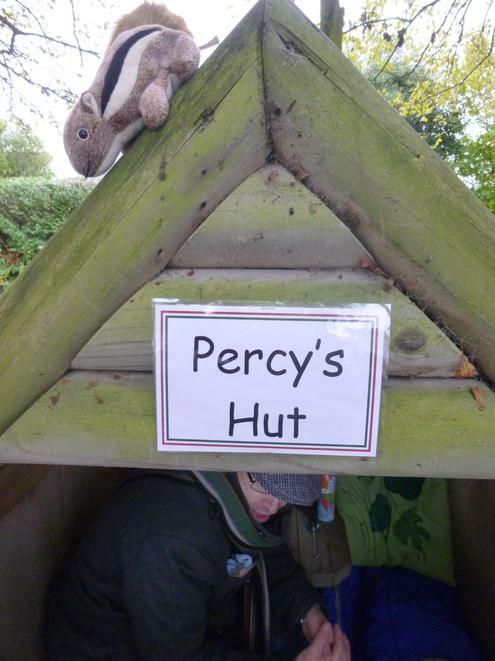 Year 1 went to the forest school to meet Percy and collect adjectives and to experience park life! 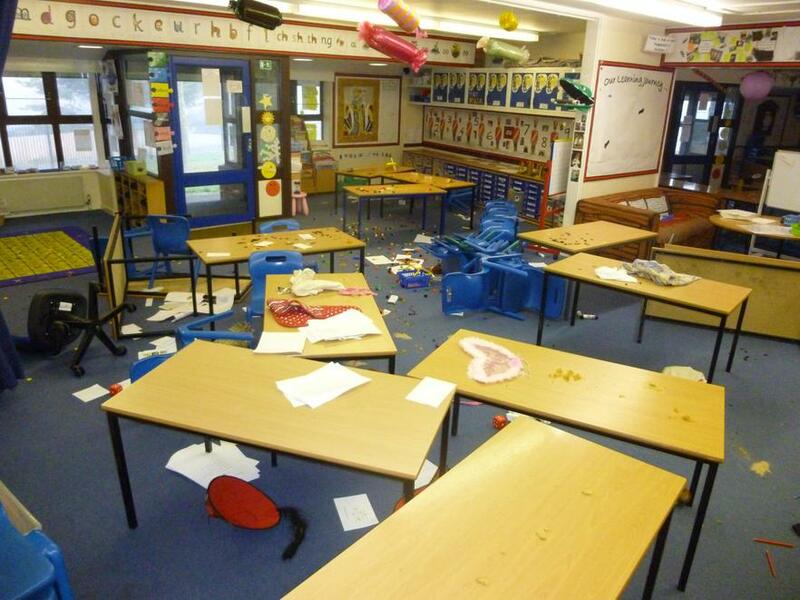 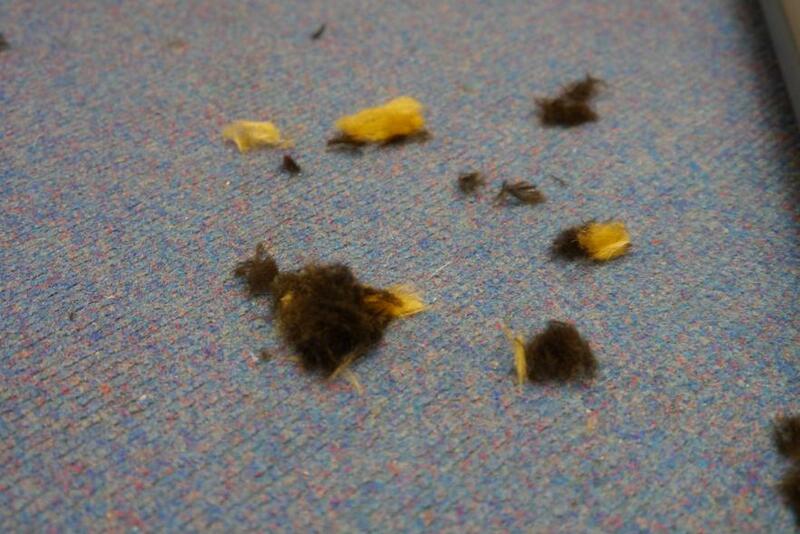 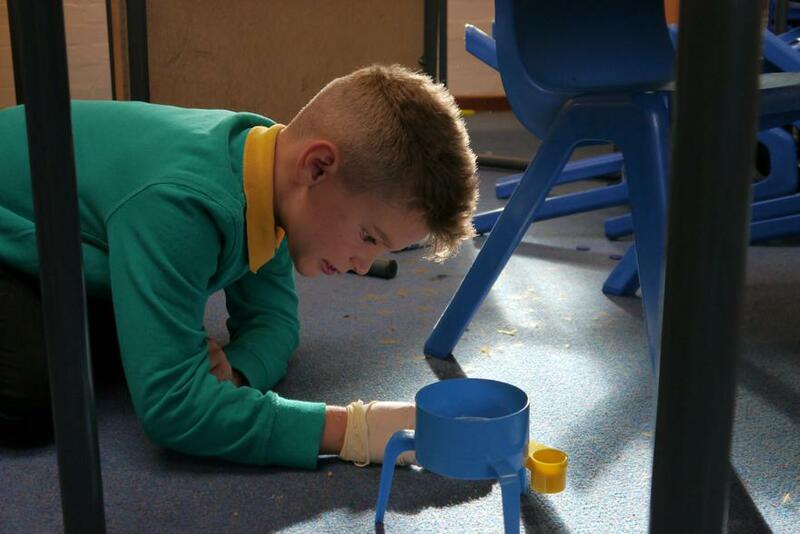 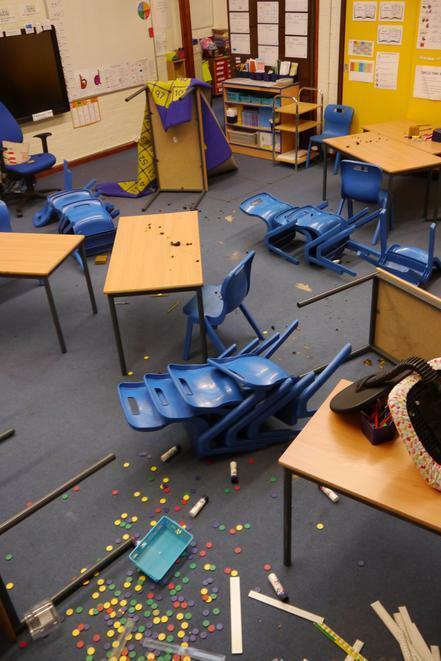 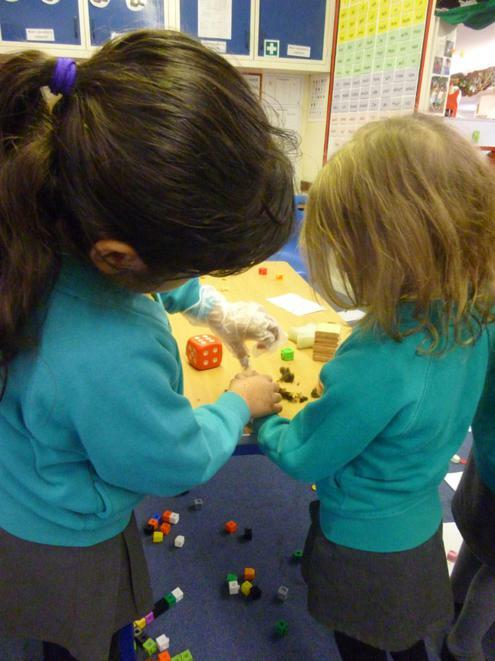 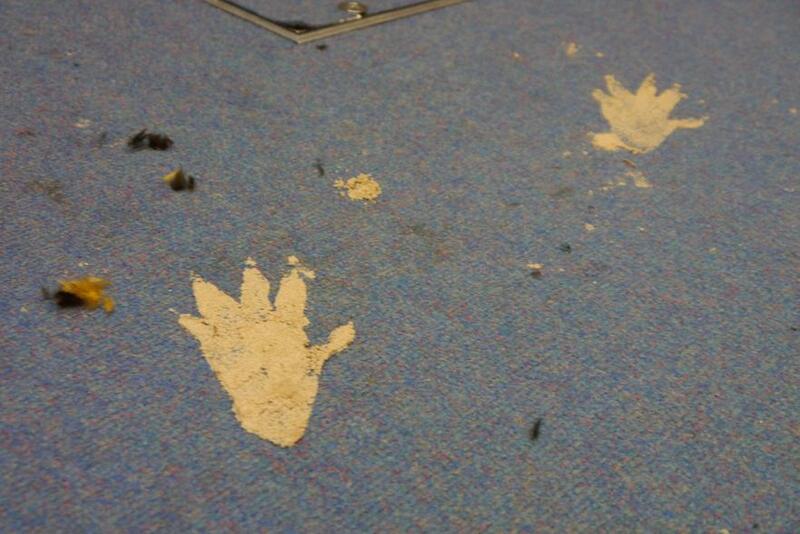 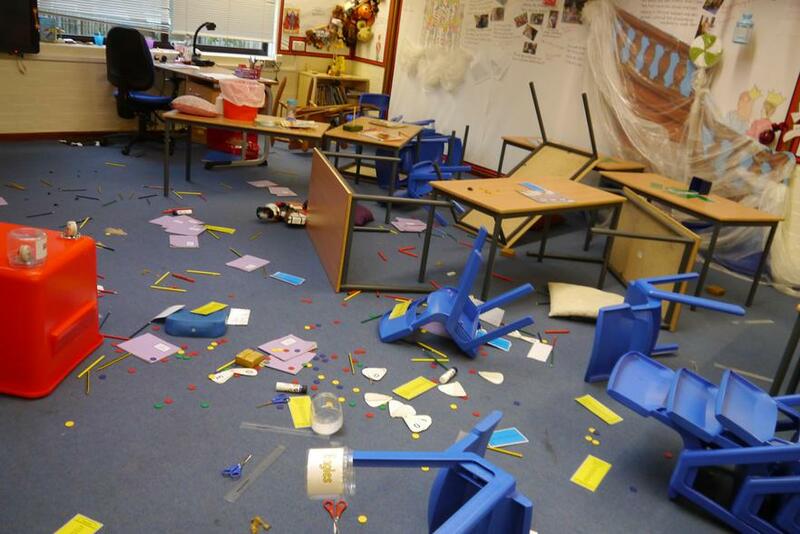 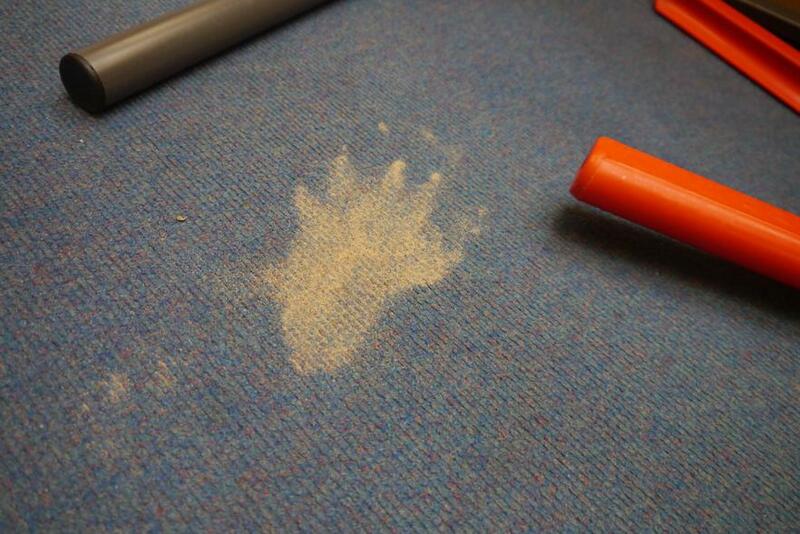 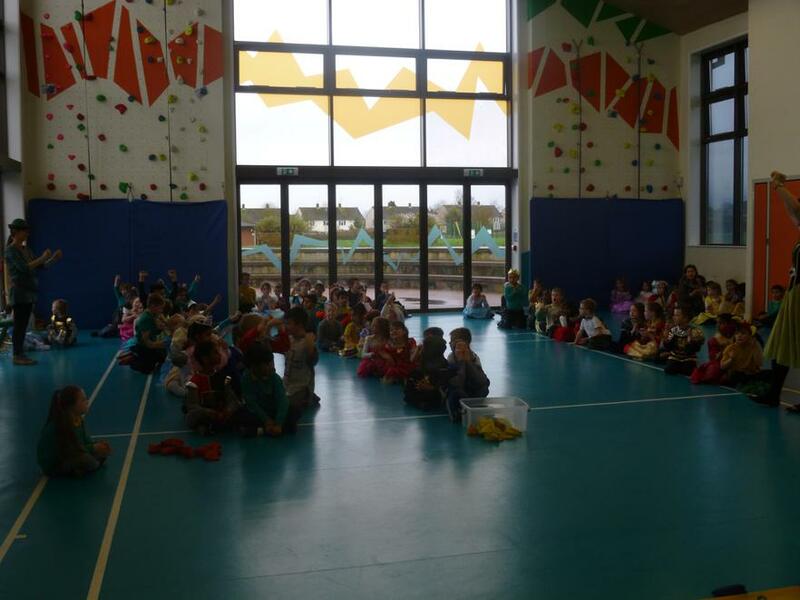 On Monday 31st October, we came to school and there was such a mess! 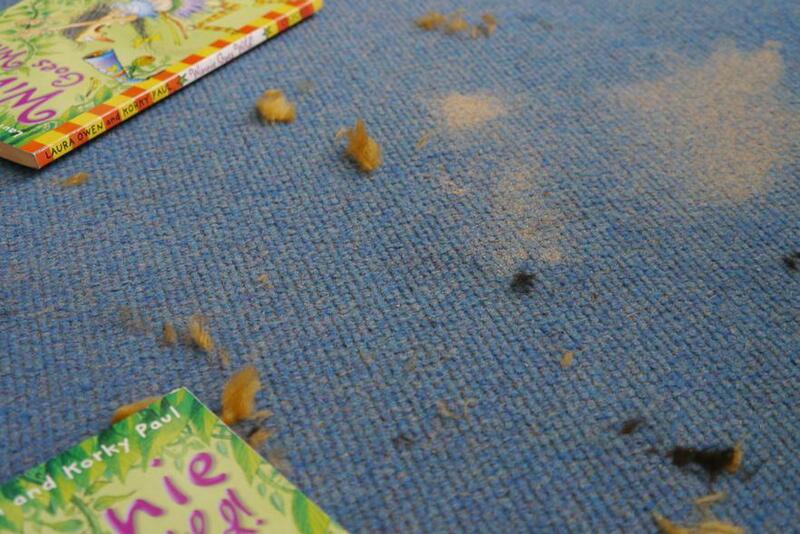 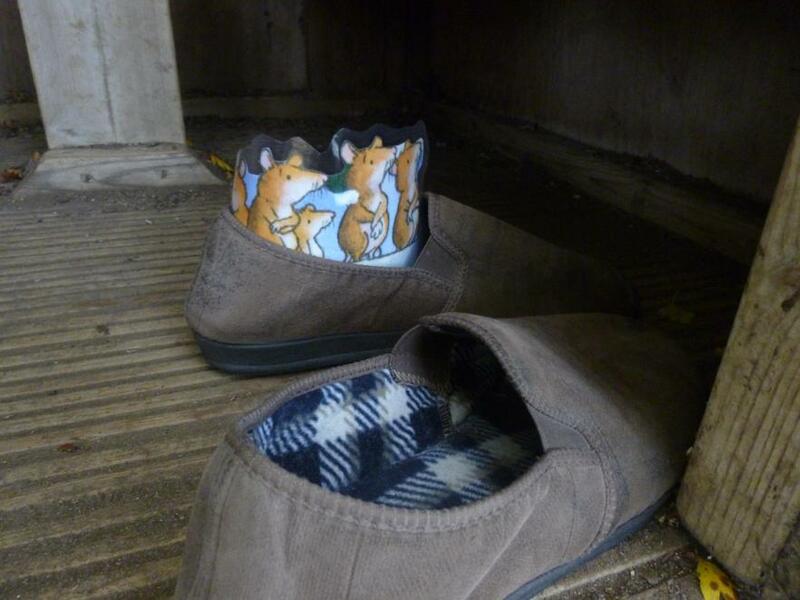 There was orange, warm fur on the floor and lots of biscuit crumbs scattered all over the carpet. 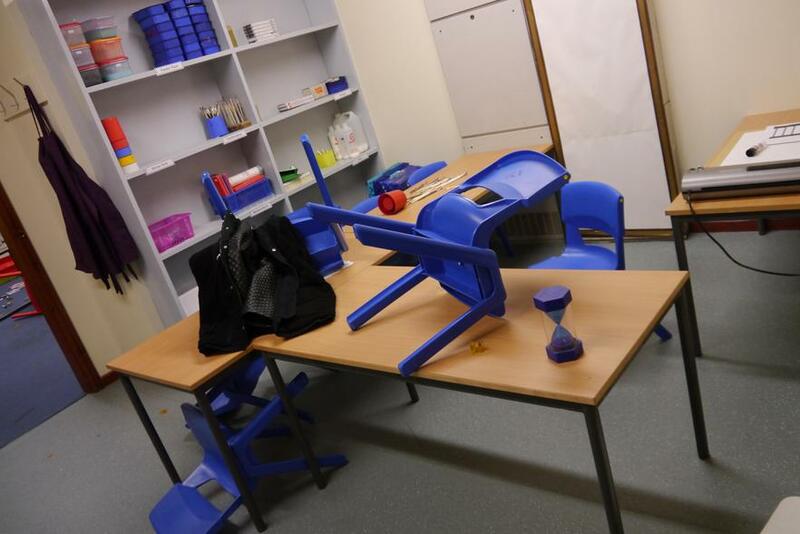 The tables were upside down and the chairs were knocked over. 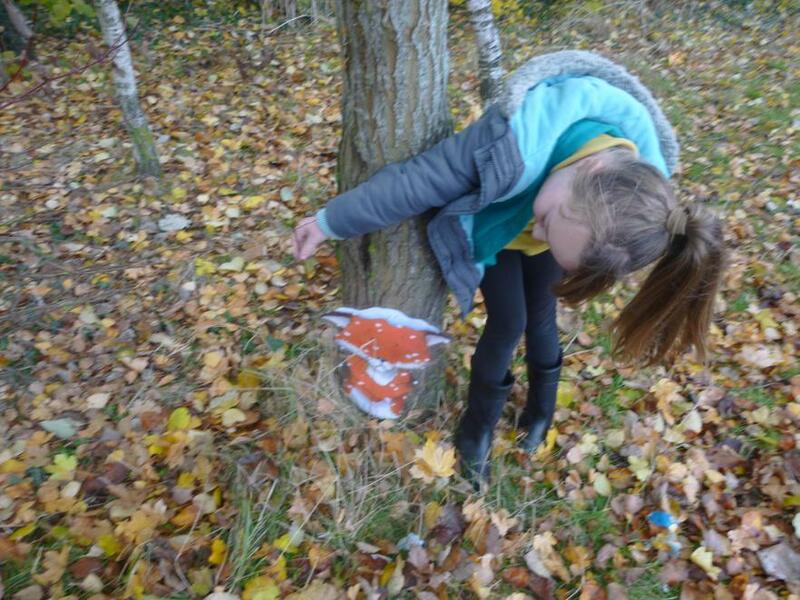 We didn't know what to do. 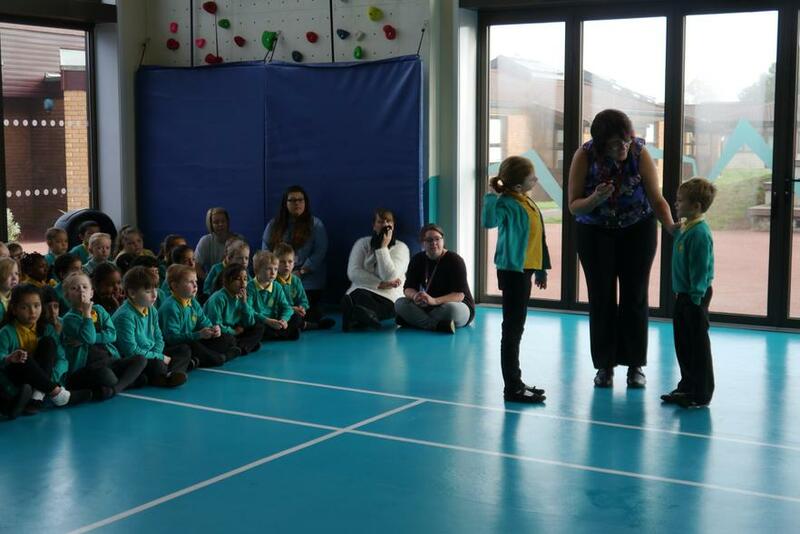 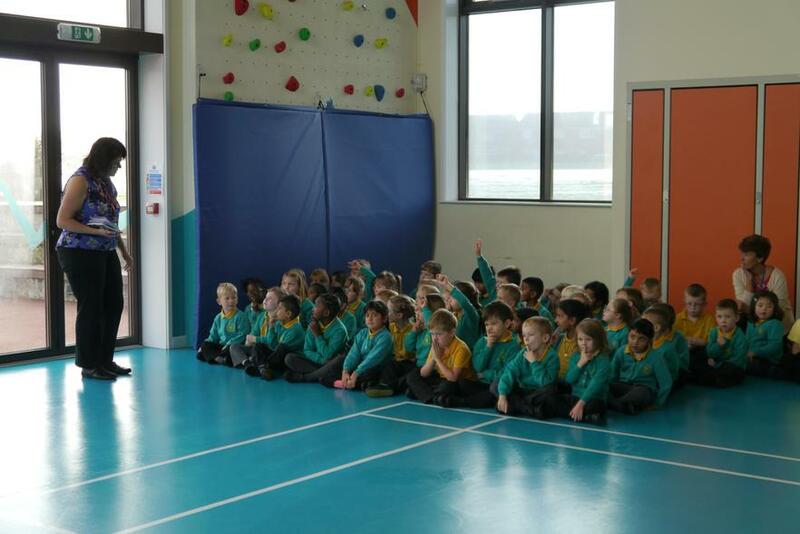 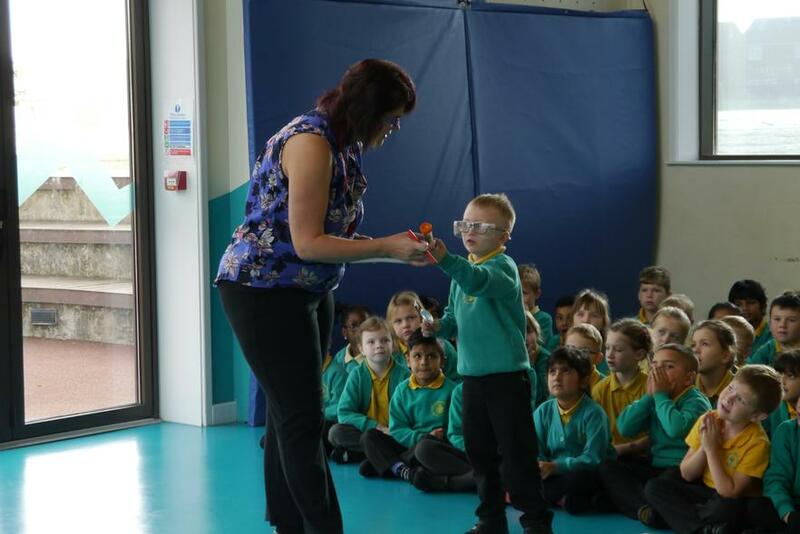 We had an assembly with Miss Govier and she rang the police station. 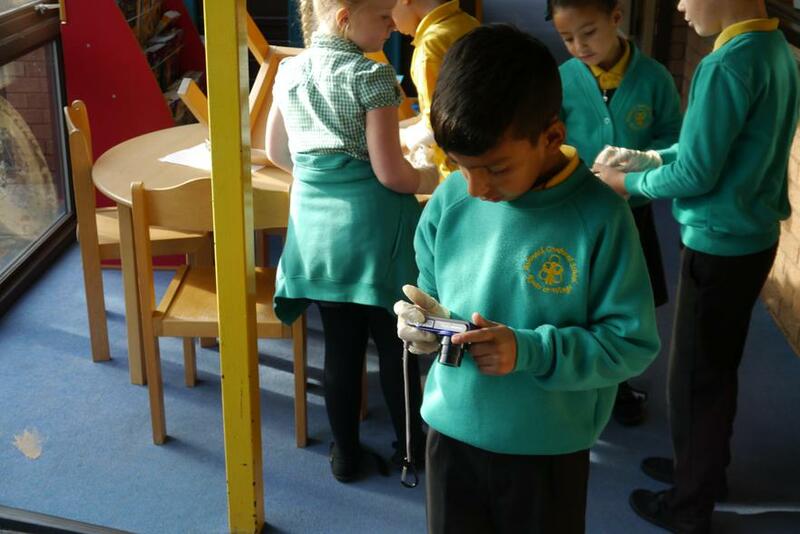 We all had to collect evidence and write a report. 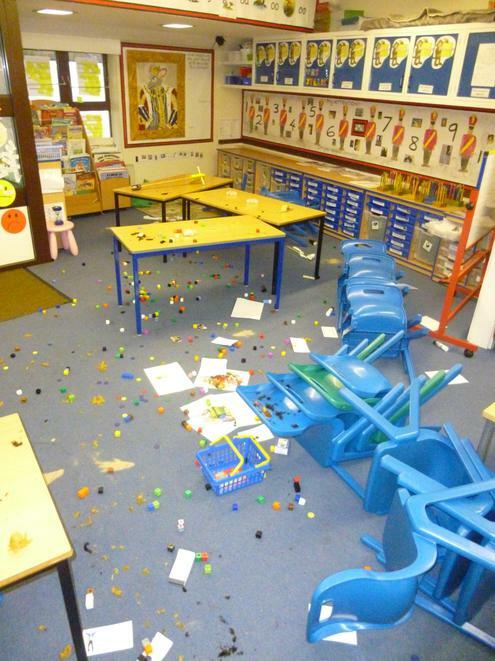 We wonder who caused all the mess?! 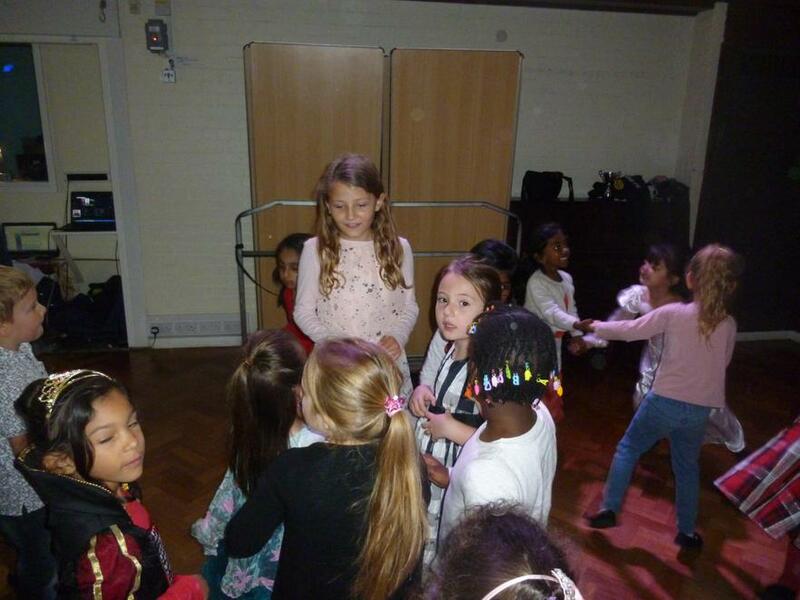 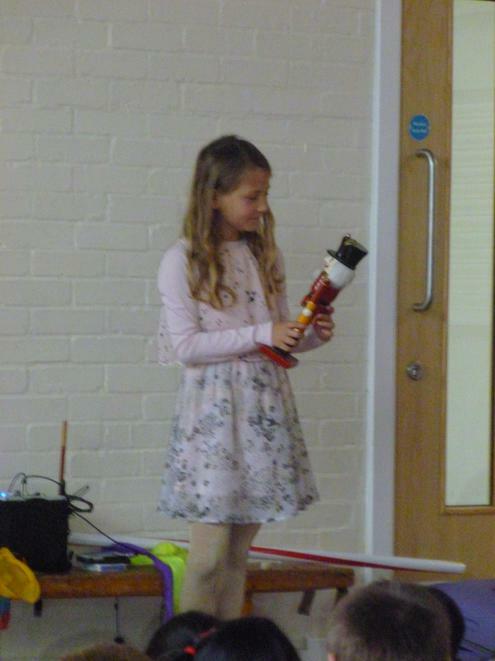 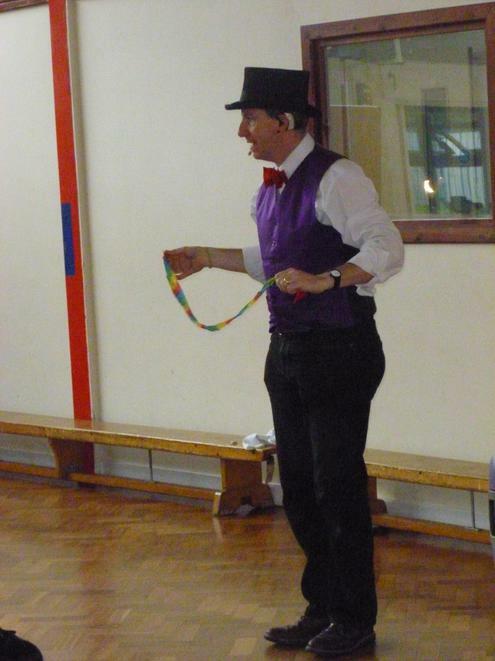 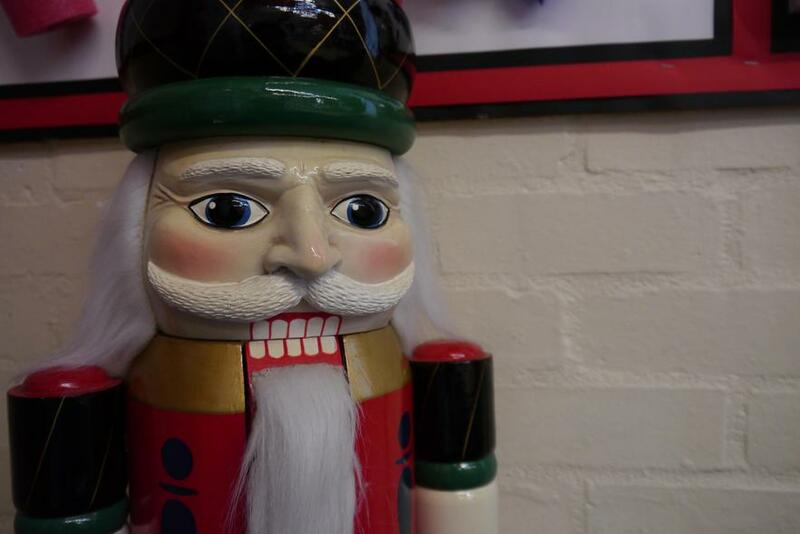 We all went to the school hall to have a little party with Franz and Clara on Friday 21st October. 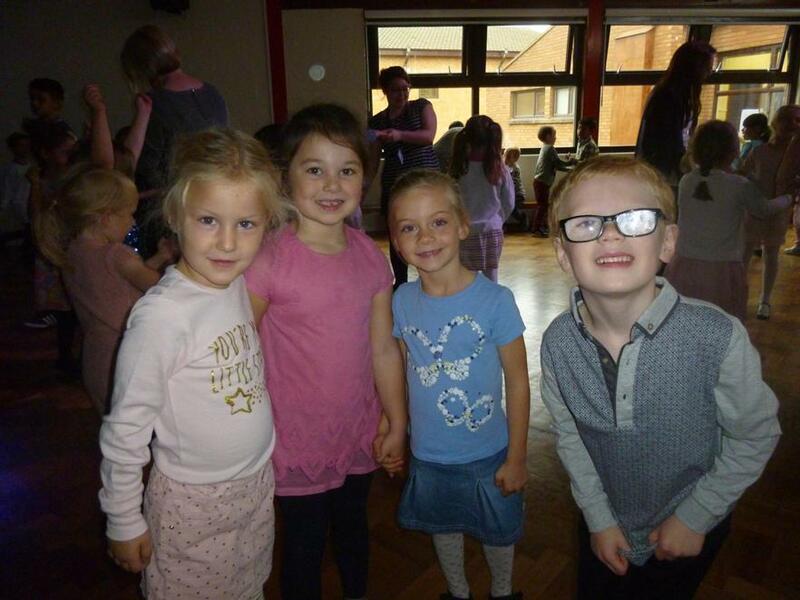 We all wore our best party clothes and enjoyed dancing and meeting Franz and Clara a little more. 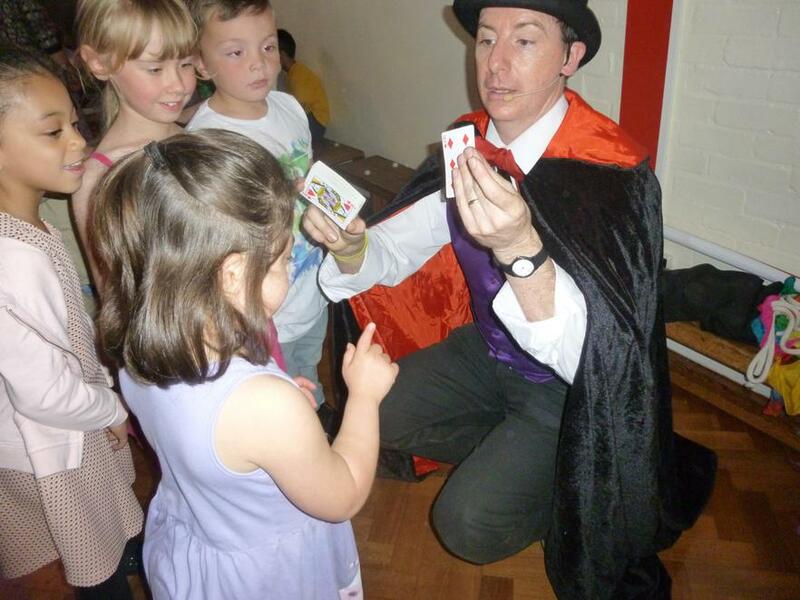 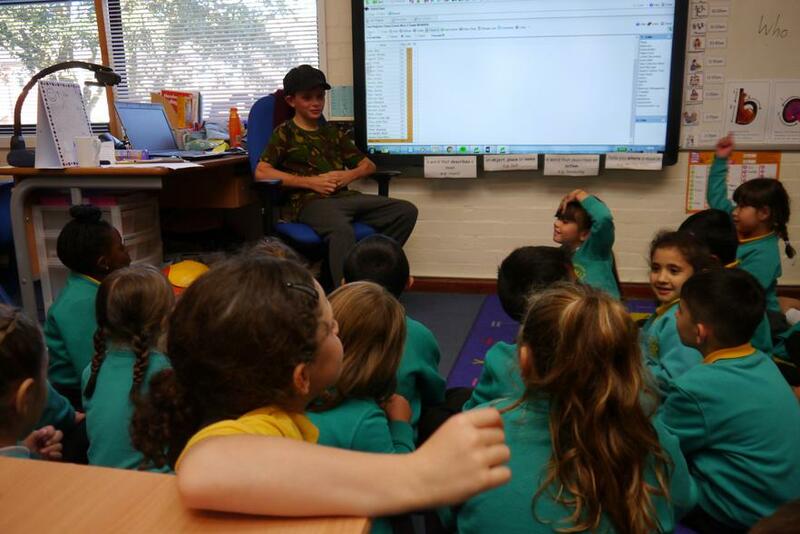 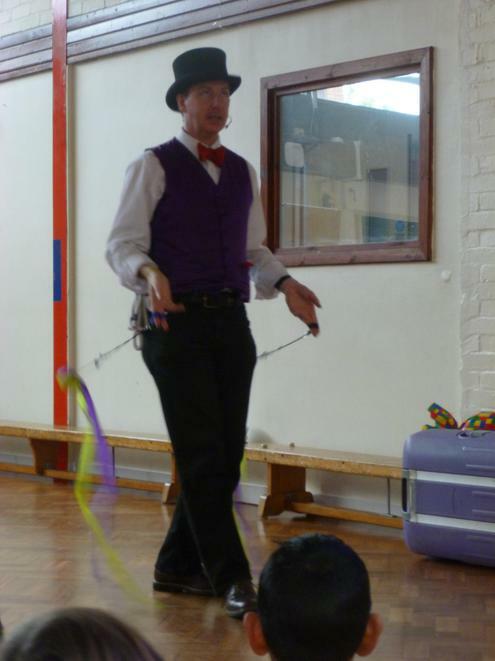 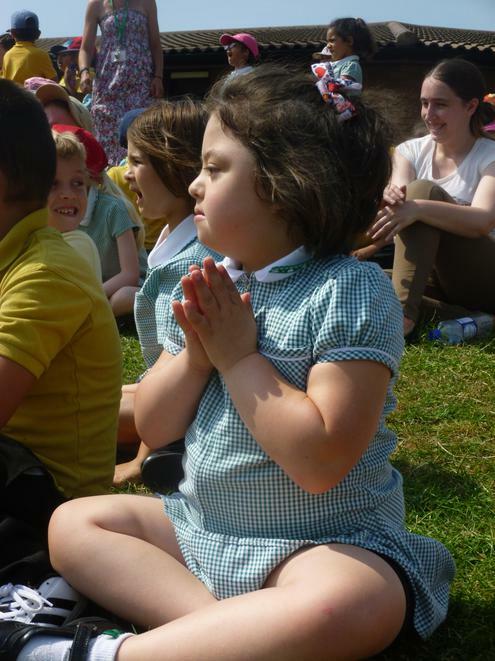 Suddenly, we were all asked to sit down as the magical visitor was at school! 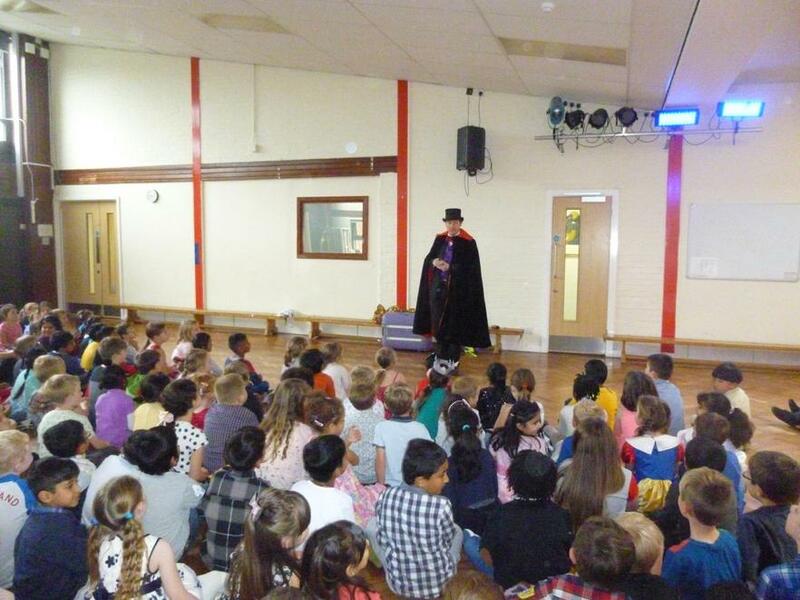 Godfather Drosselmeyer entered wearing a fancy black cape, carrying a mysterious suitcase....take a look at the photographs below to discover his magical talents! 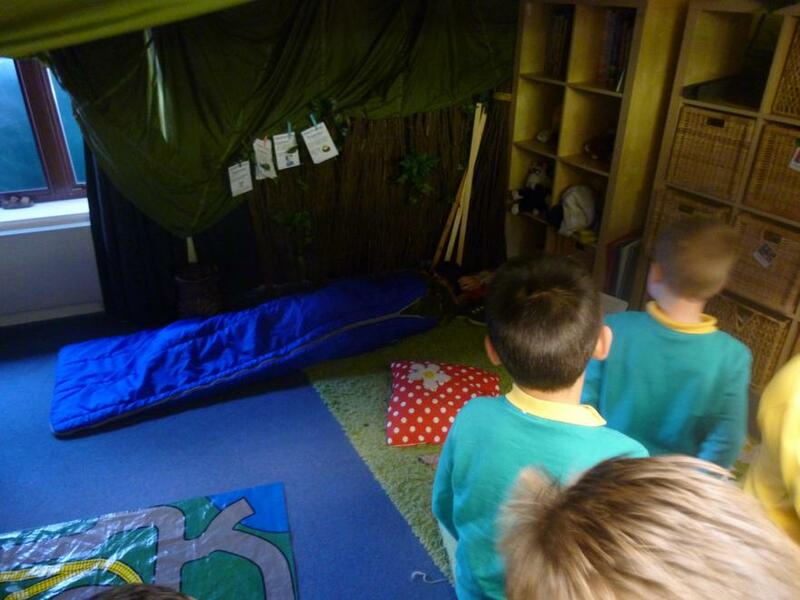 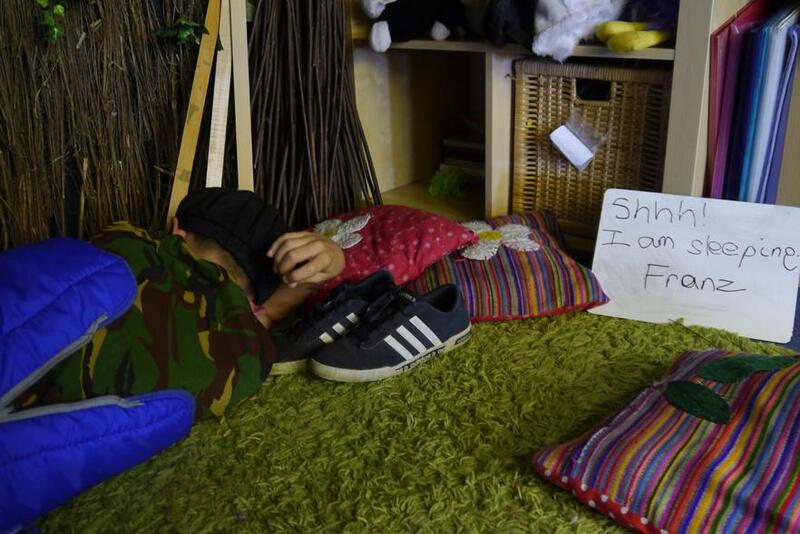 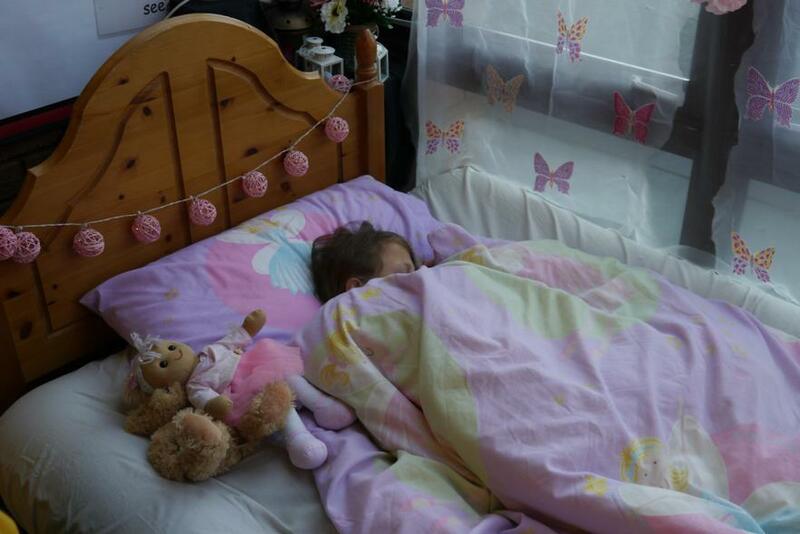 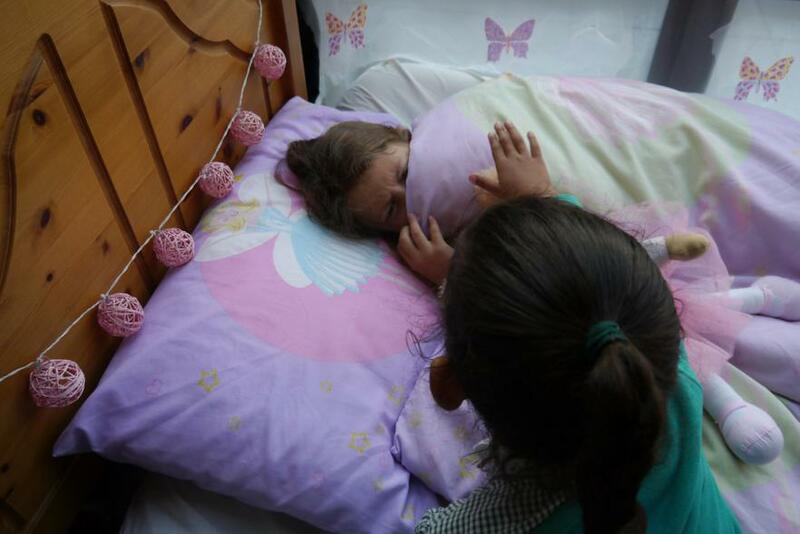 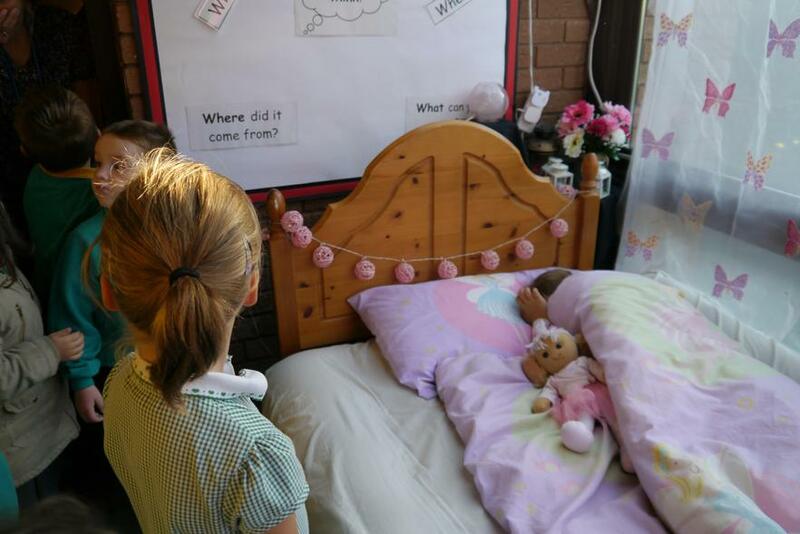 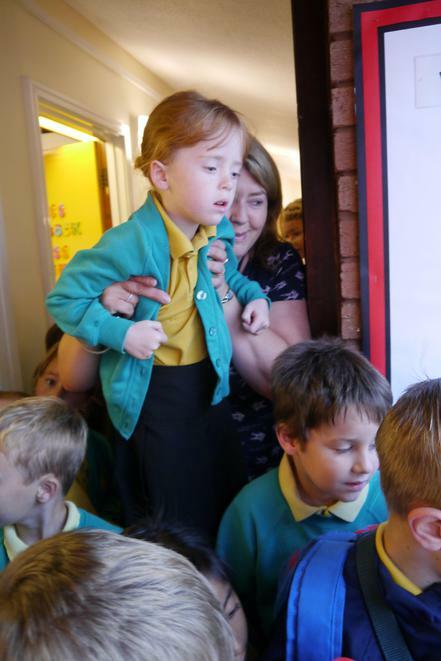 Last Wednesday, we had a very peculiar morning...we found a boy sleeping in the Year 1 den, and a girl sleeping in the Year 2 corridor! 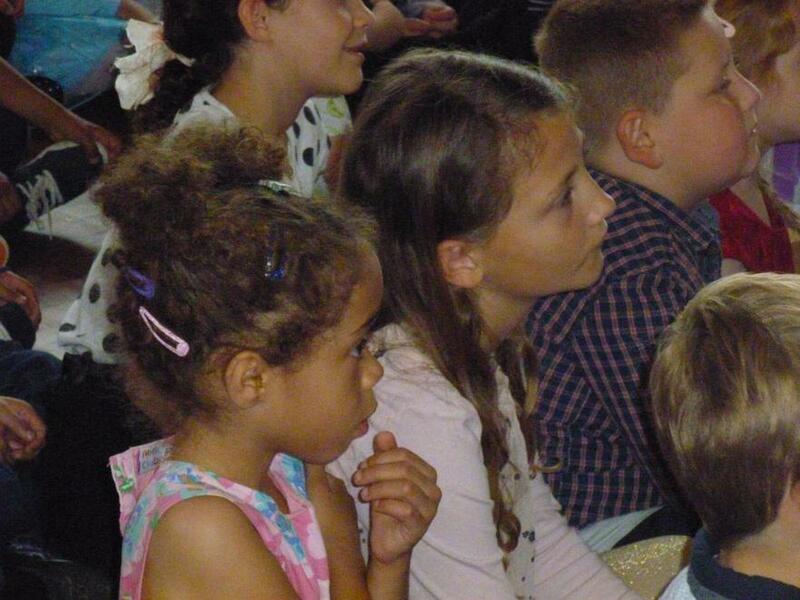 We were all very surprised to see these two new faces and we were anxious to find out exactly who they were. 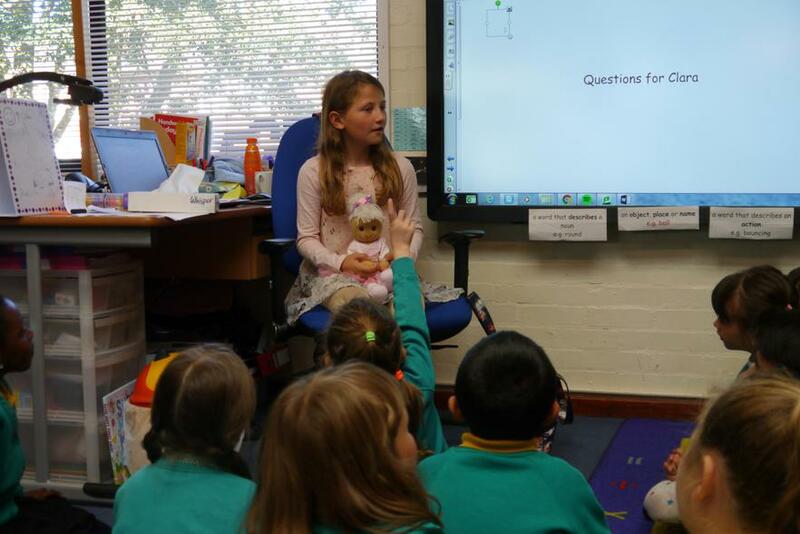 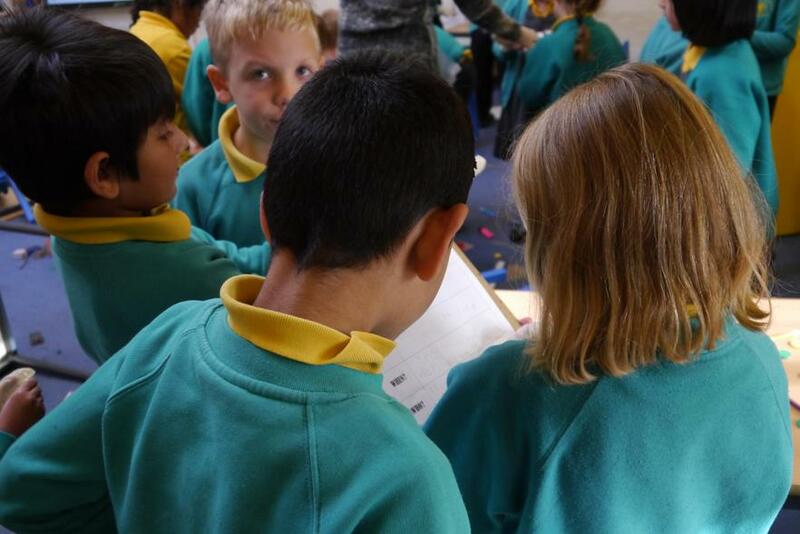 We all had a little visit from the visitors and we asked them lots of interesting questions to find out about them. 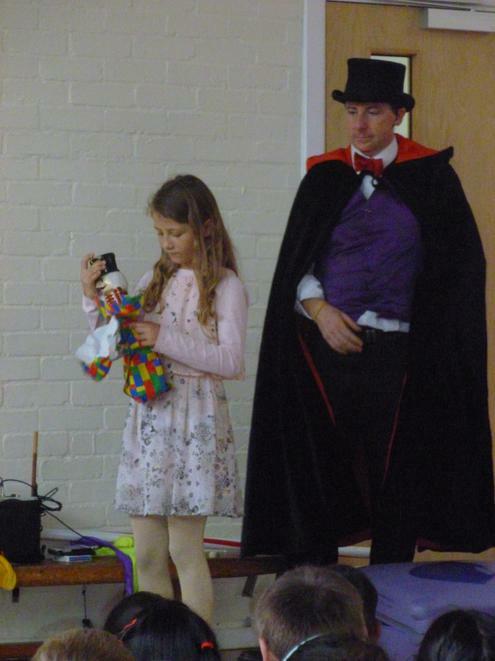 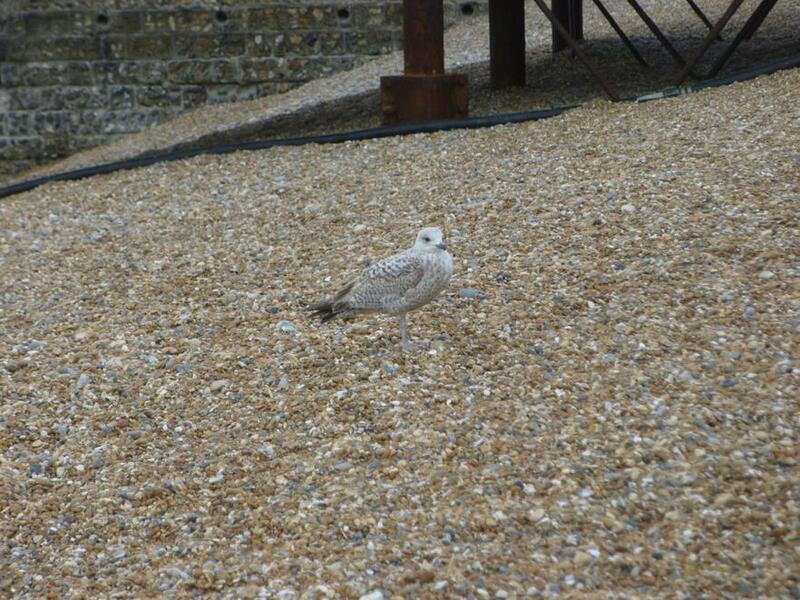 Eventually, we realised that they were Franz and Clara! 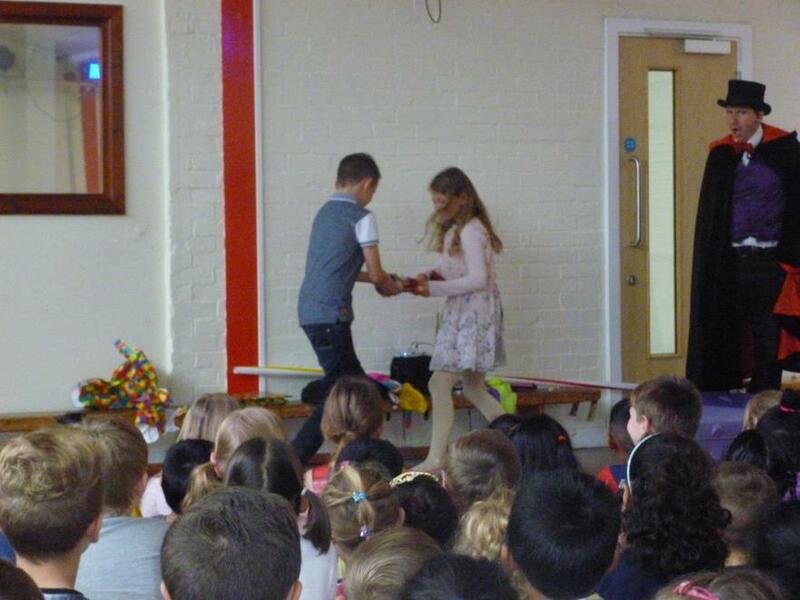 Thank you for all your money donations and consent forms. 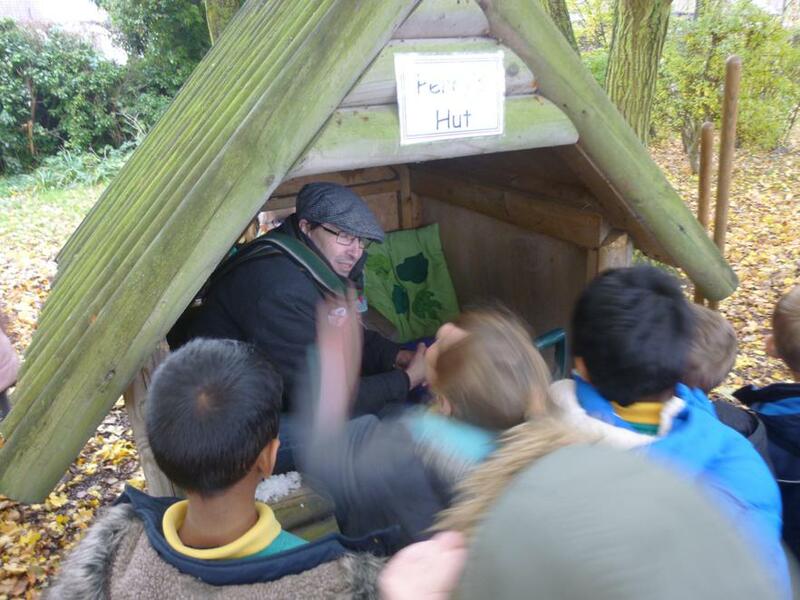 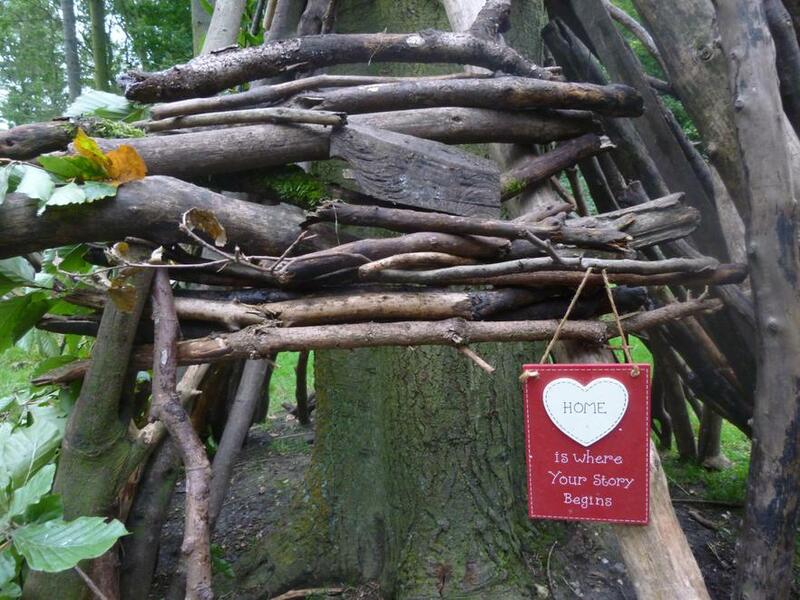 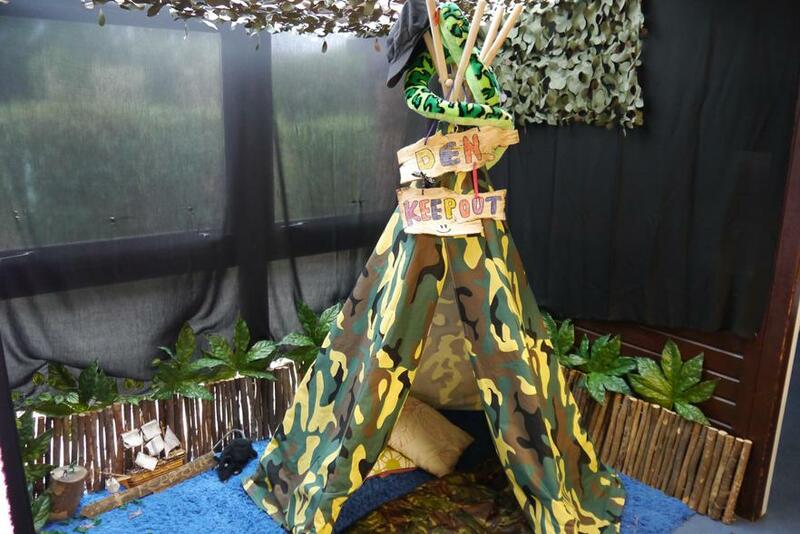 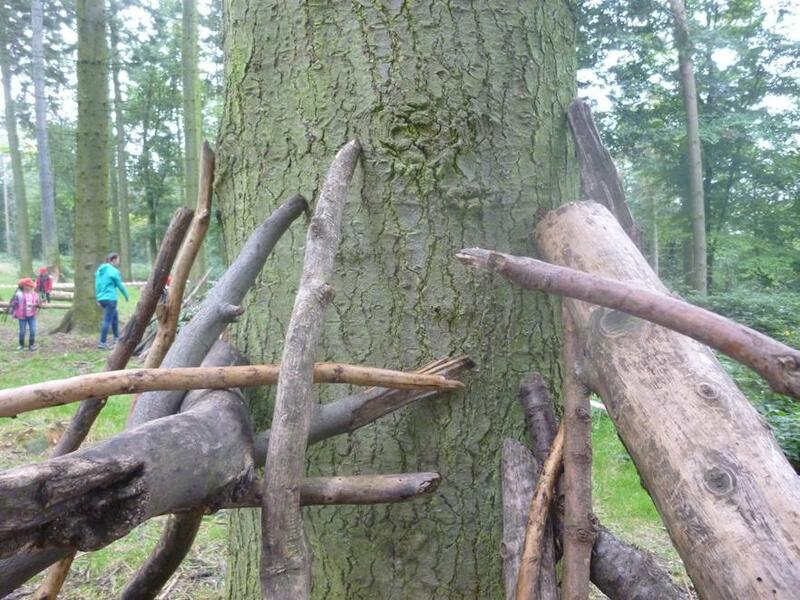 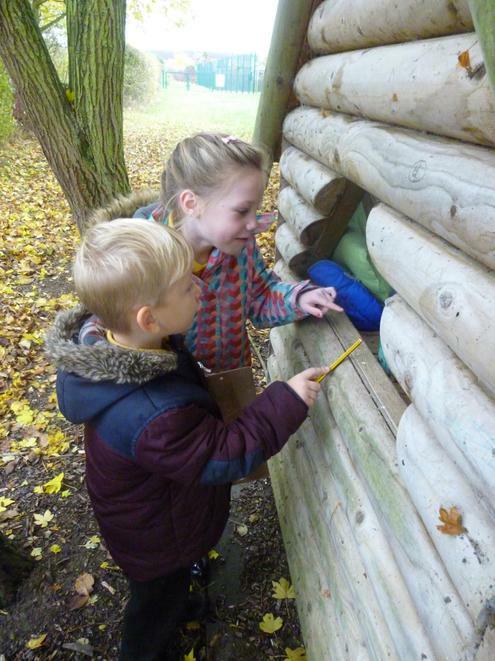 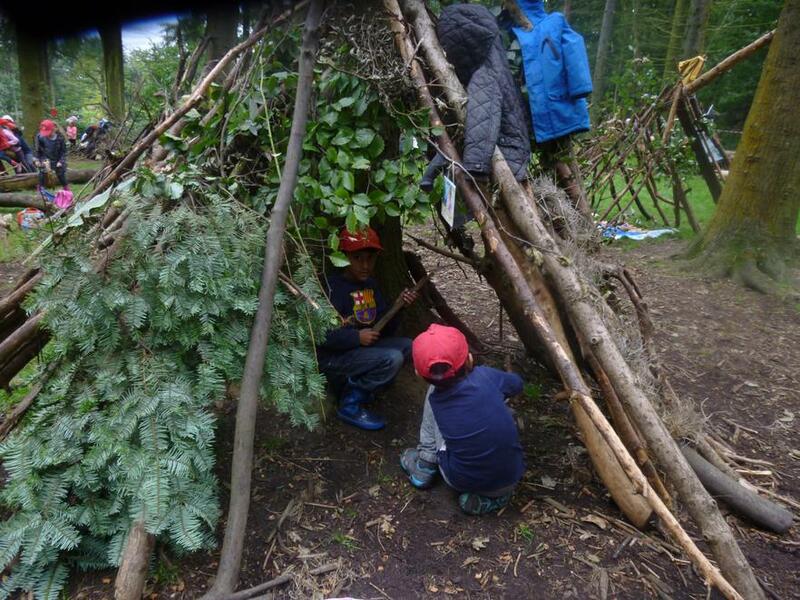 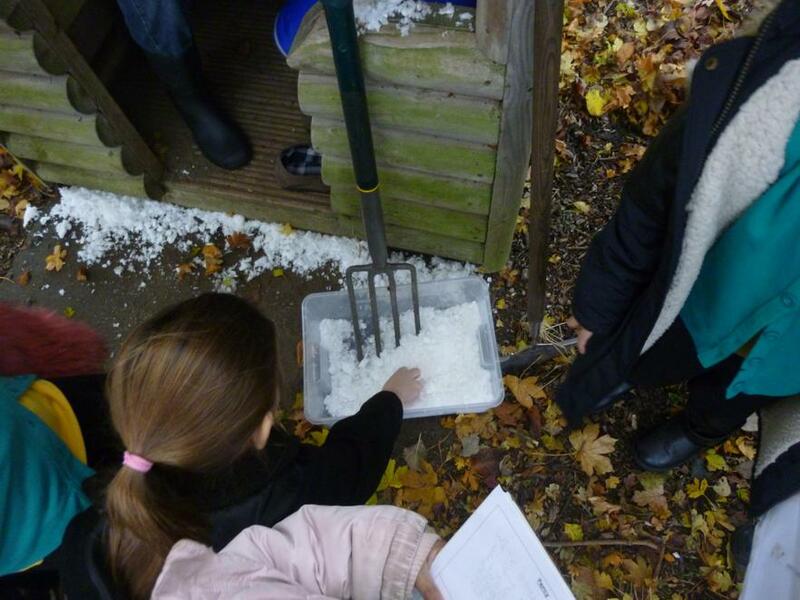 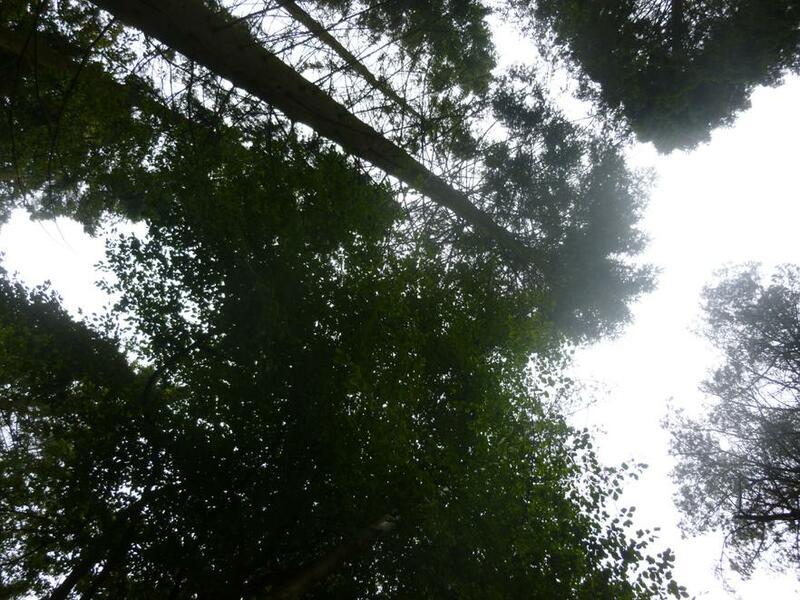 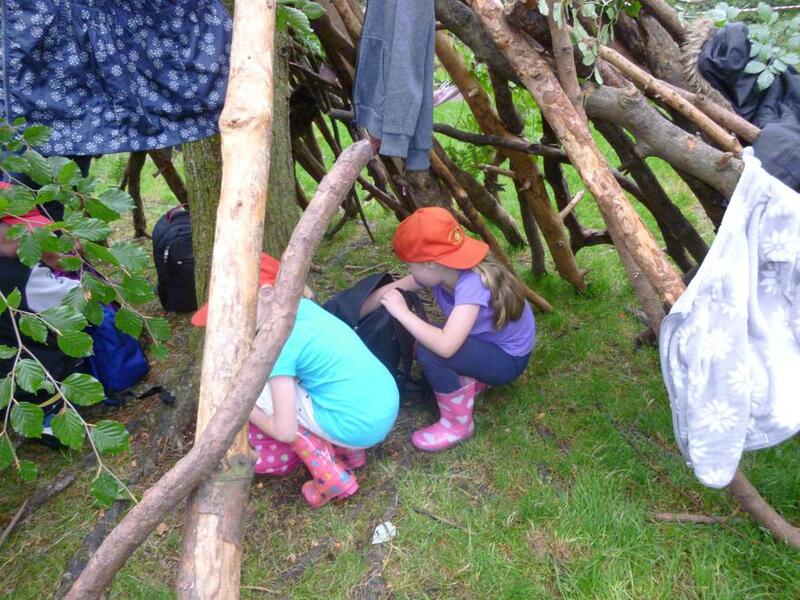 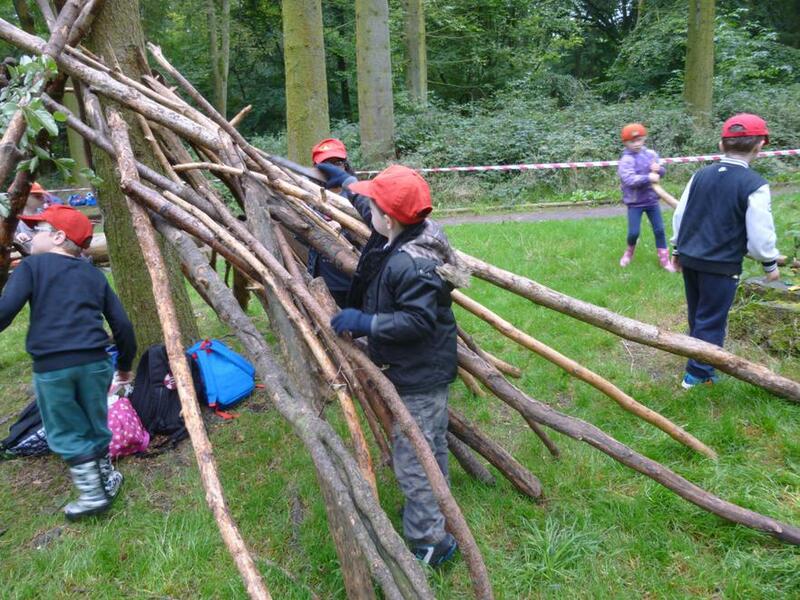 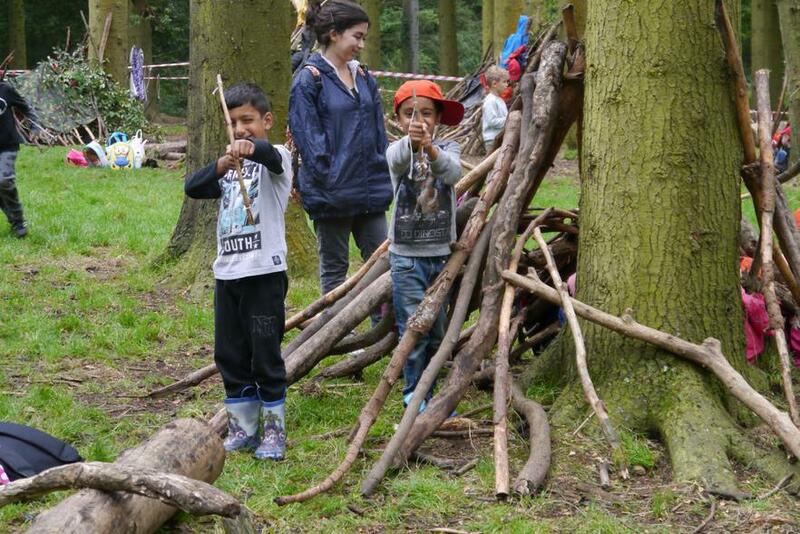 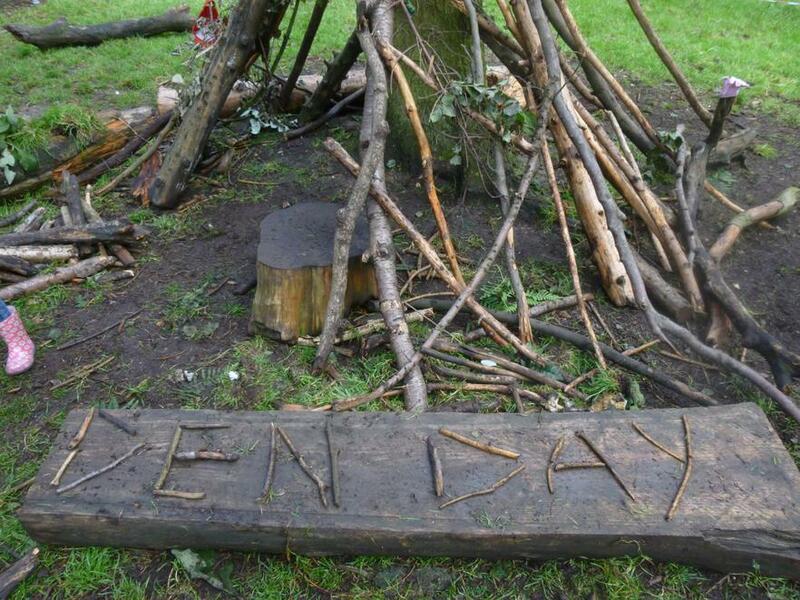 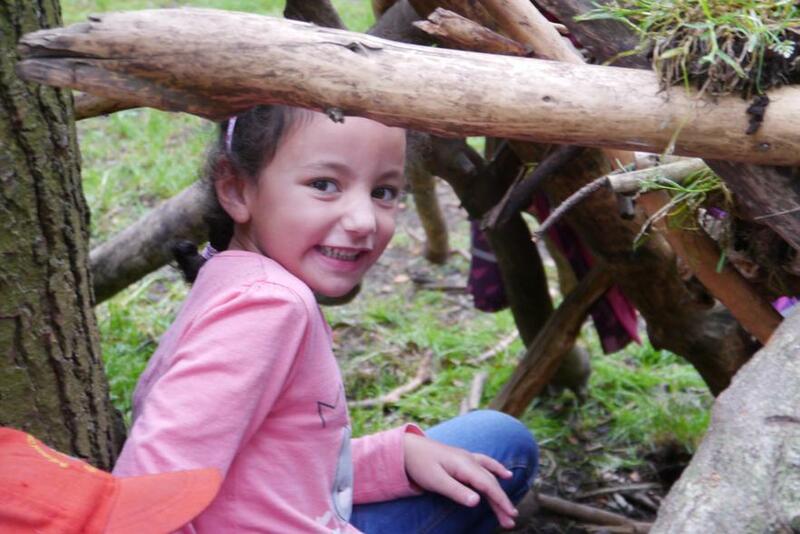 Year 1 and 2 enjoyed their trip to Wendover Woods to den builds and explore! 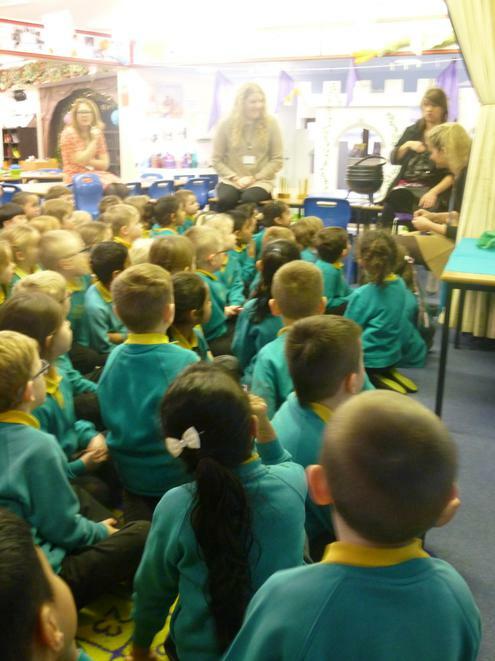 Year 2 went on Monday 19th September and Year 1 on Tuesday 20th September. 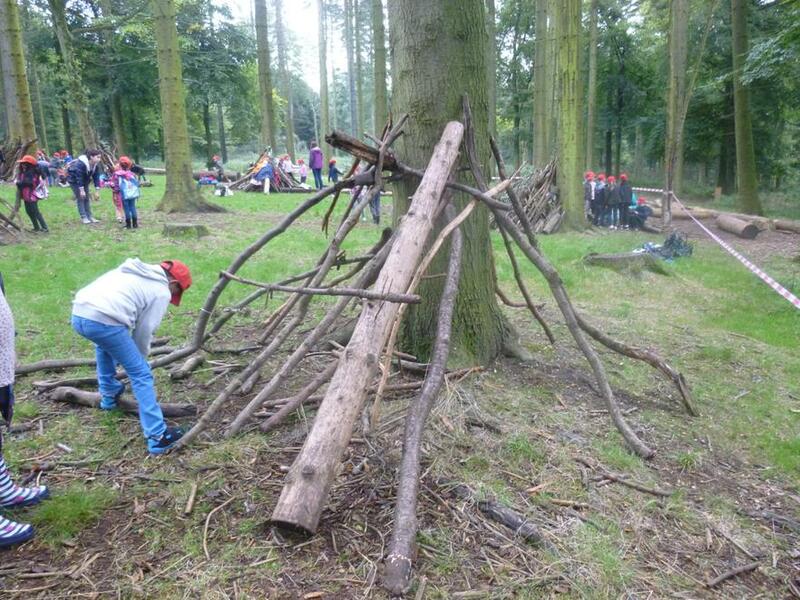 Please have a look at some of the photographs from the two days. 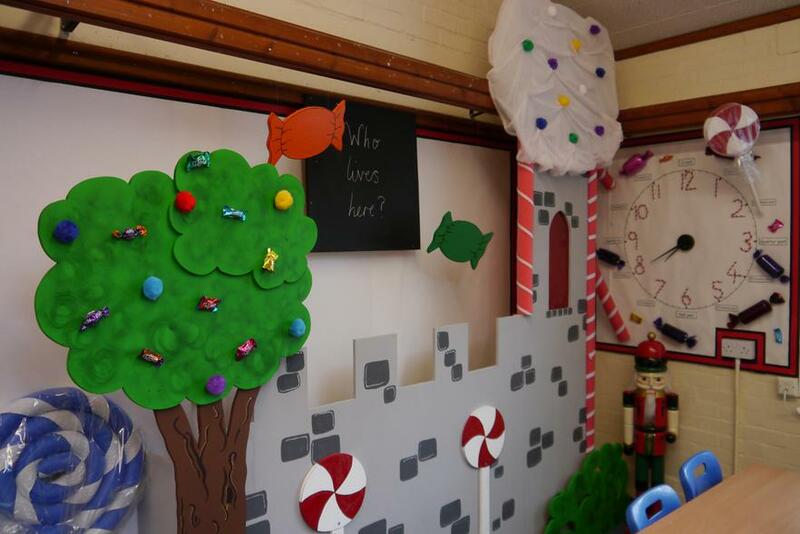 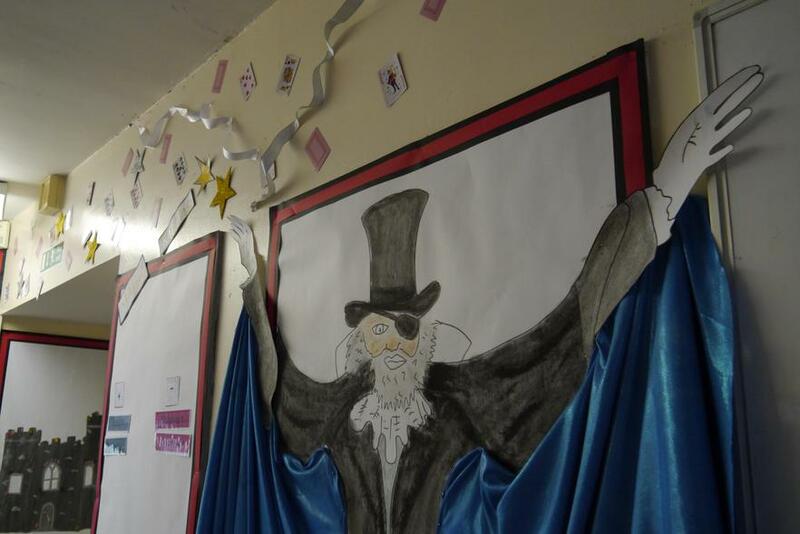 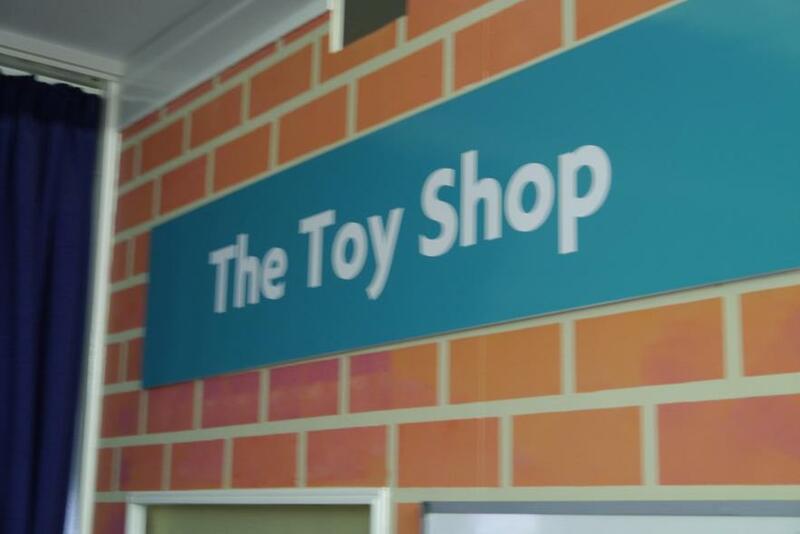 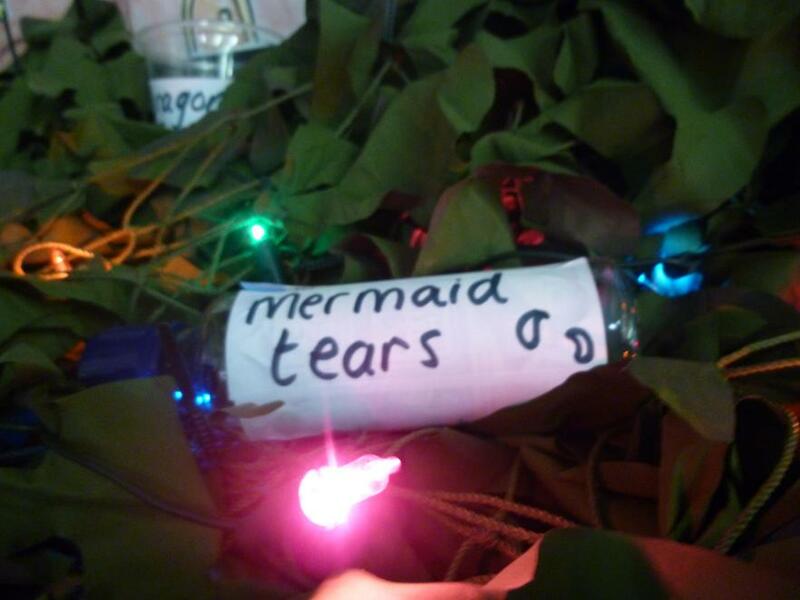 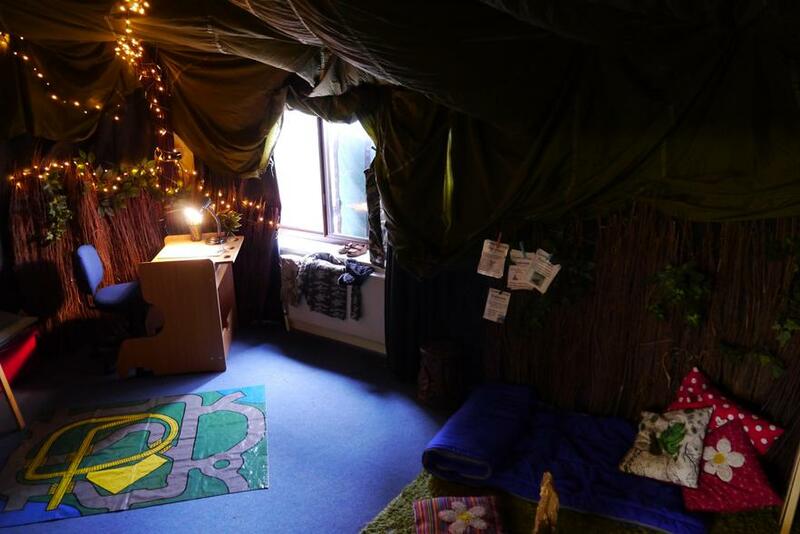 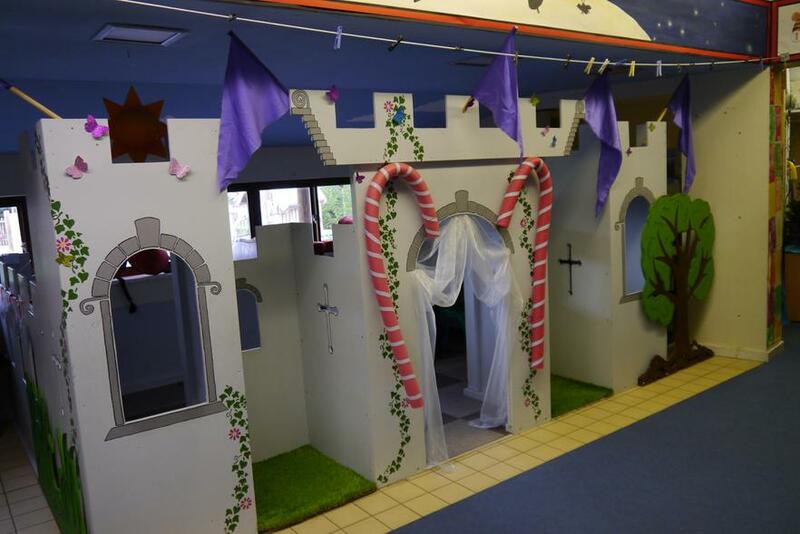 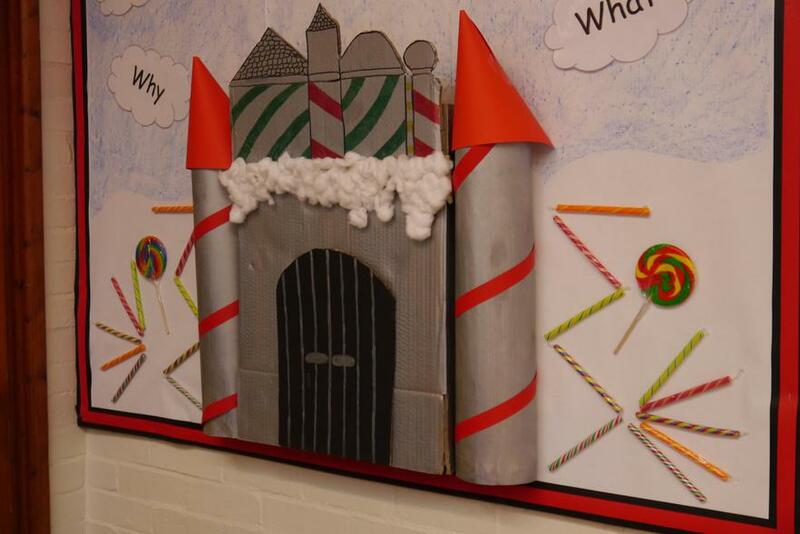 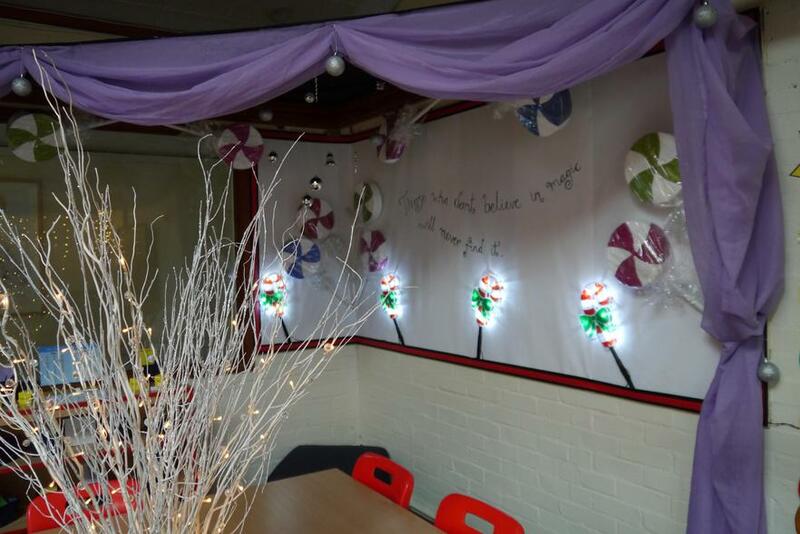 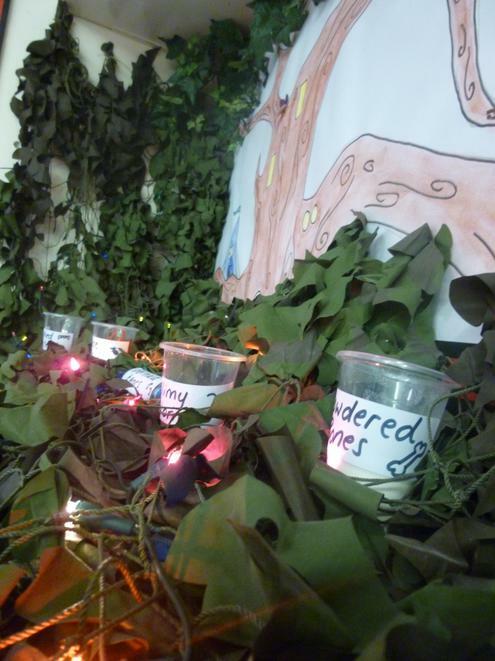 The department has been transformed into lands of sweets, dens, magic shops and much more! 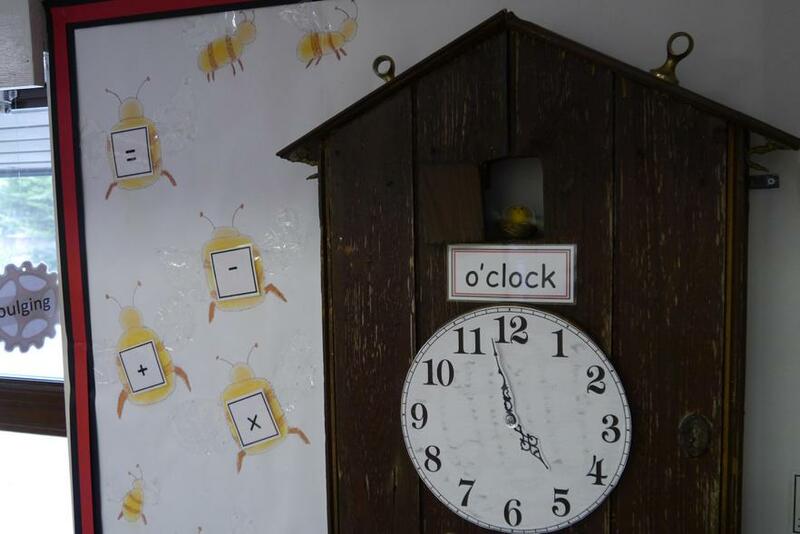 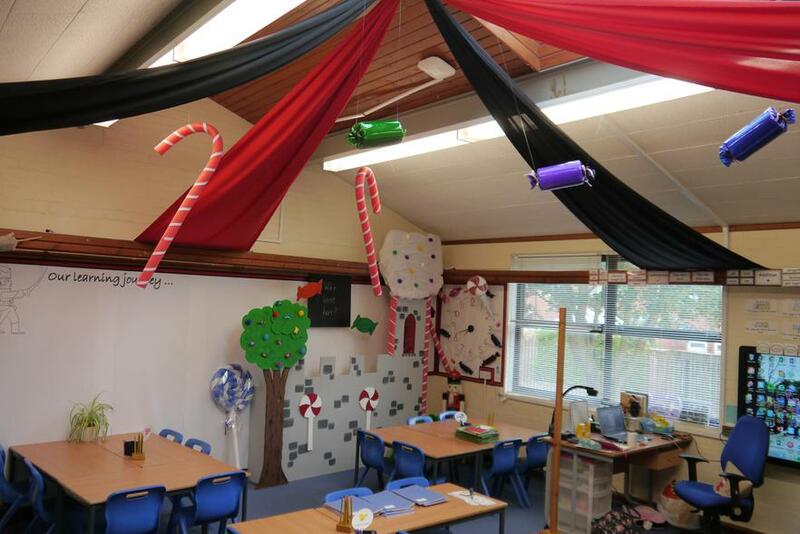 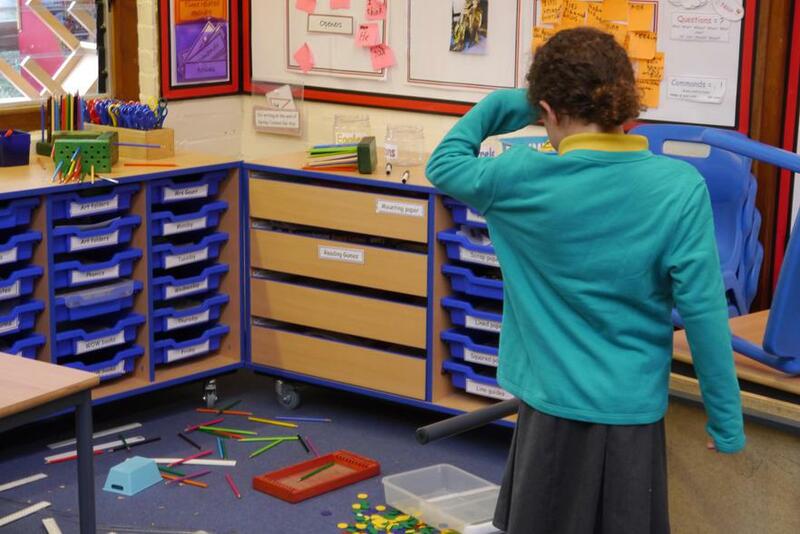 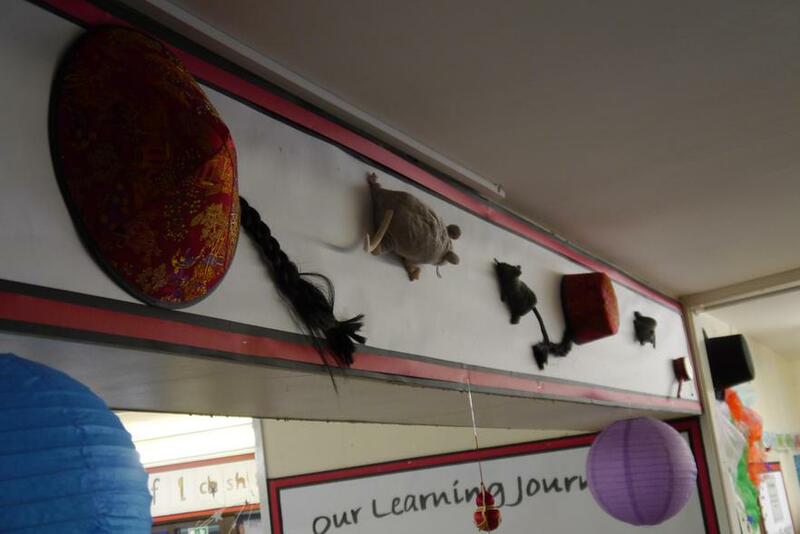 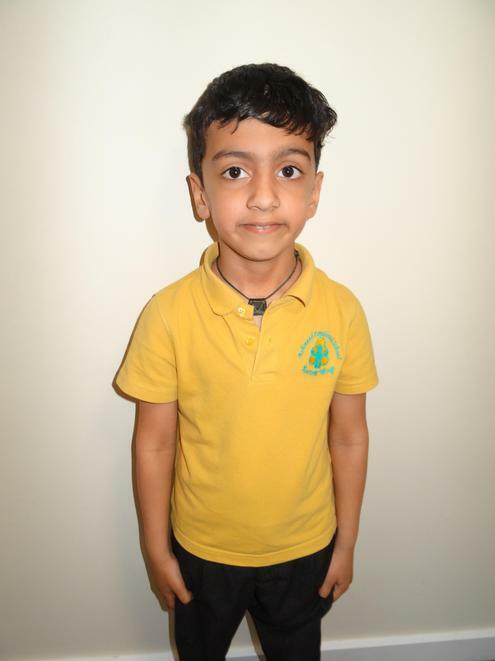 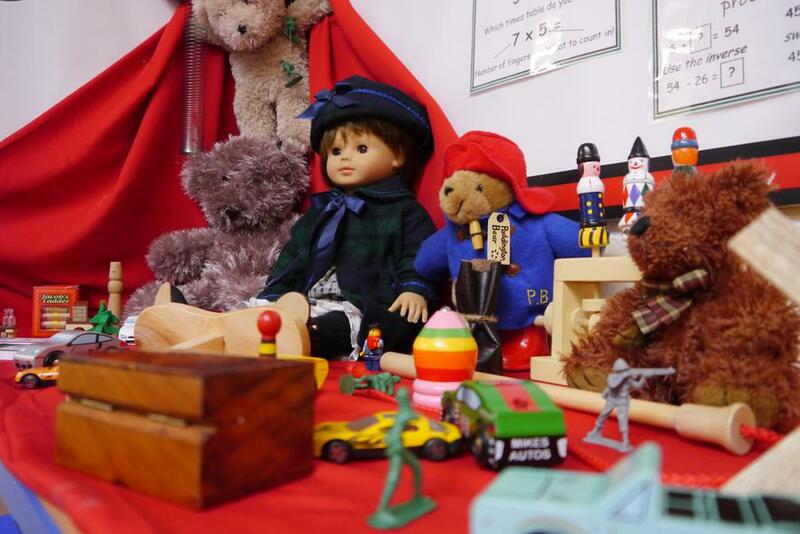 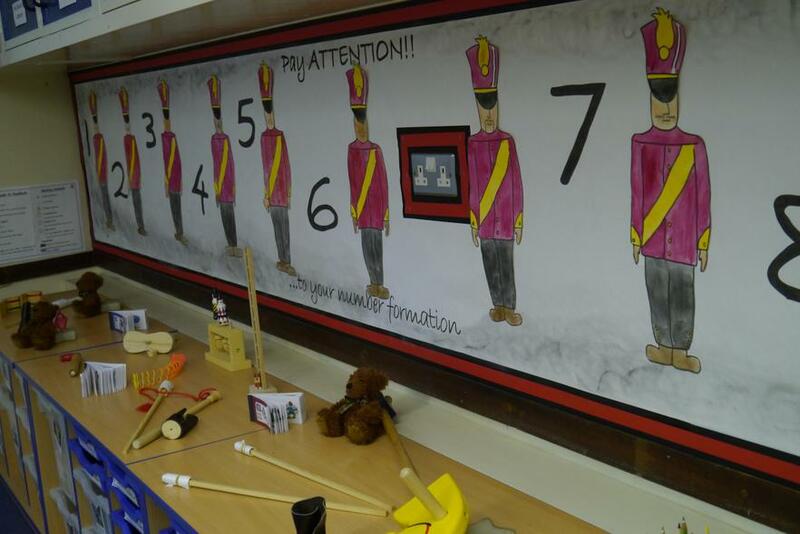 Have a look at the photographs of your child's classrooms. 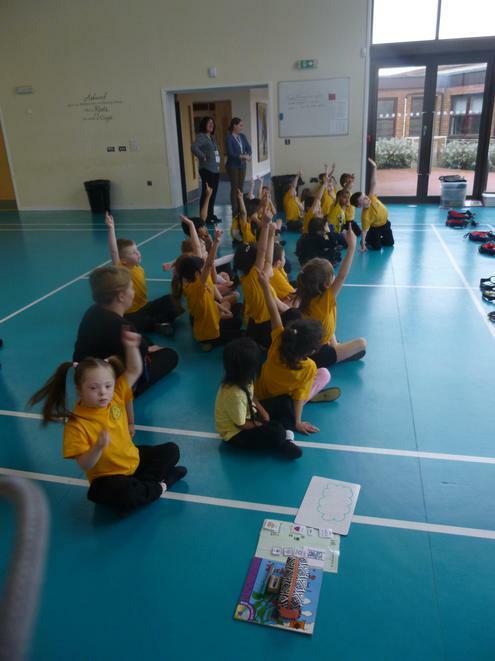 Go Noodle! 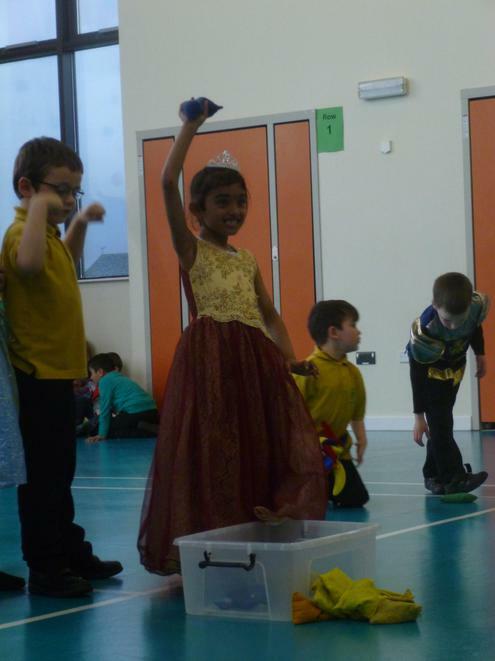 Log in to create your own monster and complete the activities at home through Dance and Zumba! 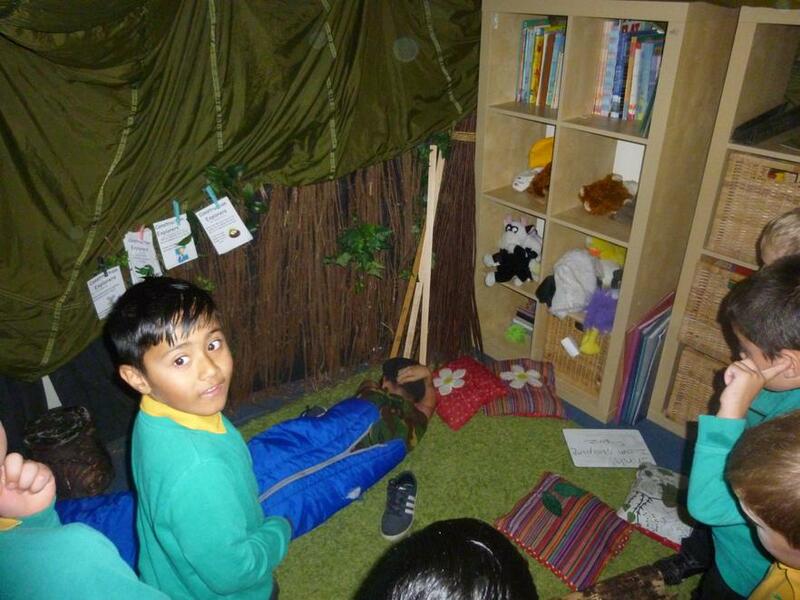 Bug Club Log in to your Bug Club to read books, plays and comics and answer fun questions to recieve points. 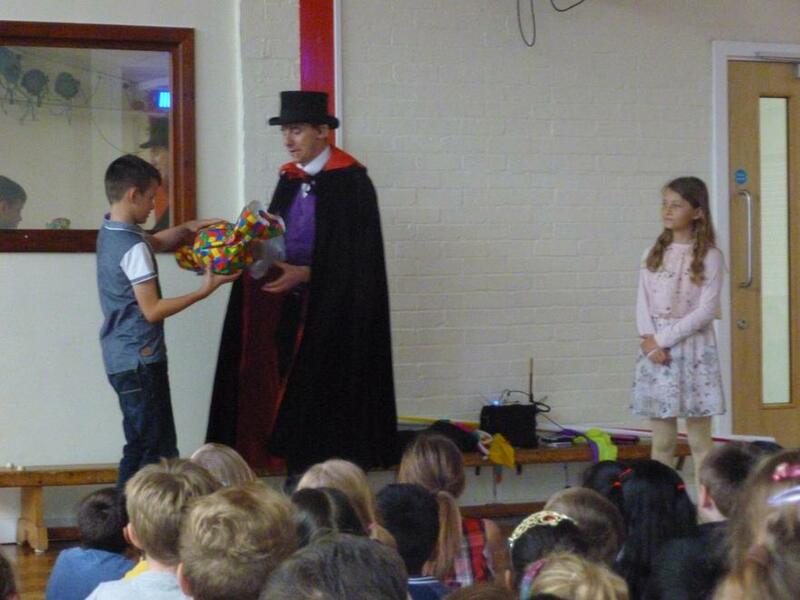 Points mean prizes!